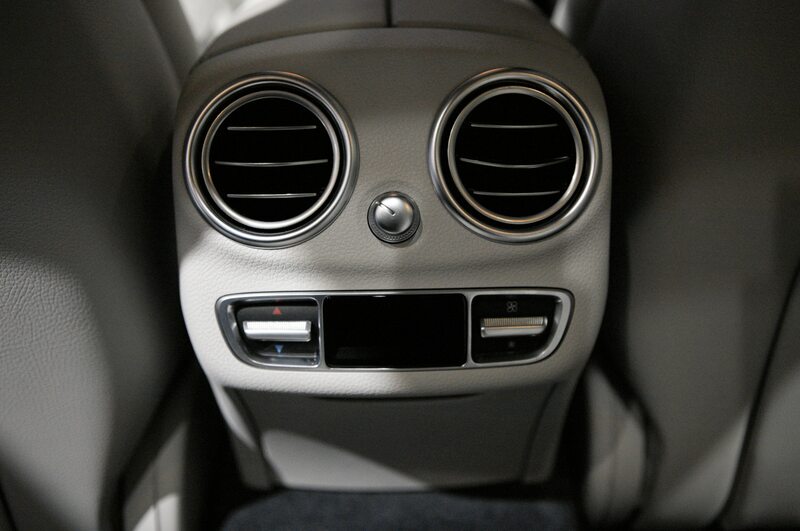 It’s rare for automakers to surprise us, save for the occasional announcement that they’ve secretly been compromising our safety or health. 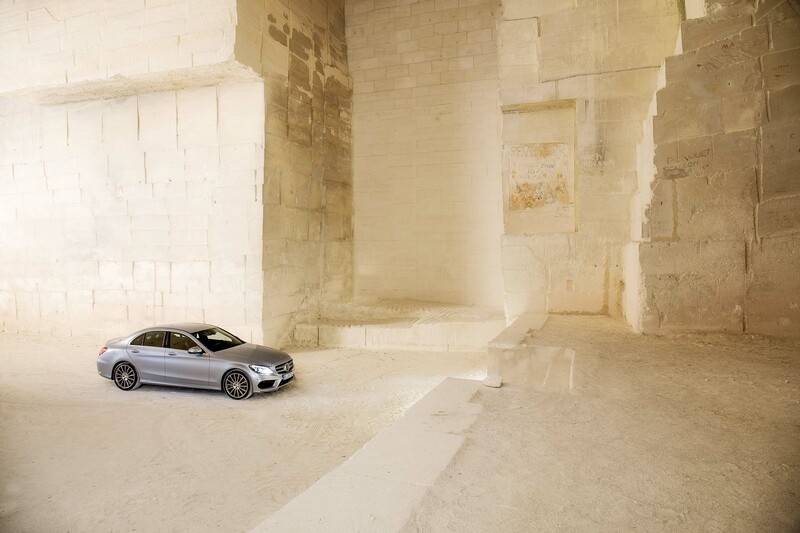 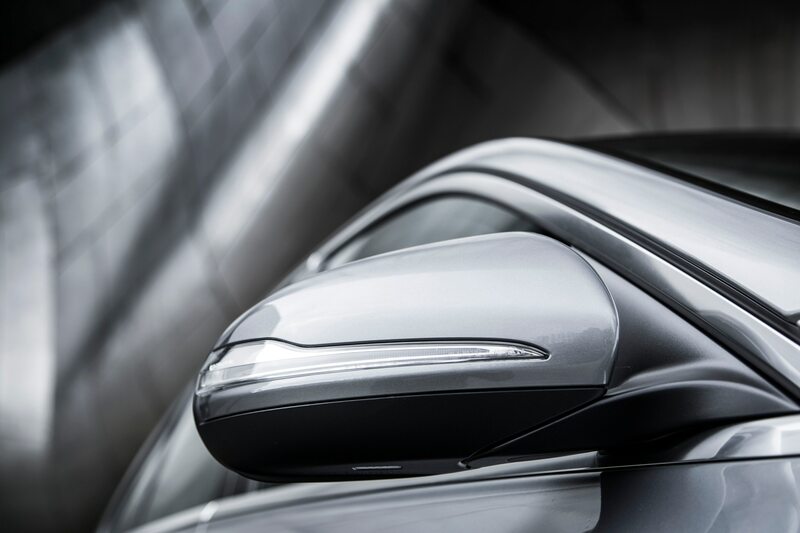 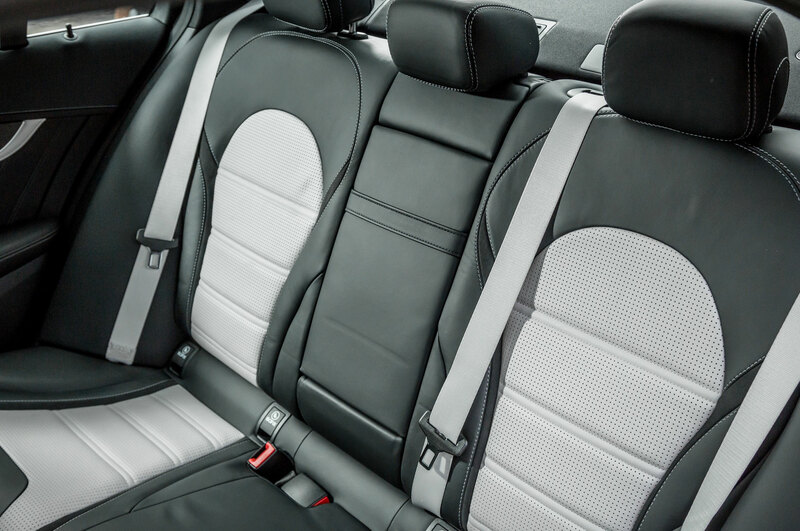 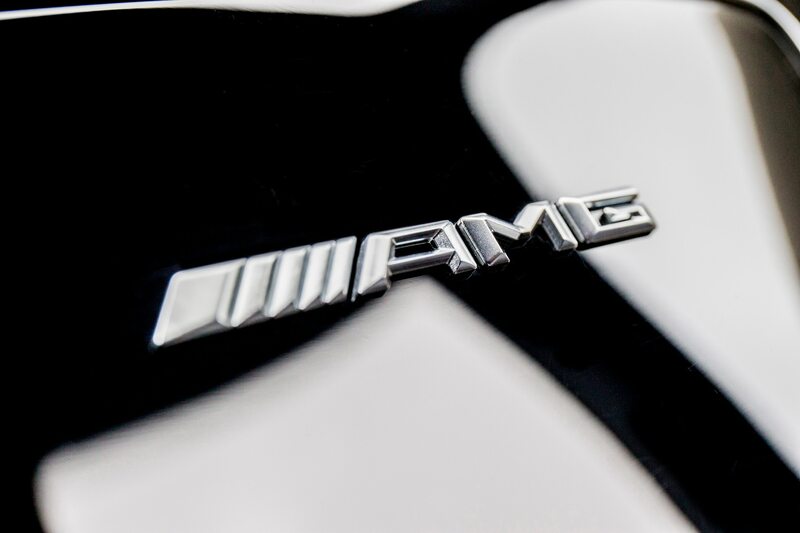 Brands are so entrenched and the car buying market is so finely segmented that hardly anyone is willing to rock the boat intentionally with an unexpected product. 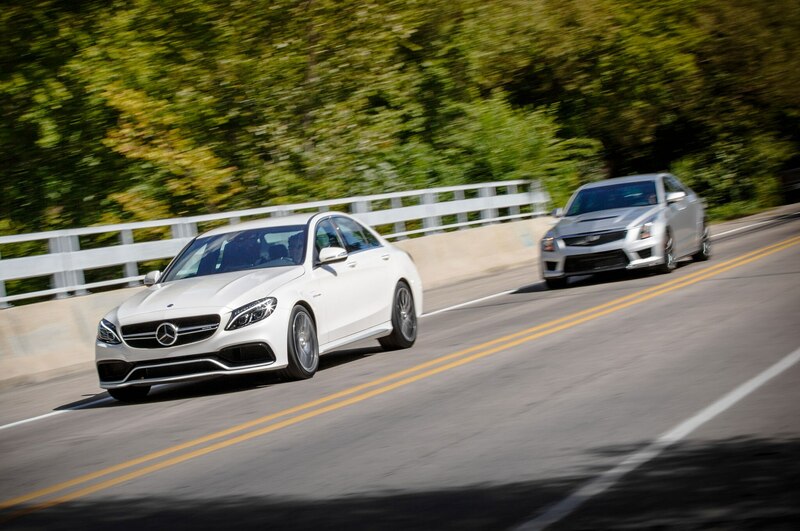 That’s what’s so awesome about the Mercedes-AMG C63 S and Cadillac ATS-V. No one had any right to think these stuffy old brands, best known for large luxury barges, would pour precious profits into small performance cars. 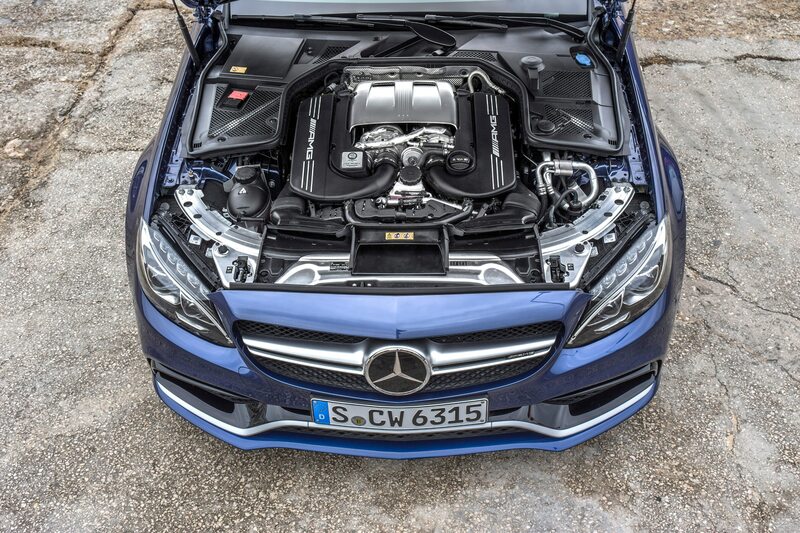 Yet here those cars are, producing just shy of 1,000 combined horsepower. 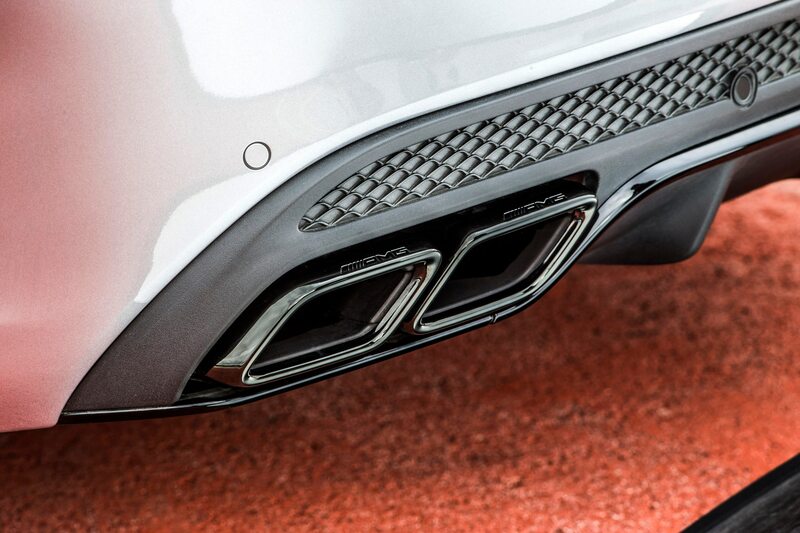 With apologies to Kia, this is what we’d call the power to surprise. 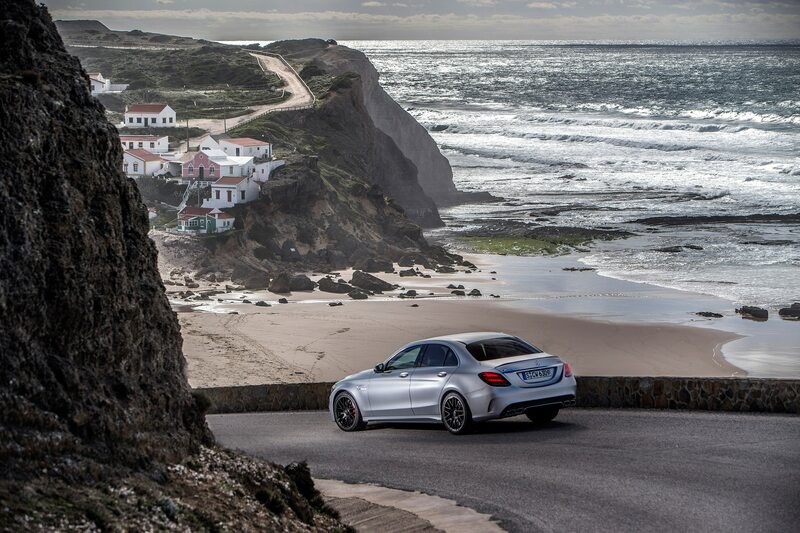 But which of these surprises is more pleasant? 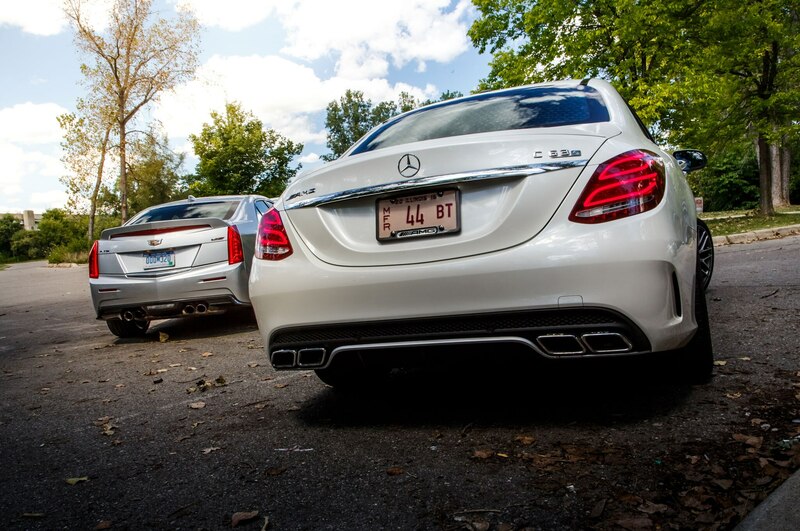 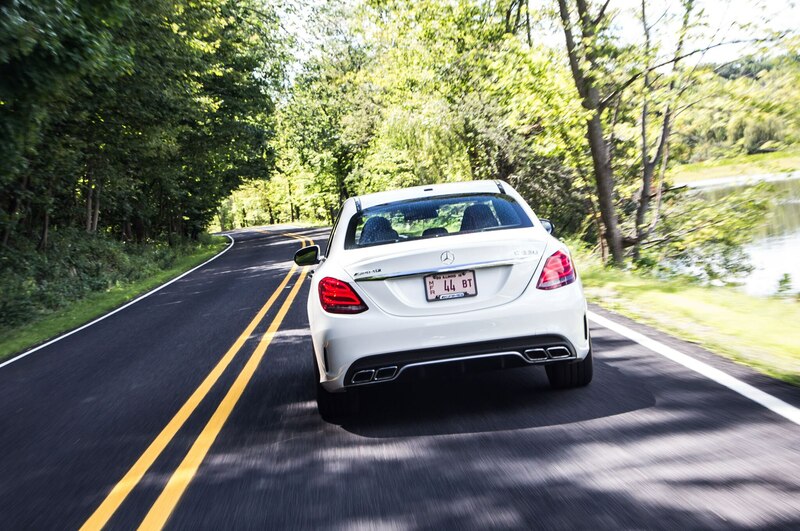 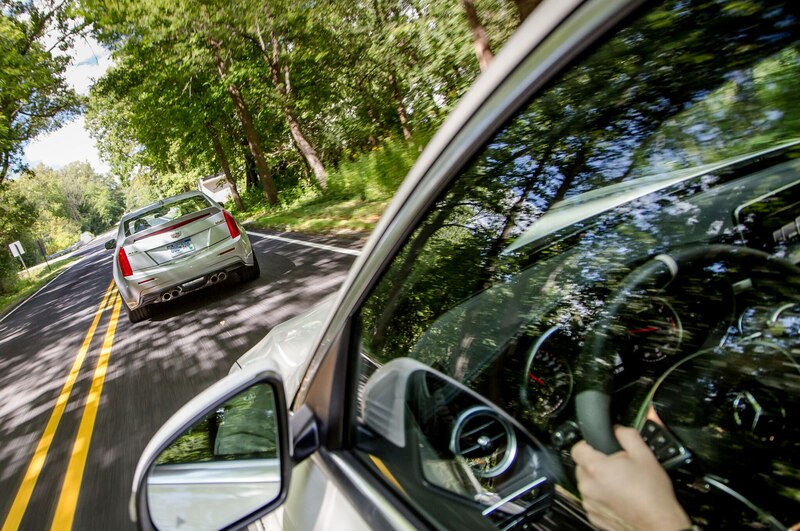 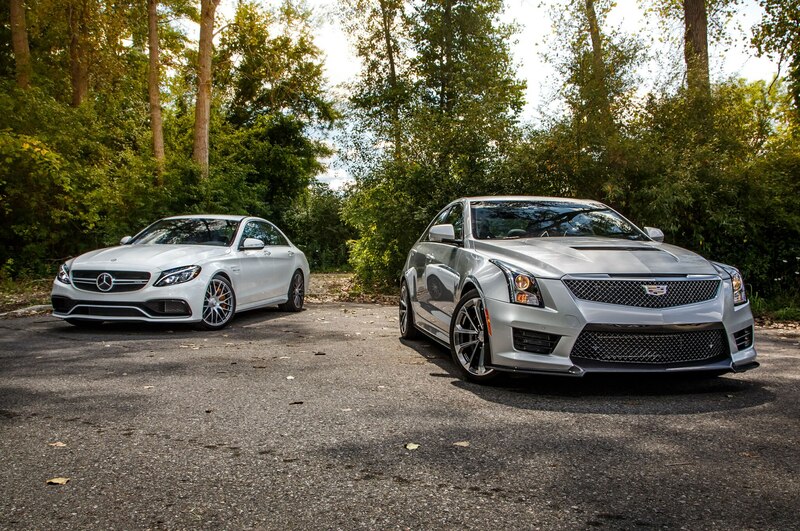 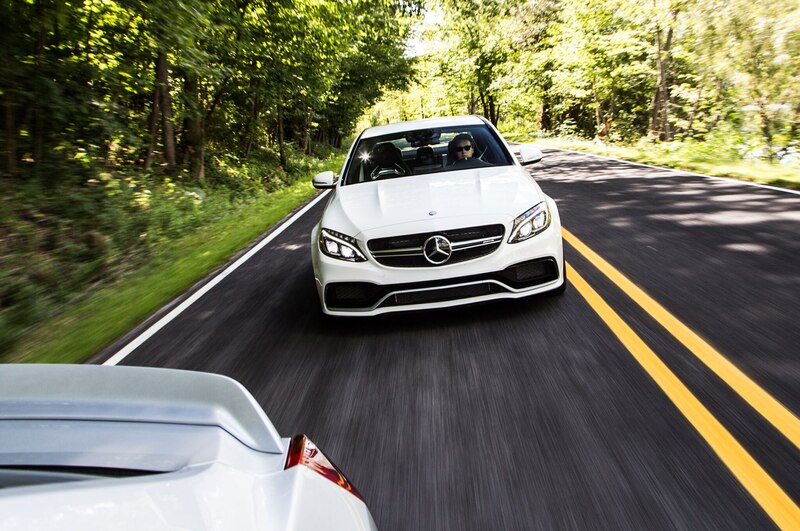 To determine that, we spent a week with a 2015 Mercedes-AMG C63 S and 2016 Cadillac ATS-V, including an afternoon at Gingerman Raceway in Southwest Michigan. 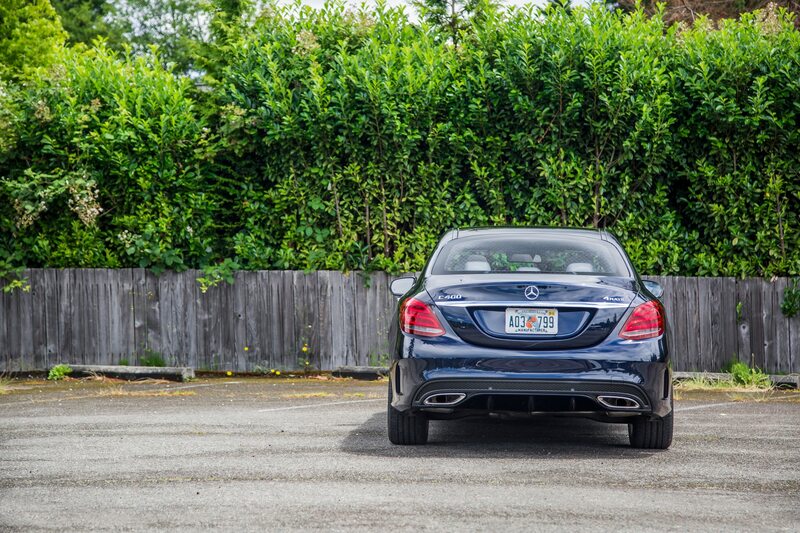 Both cars send clear messages from 50 yards away. 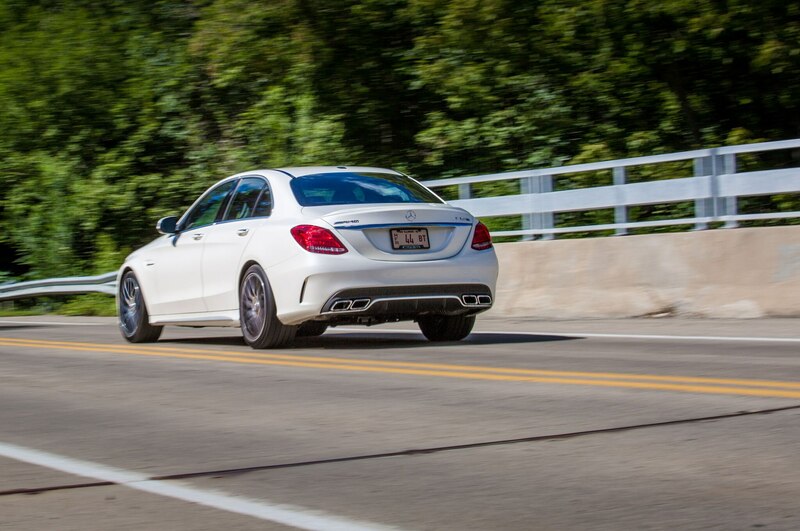 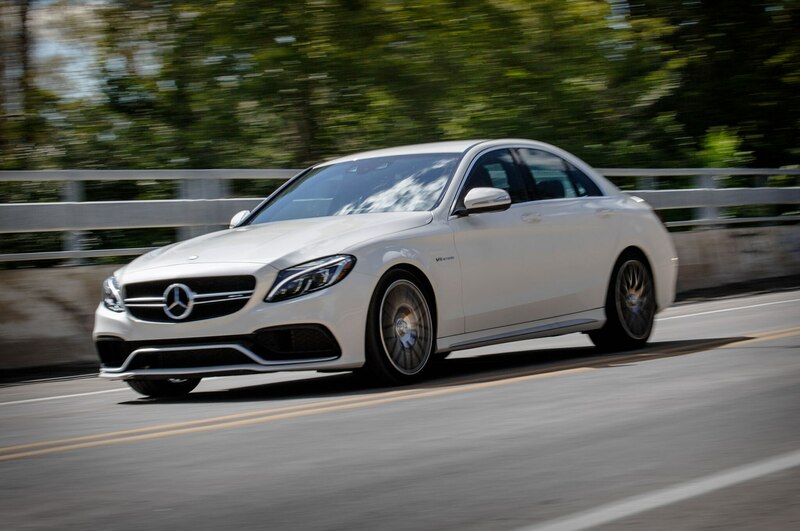 The burly Mercedes-AMG C63 projects all the raw magnetism and violent intent of Tony Soprano. 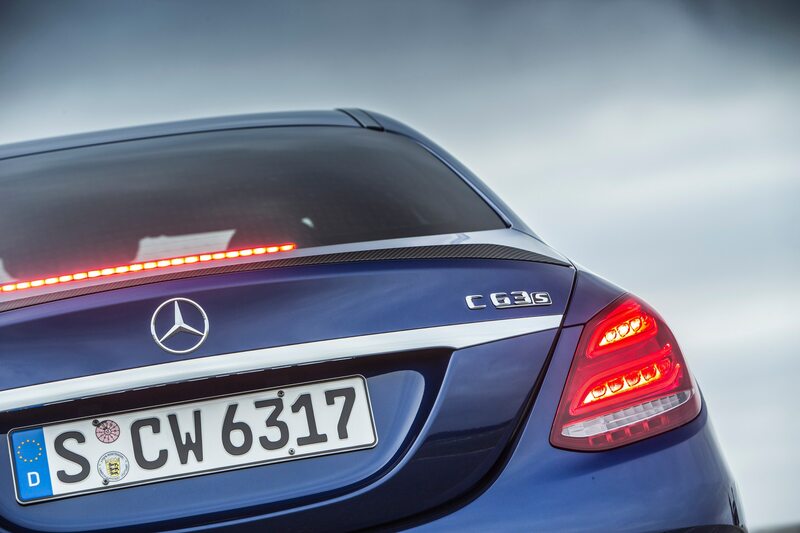 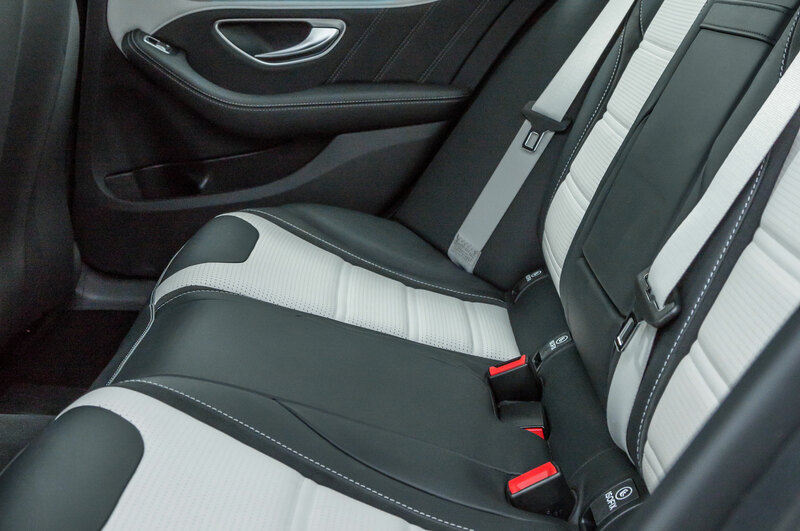 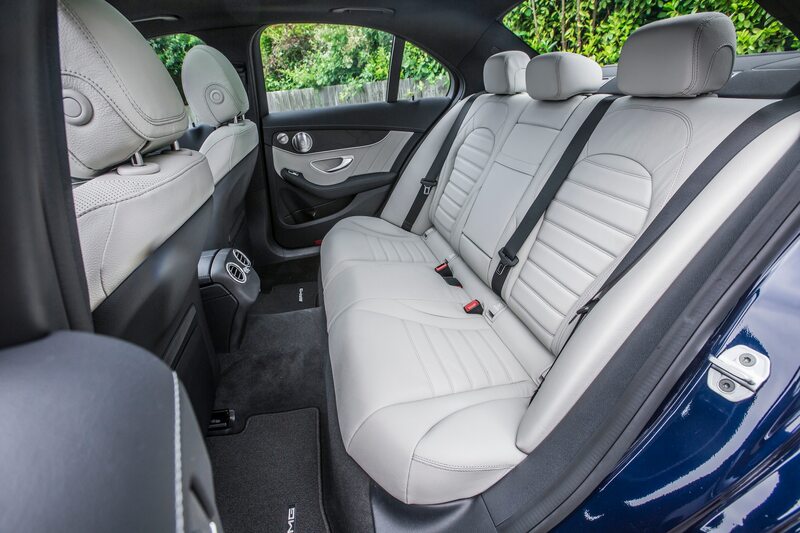 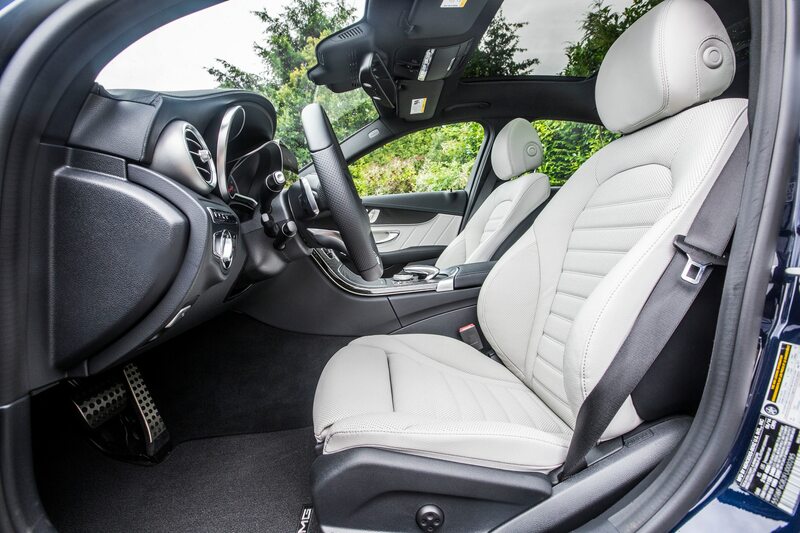 The flowing yet forceful styling language developed for the CLS-Class and S-Class works brilliantly here, channeling subdued aggression without the need for boy-racer add-ons. 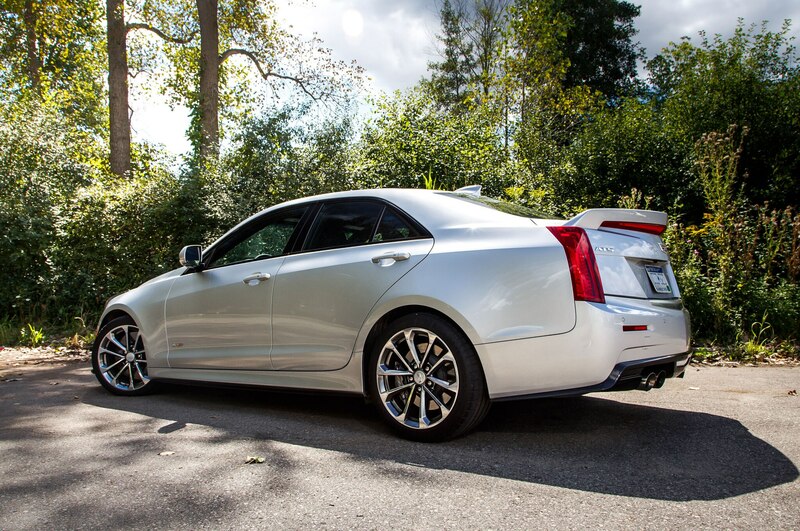 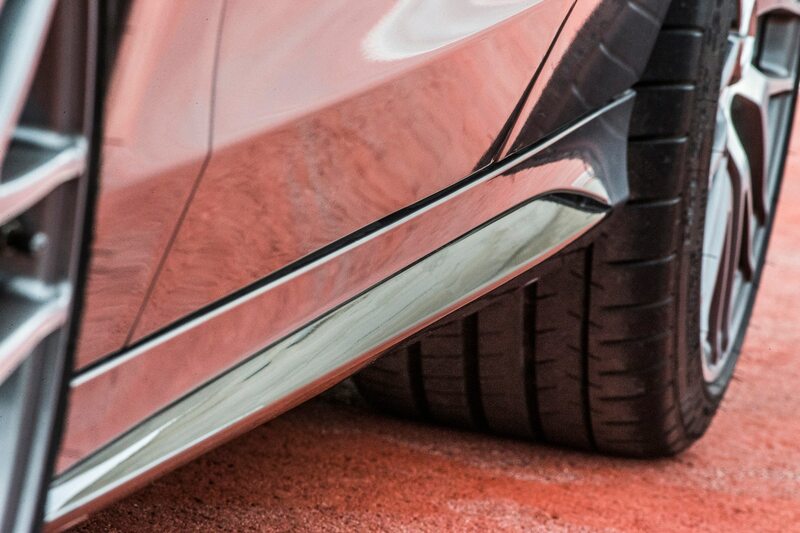 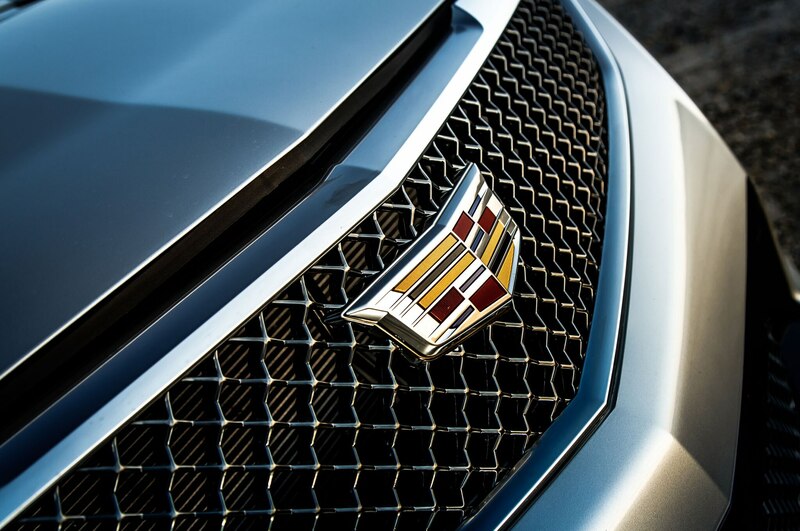 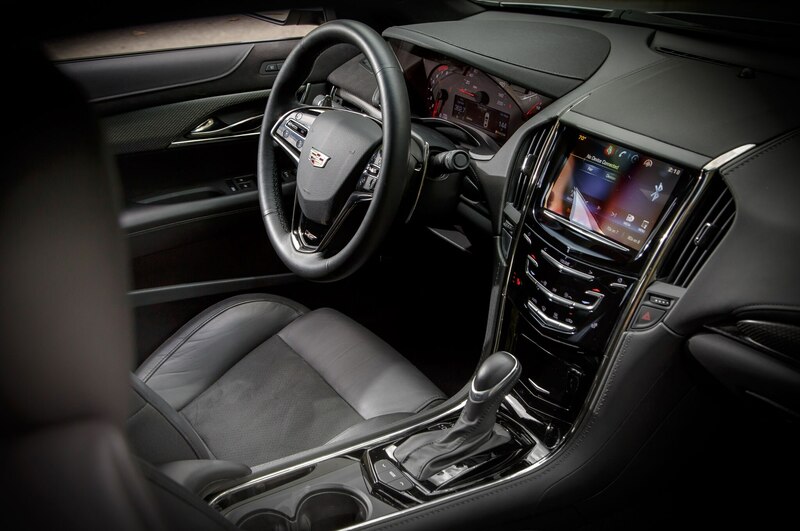 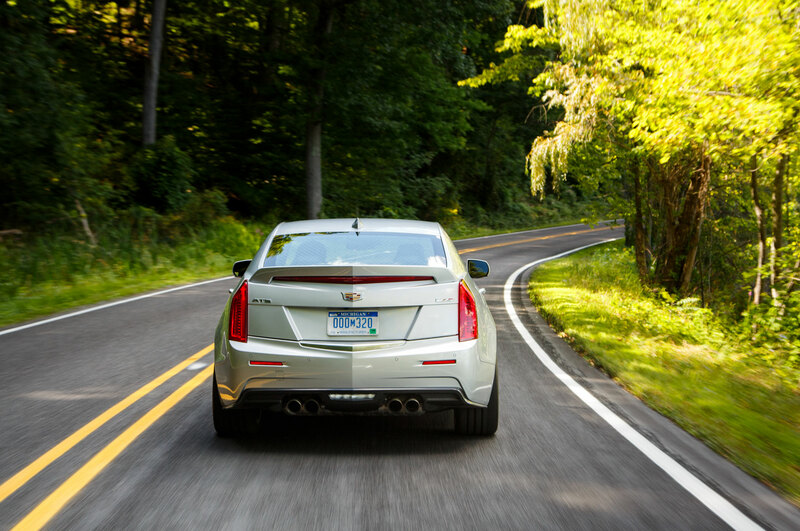 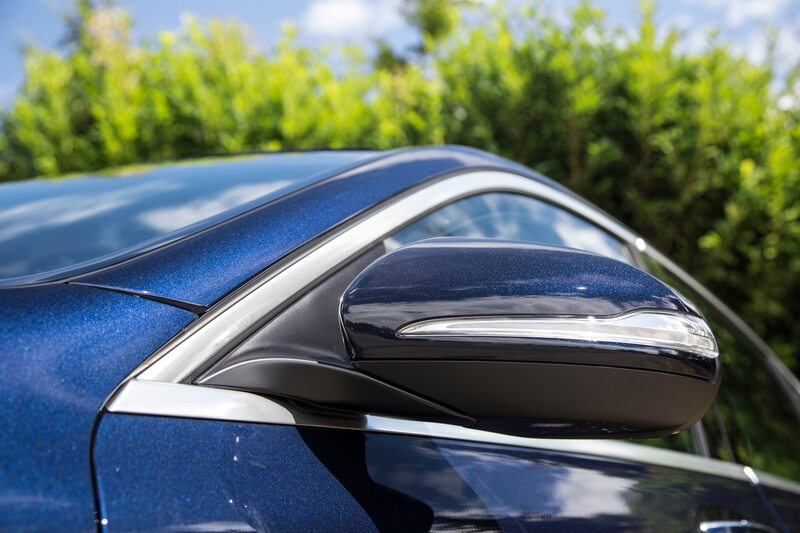 Cadillac has a distinct design language of its own, its trademark creases lending a lithe, athletic look to the ATS-V. 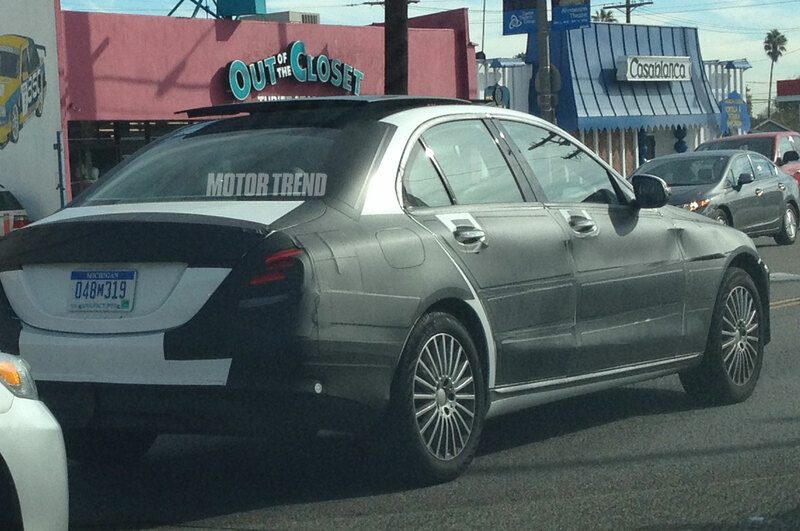 If only it were, say, 50 percent wilder. 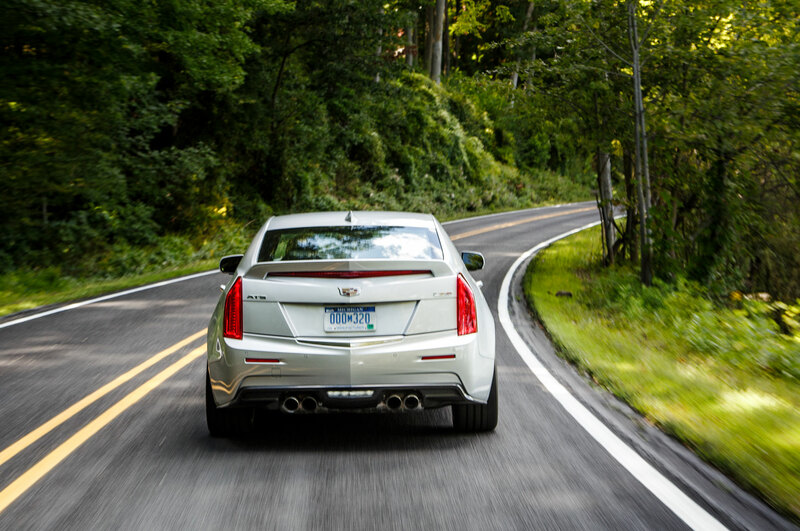 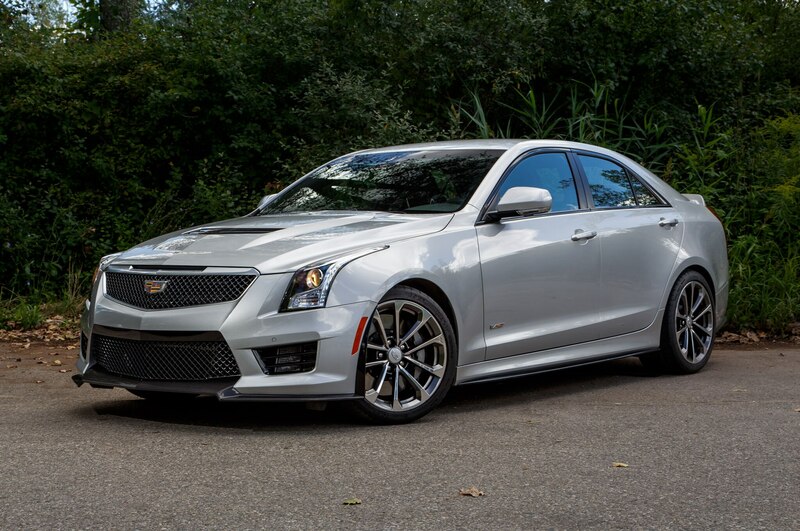 The V-series treatment dovetailed perfectly with the provocative stealth-fighter styling of earlier “Art & Science” Cadillacs, like the CTS coupe and XLR. 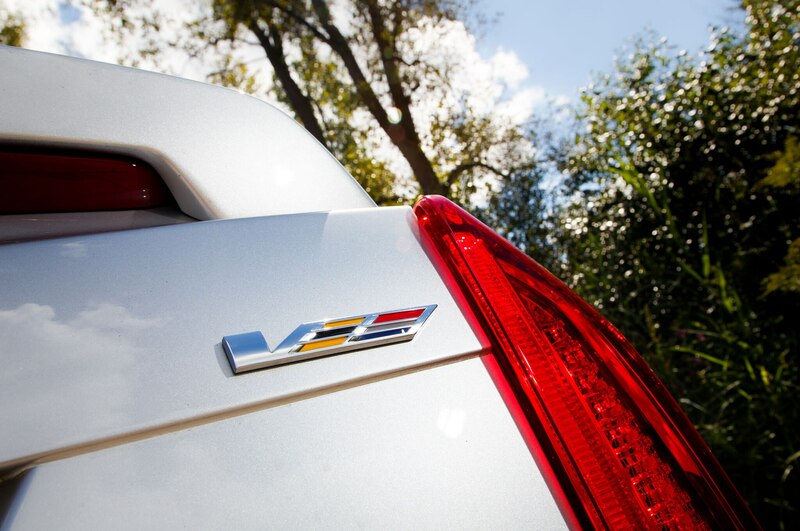 The milder ATS-V looks lean, but it’s hardly mean. 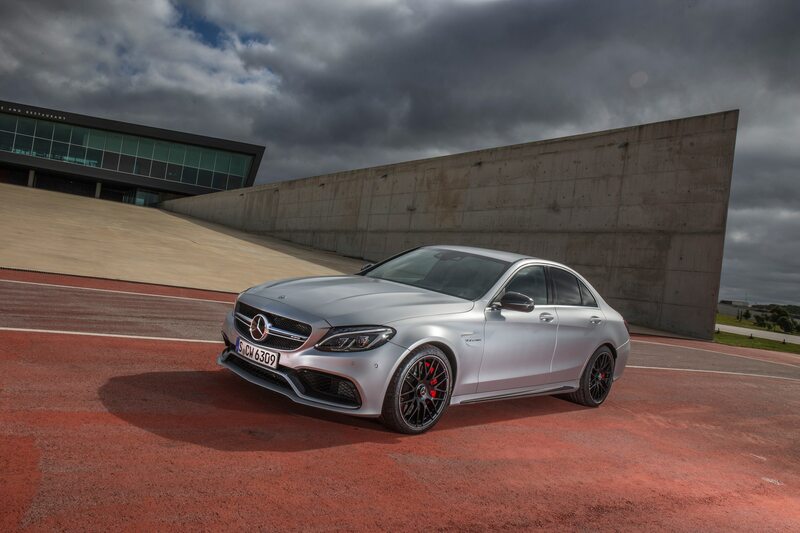 No wonder the C63 S draws the lion’s share of attention throughout our week with the cars. 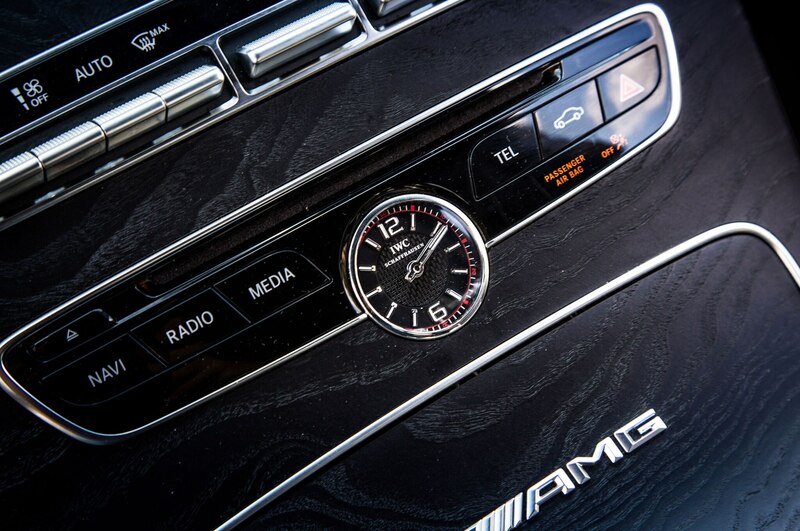 The brands also have a different way of expressing themselves inside. 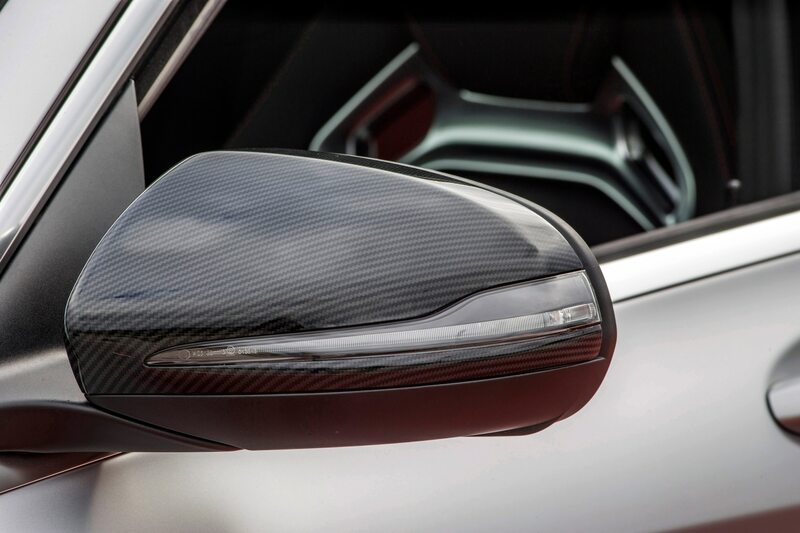 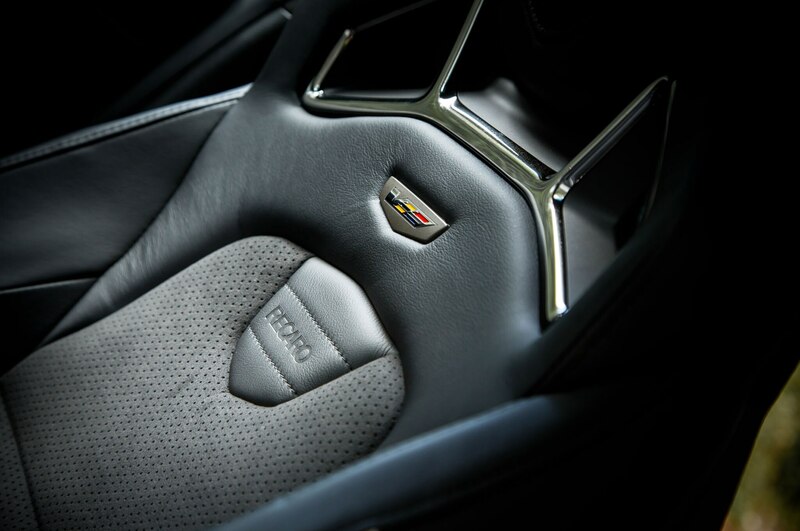 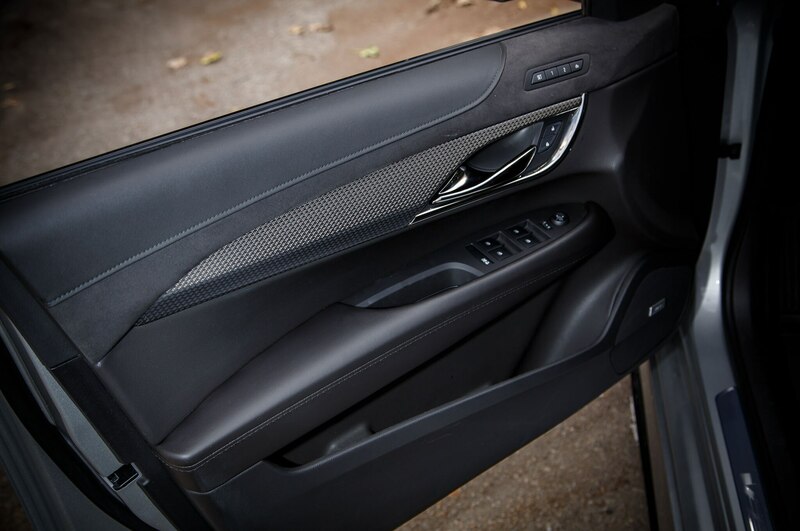 Cadillac speaks through tried-and-true sports-car cues like textured metal trim, black-on-black leather, and — our favorite — shiny black plastic. 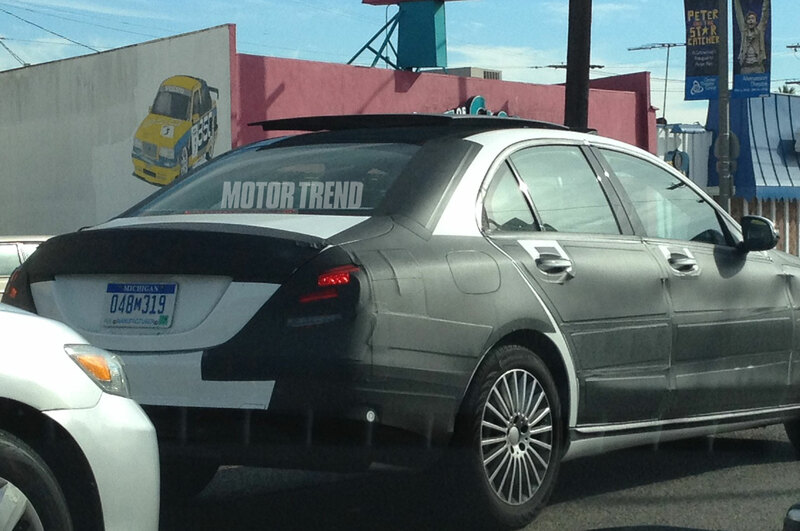 It says, “I’m sporty,” in a monotone voice. 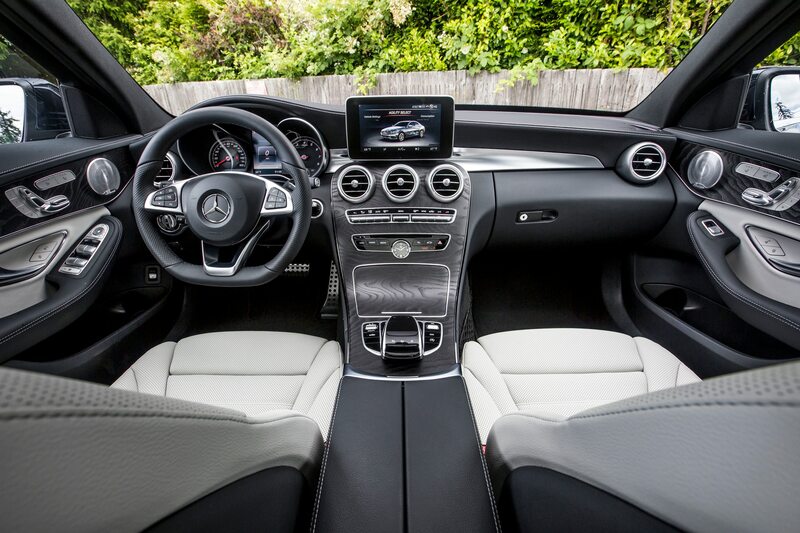 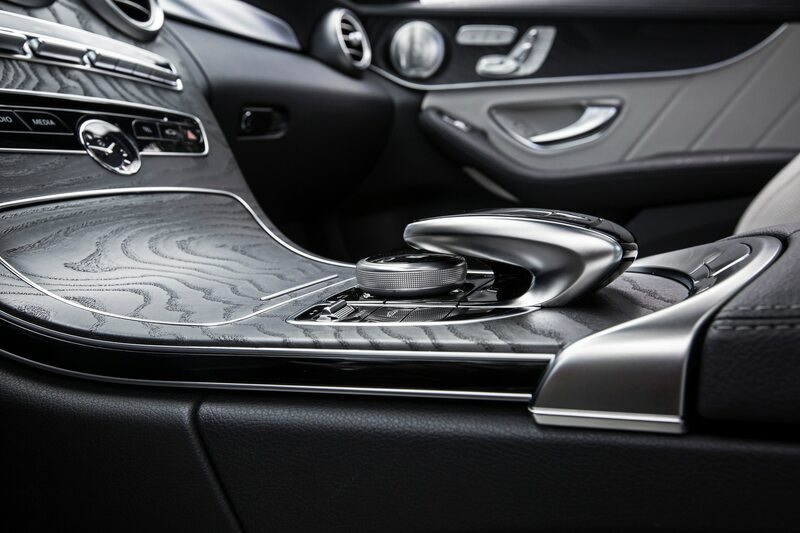 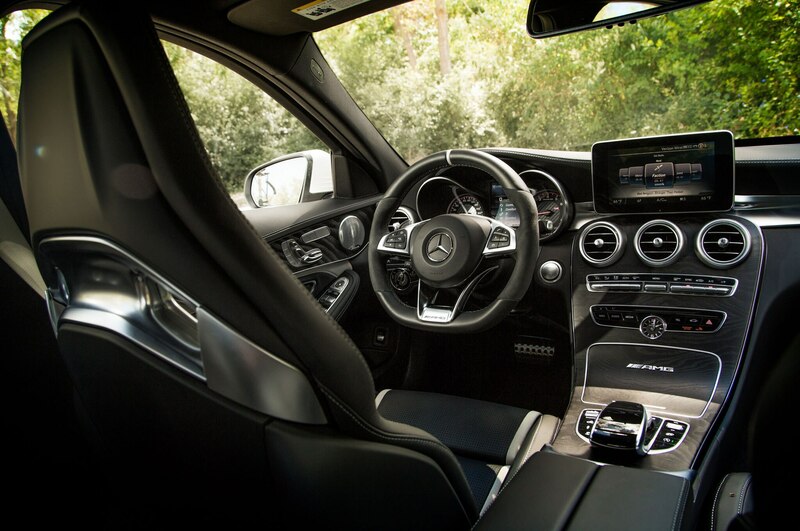 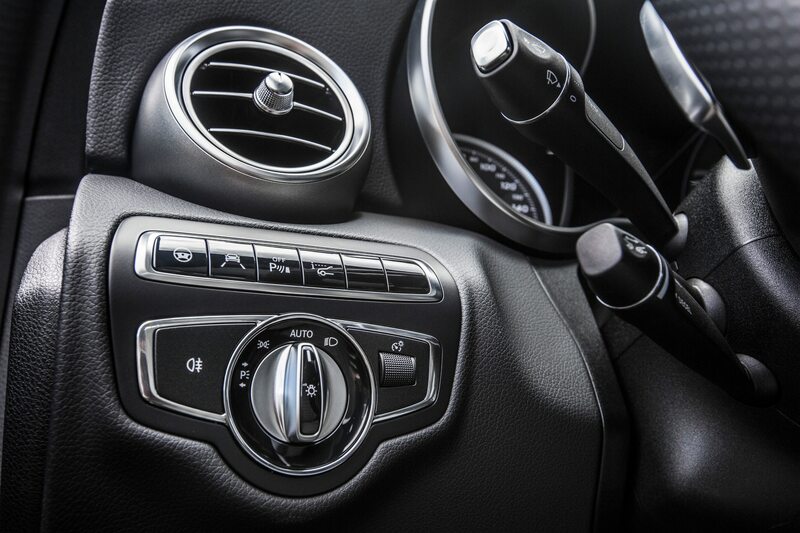 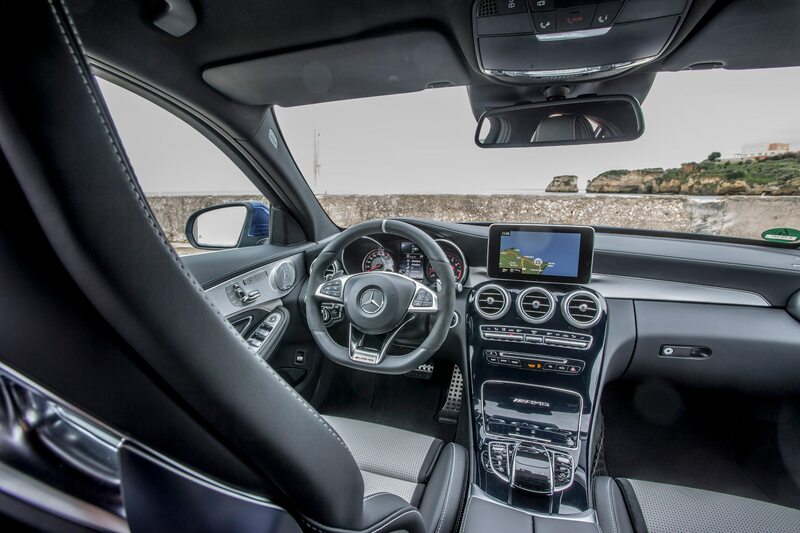 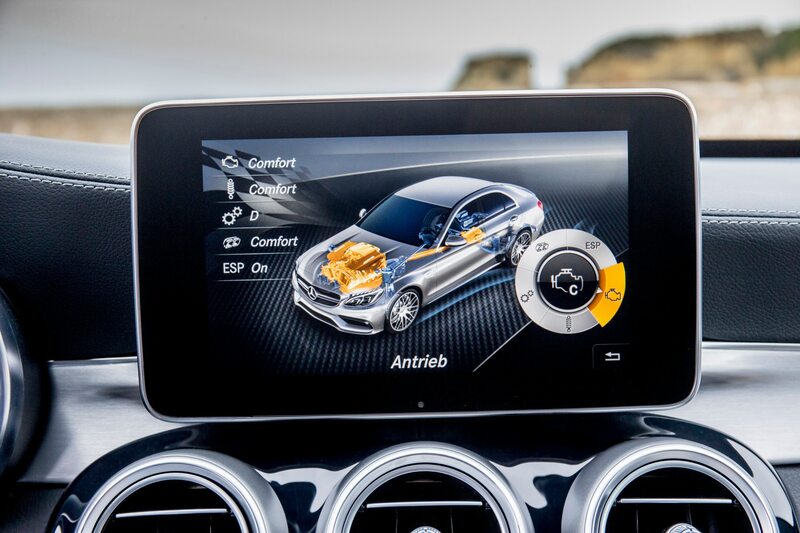 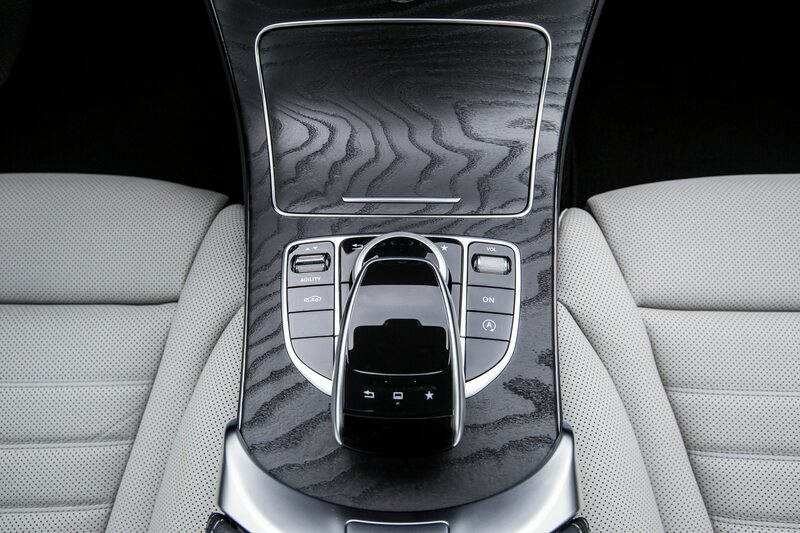 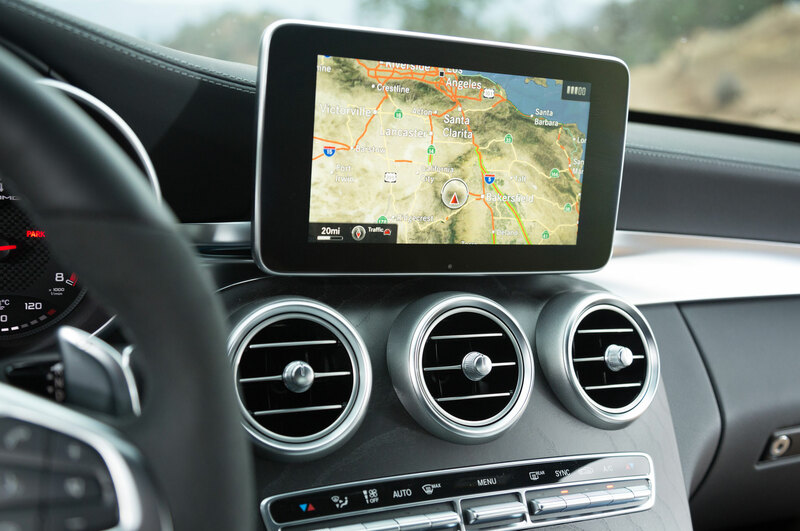 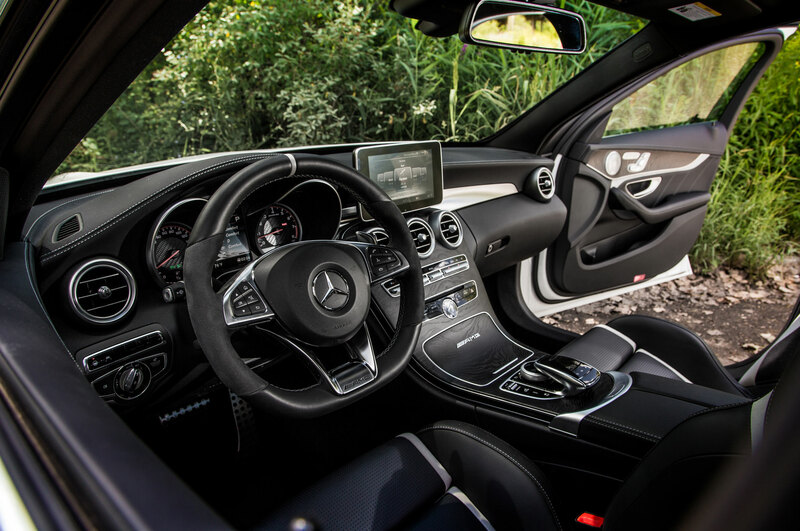 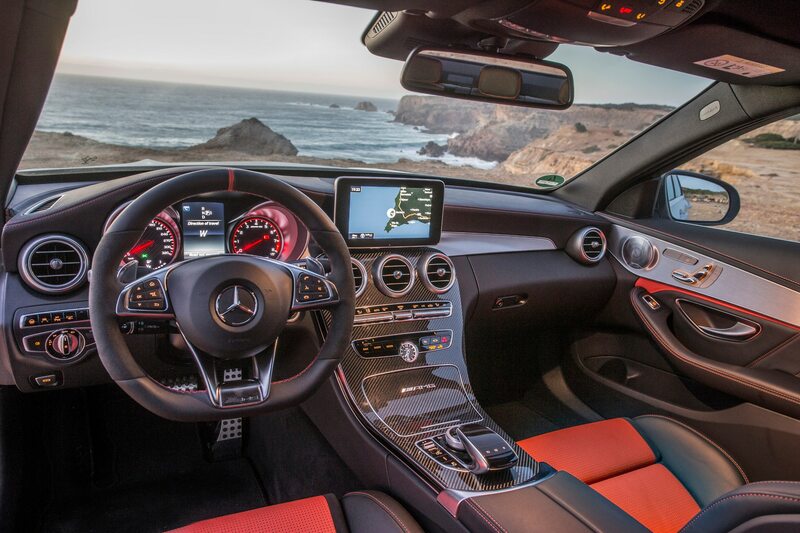 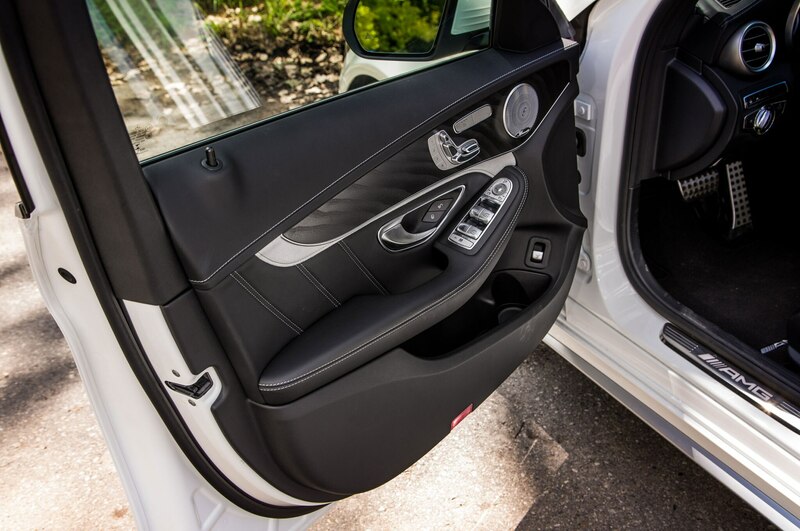 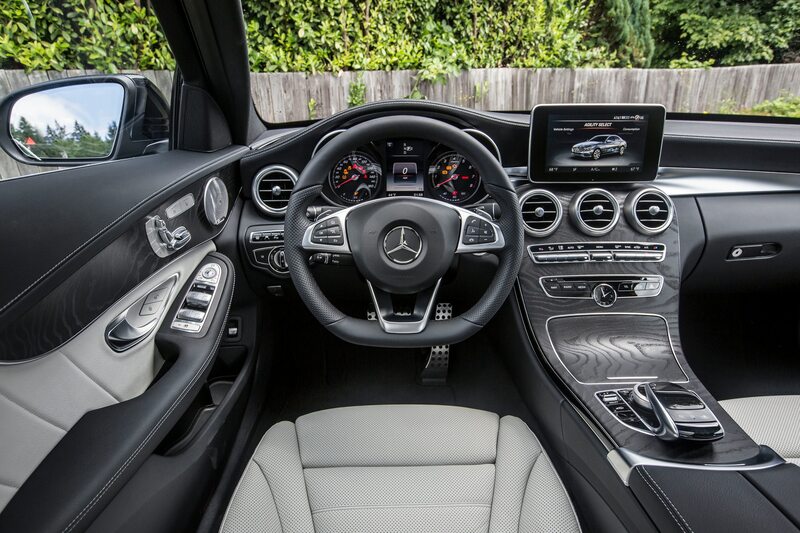 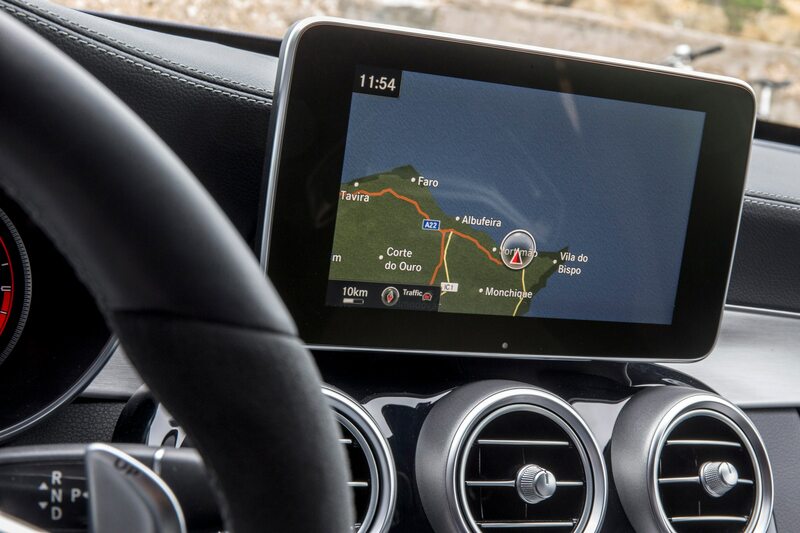 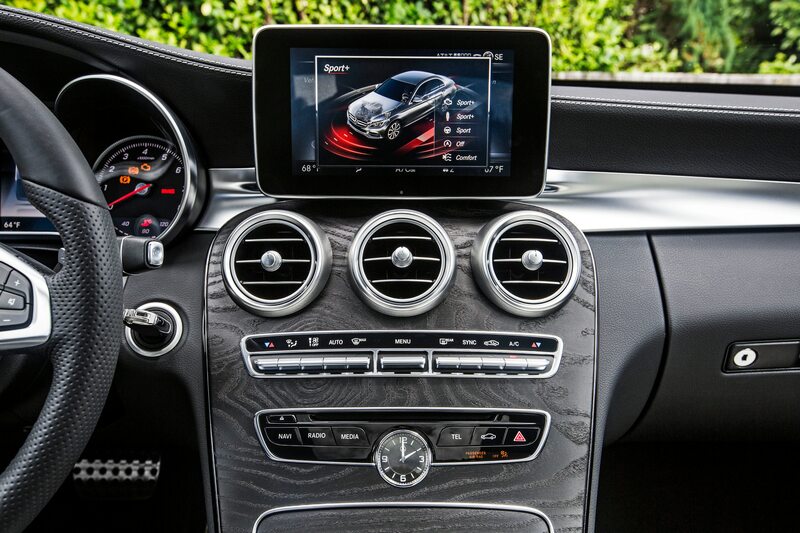 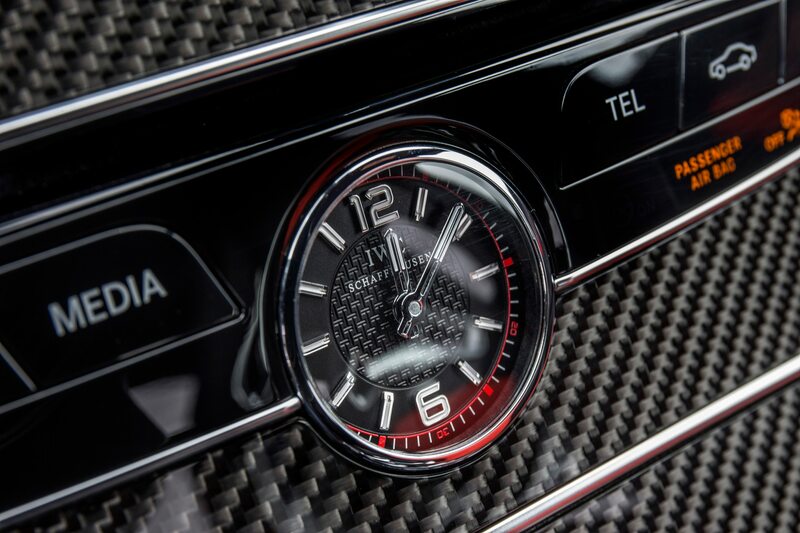 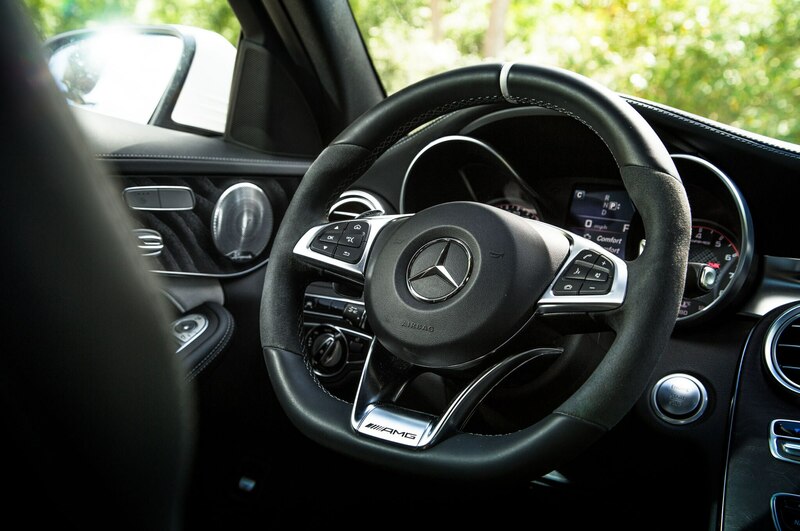 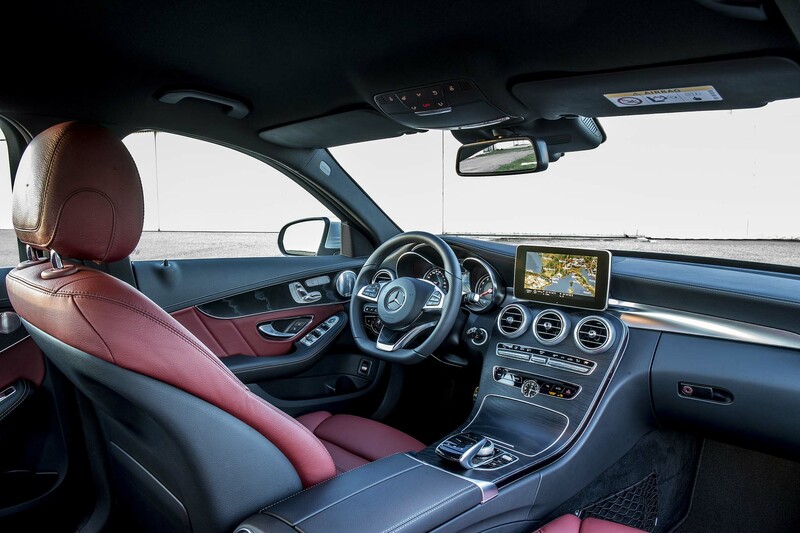 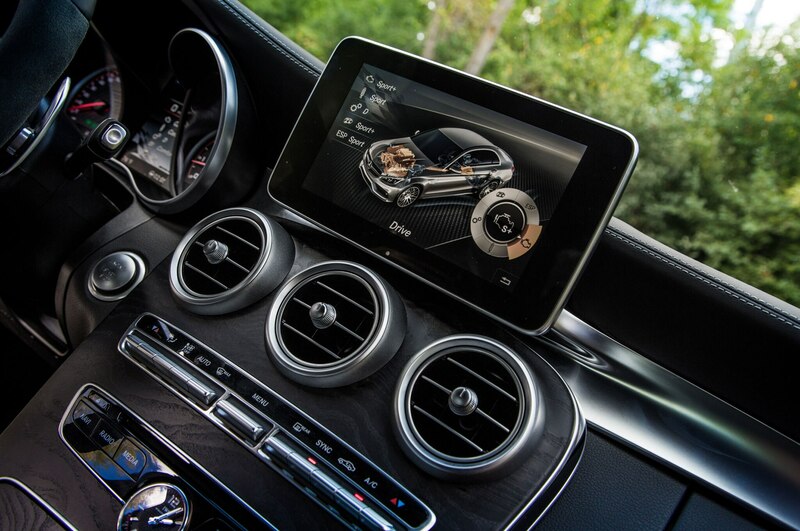 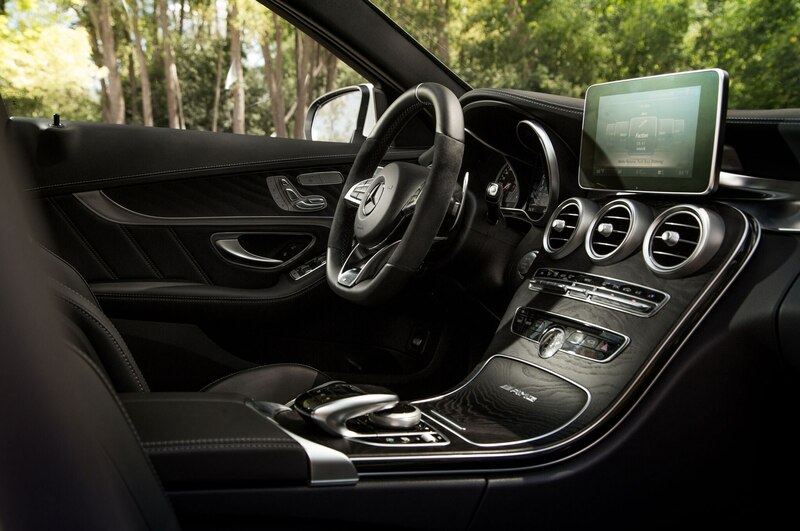 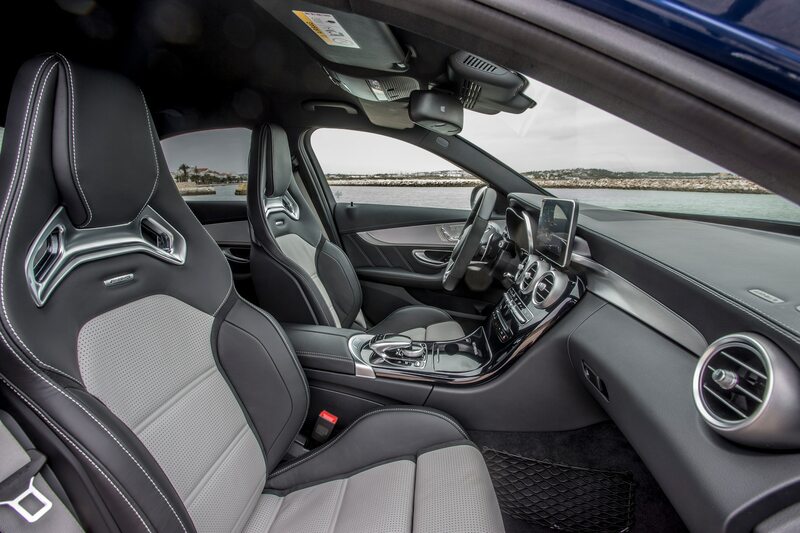 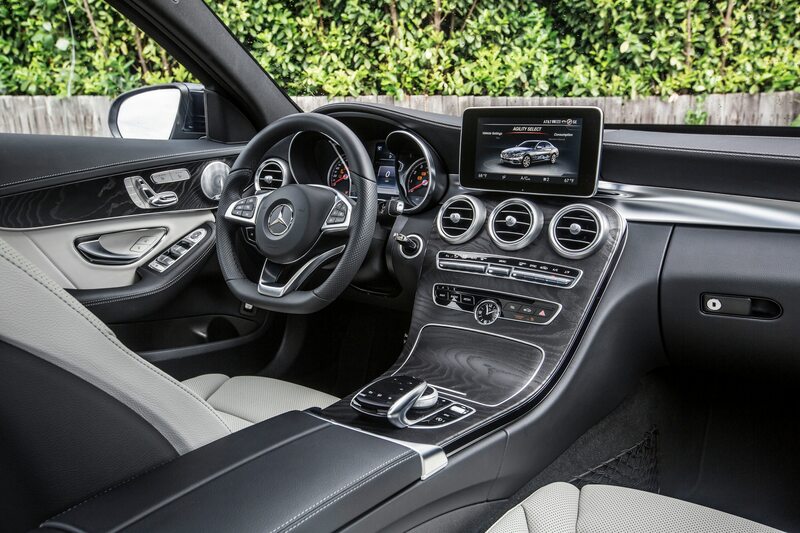 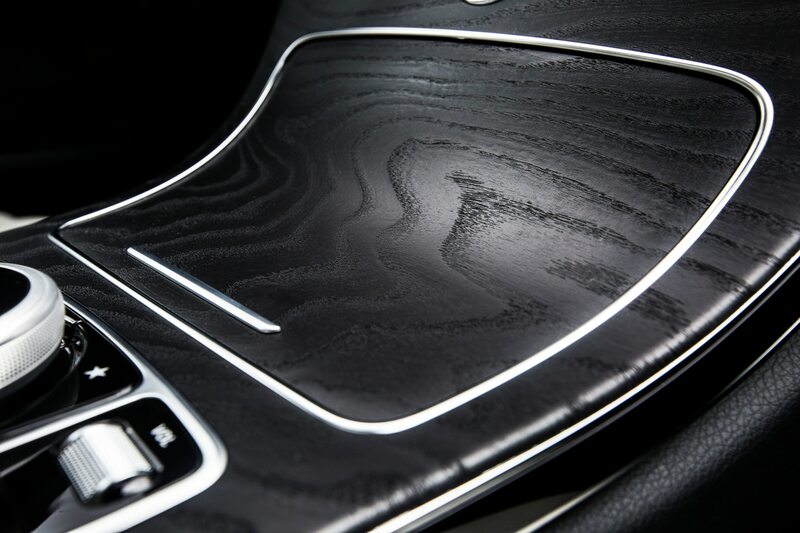 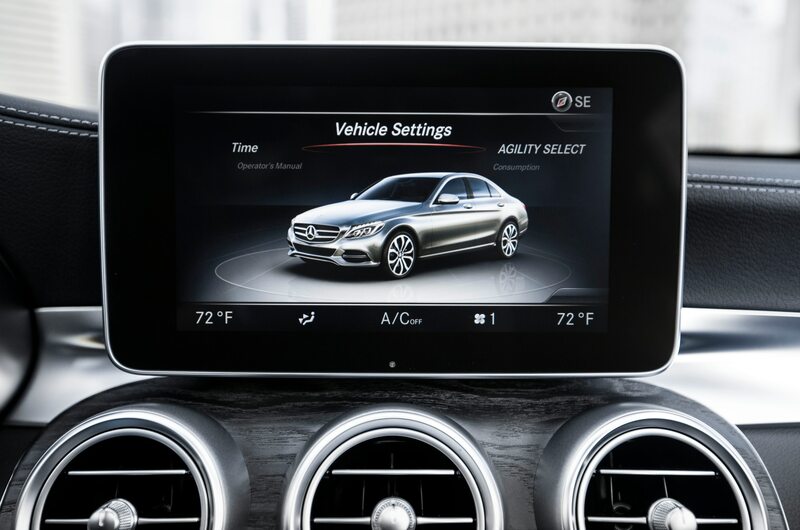 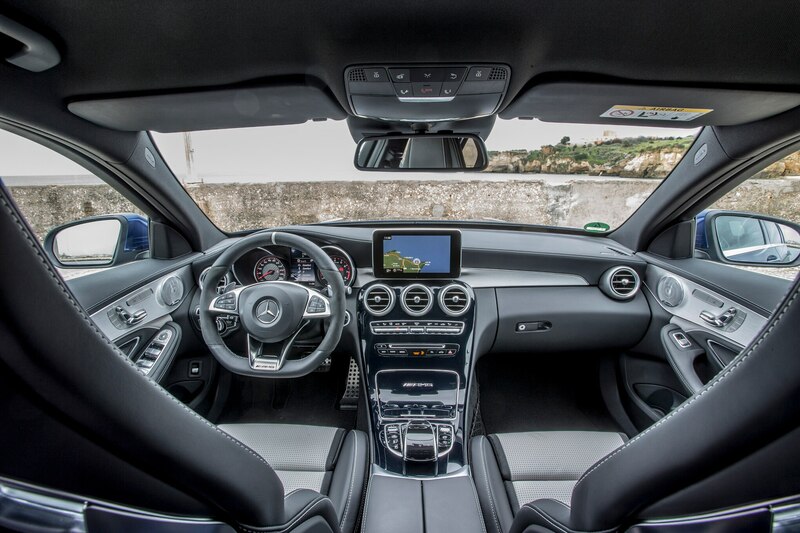 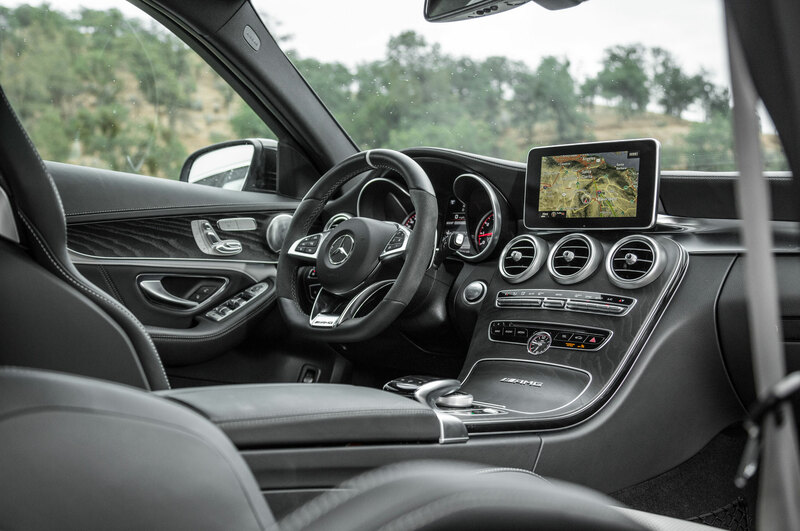 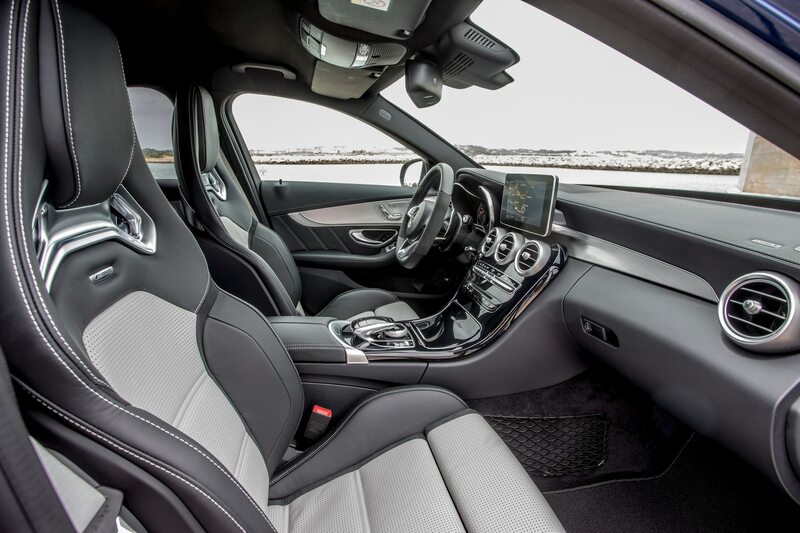 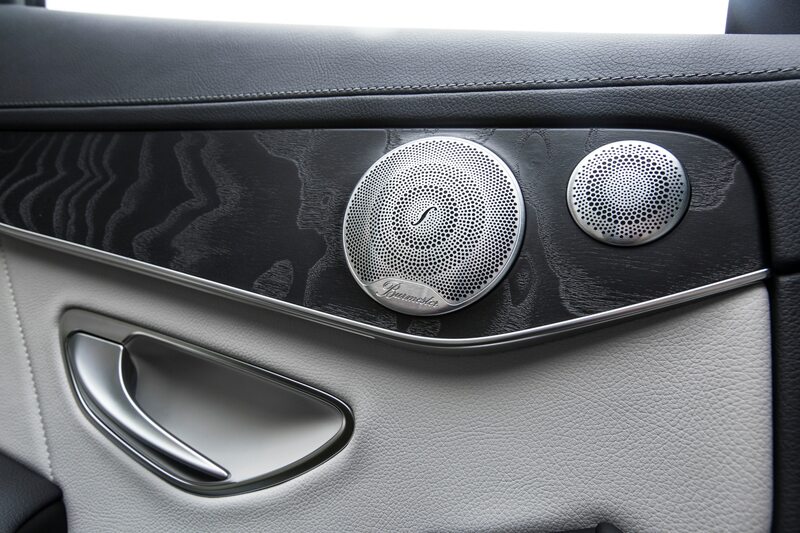 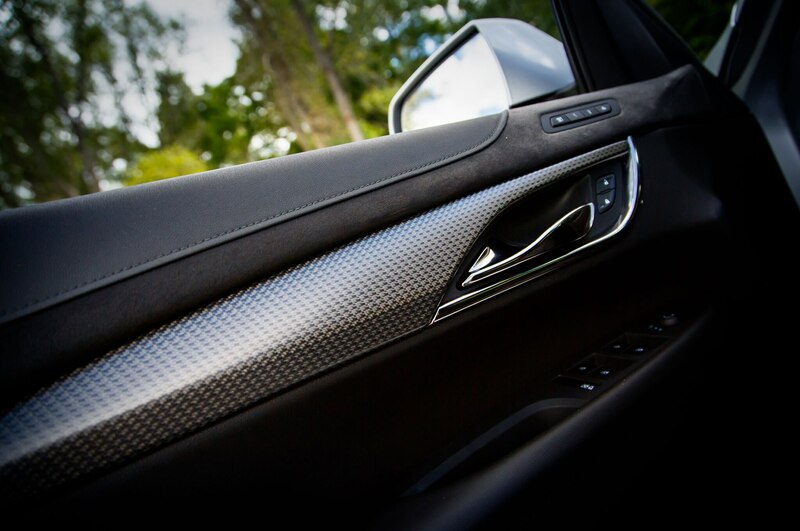 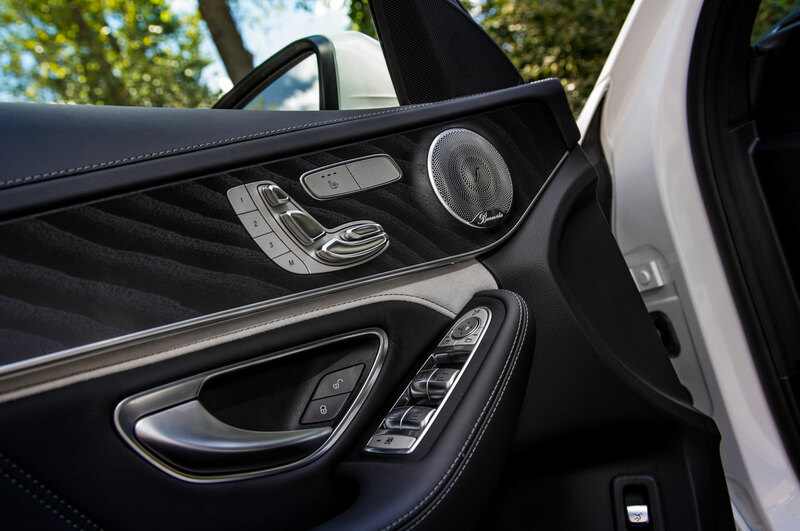 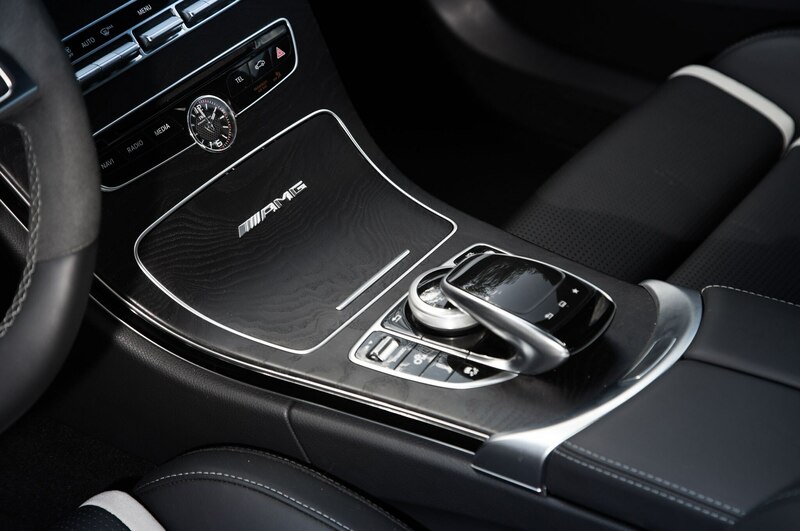 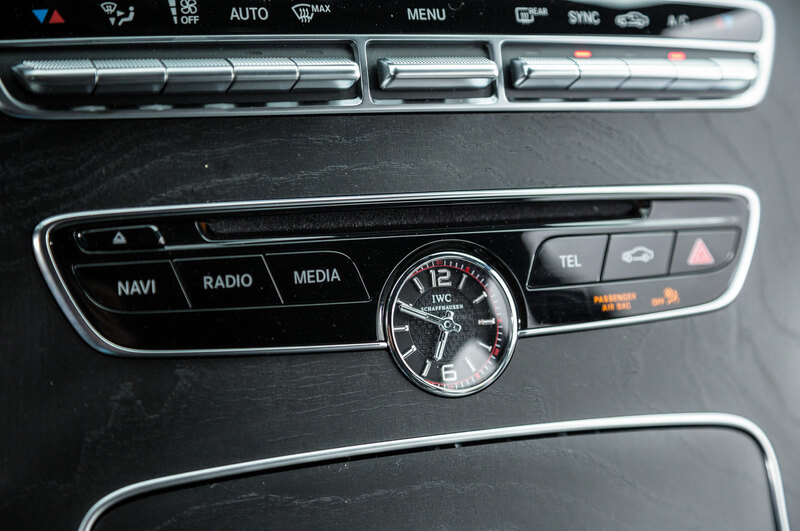 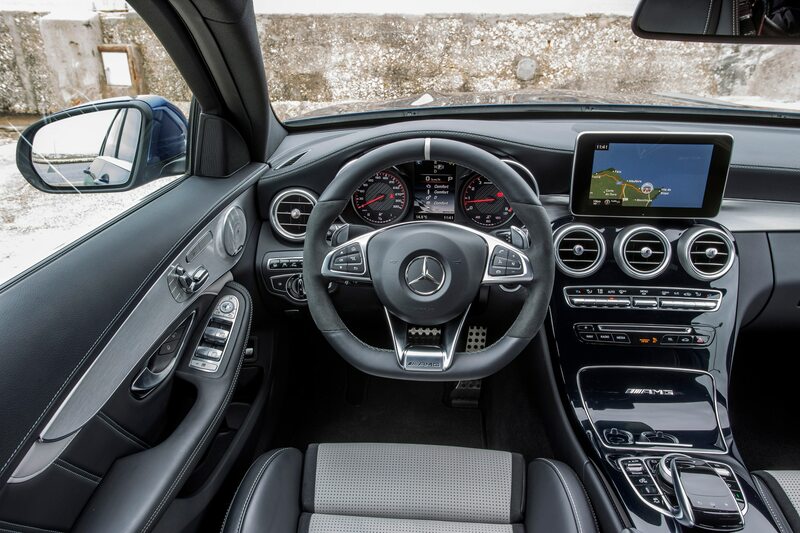 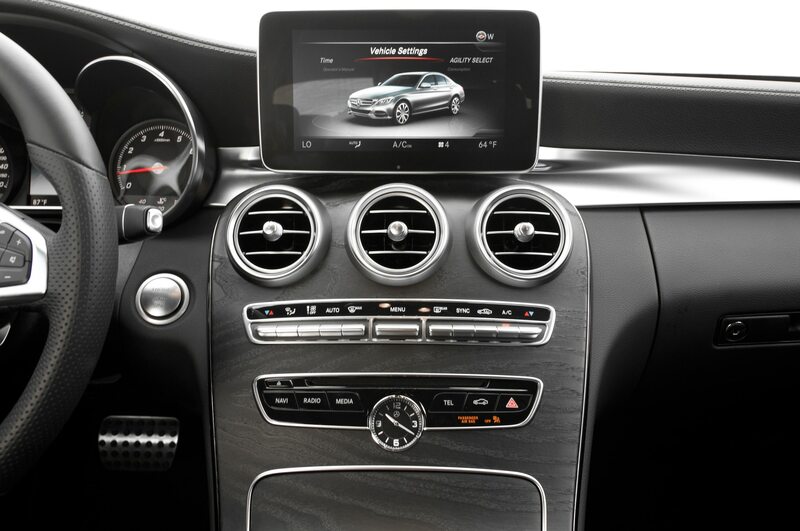 The Mercedes, on the other hand, whispers seductively with an exquisite slab of open-pore wood that runs down the center of the dashboard, wonderfully detailed gauges, and finely finished controls. 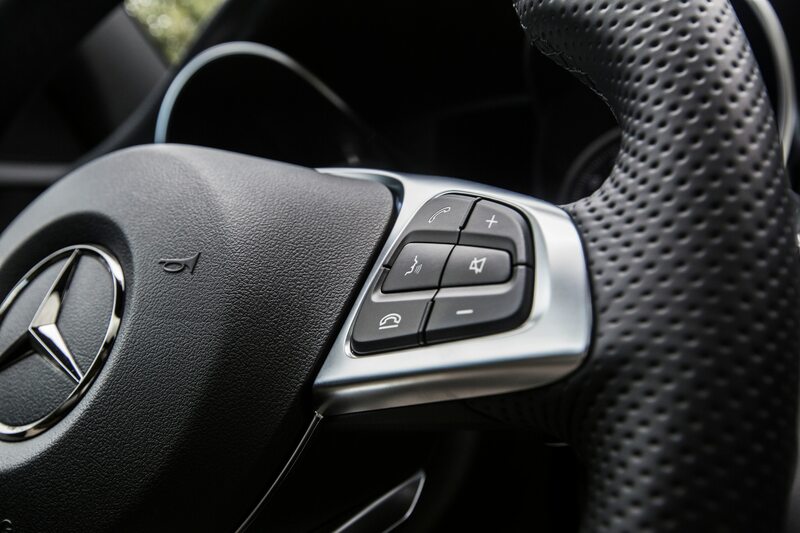 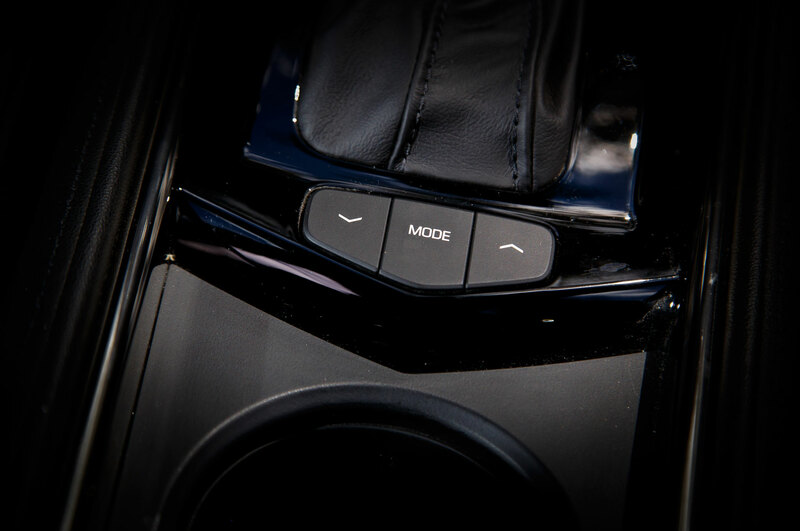 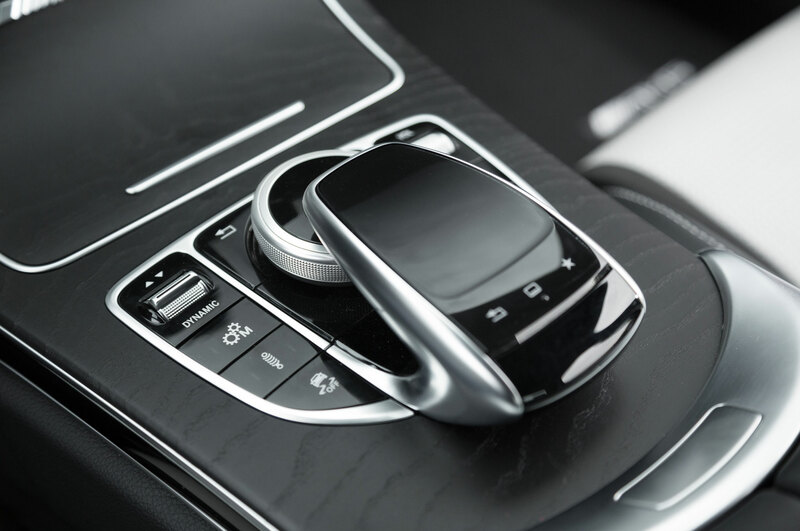 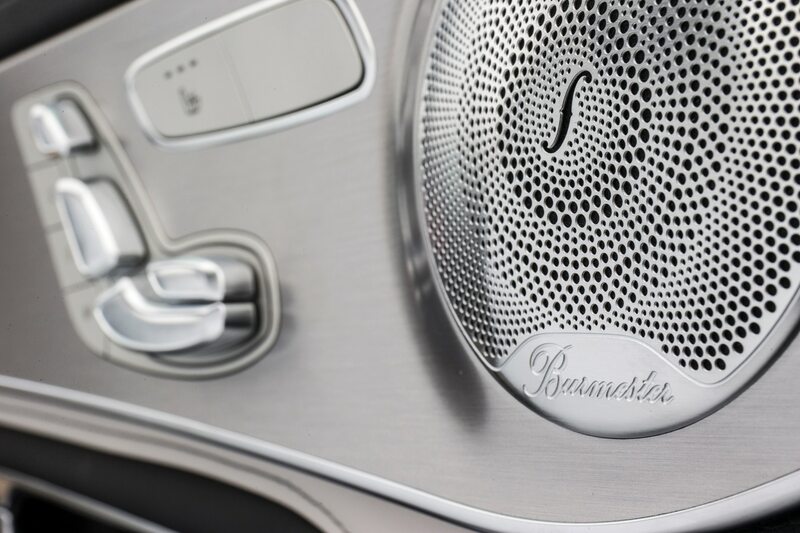 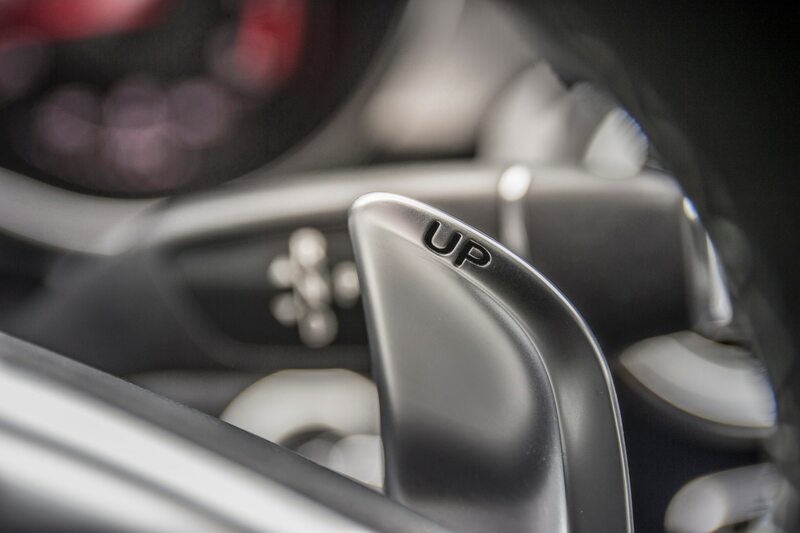 The multi-controller glides smoothly and works intuitively, the knurled volume control is recognizable to your finger so that you needn’t give it a glance, and the brushed metal seat adjusters feel cool to the touch. 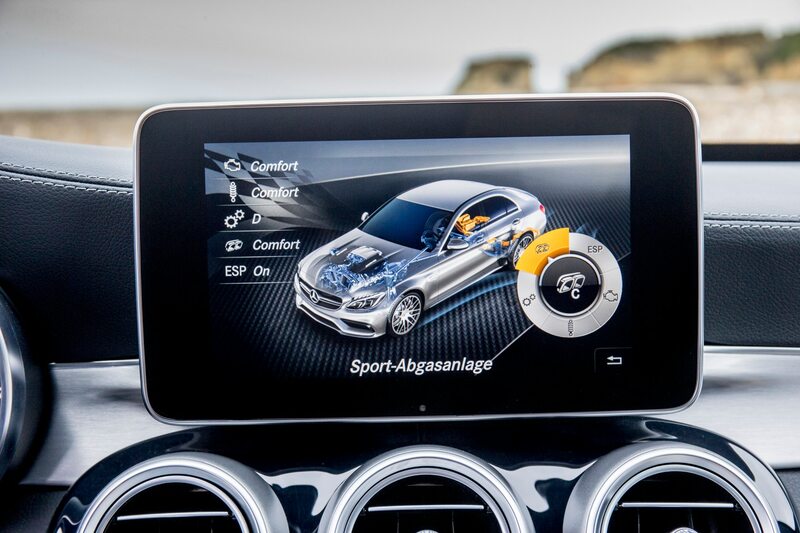 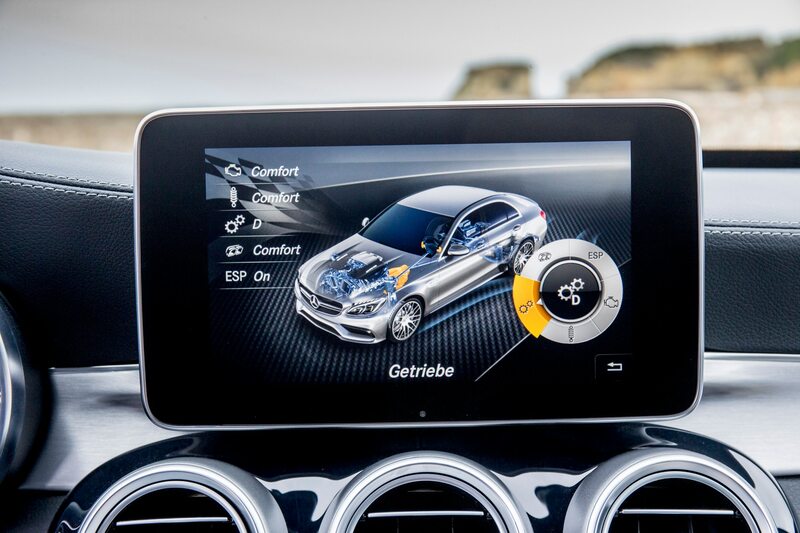 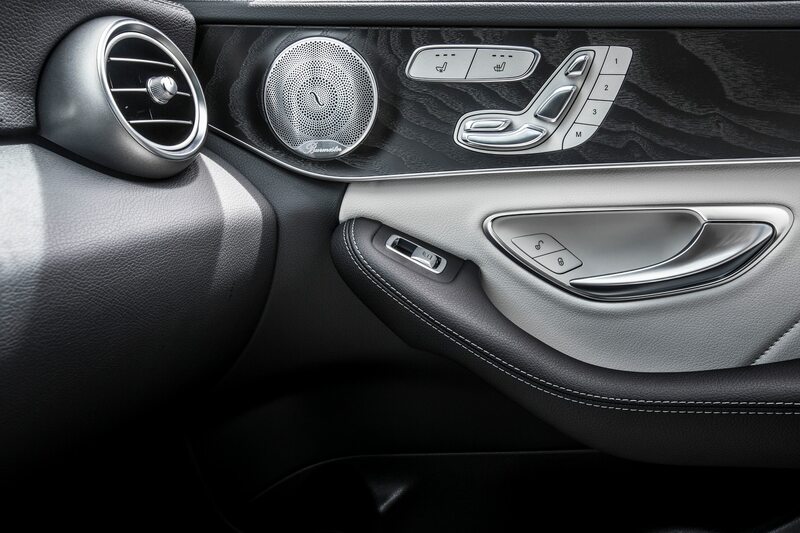 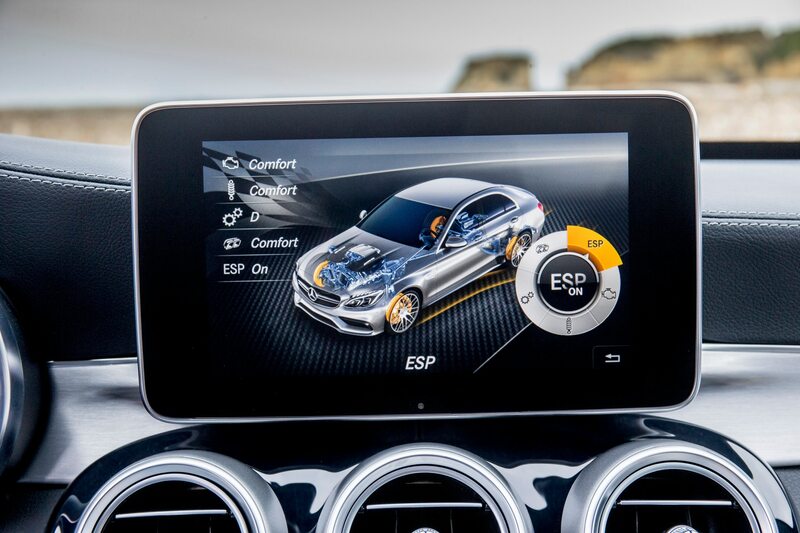 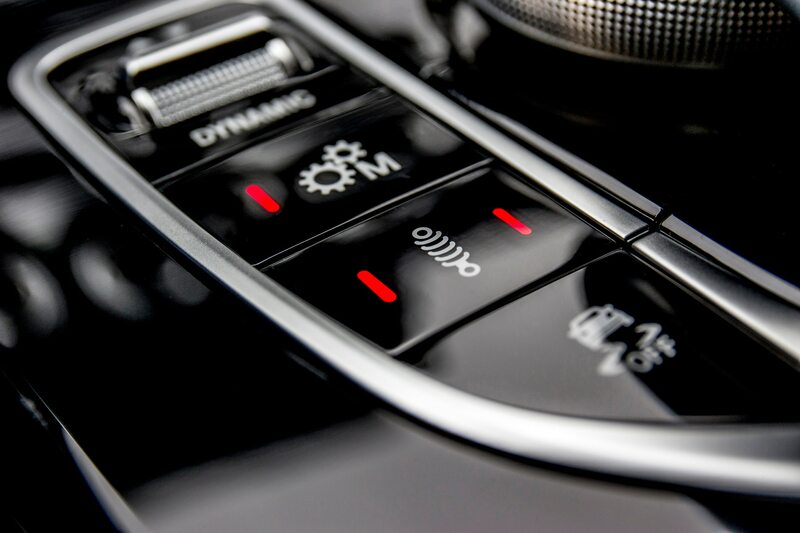 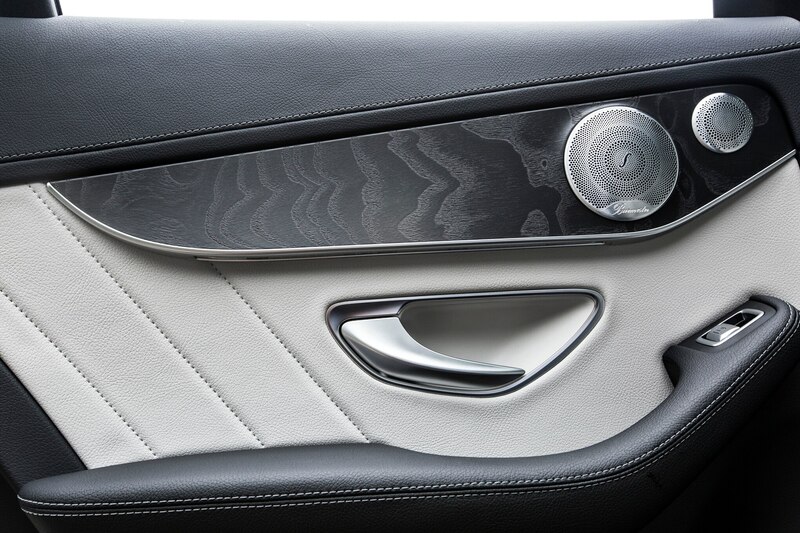 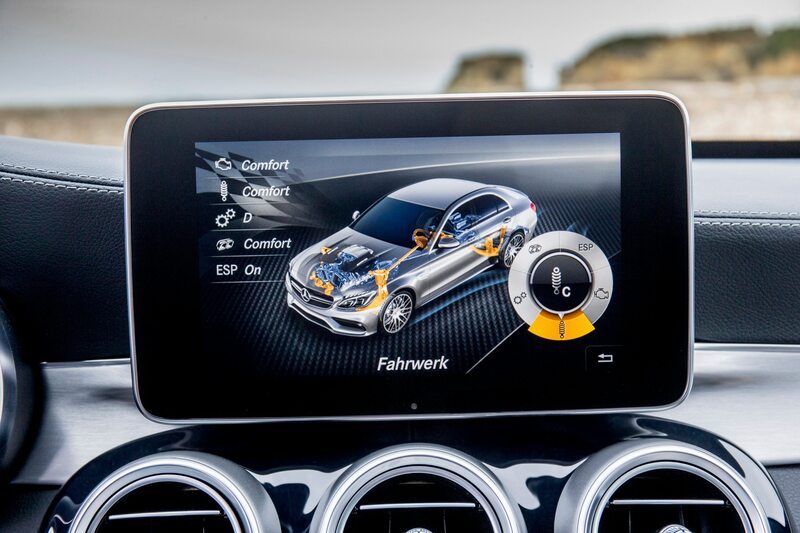 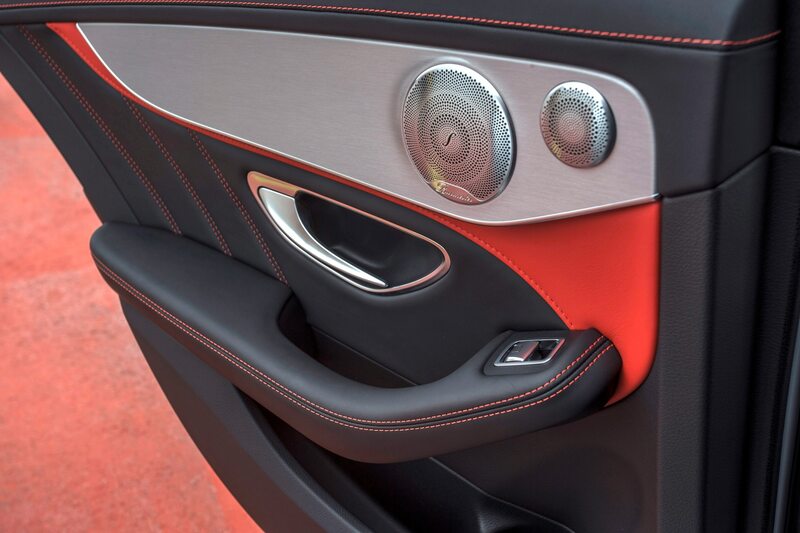 Mercedes wisely recognizes that these little buttons and switches are opportunities to interact and bond with your very expensive car. 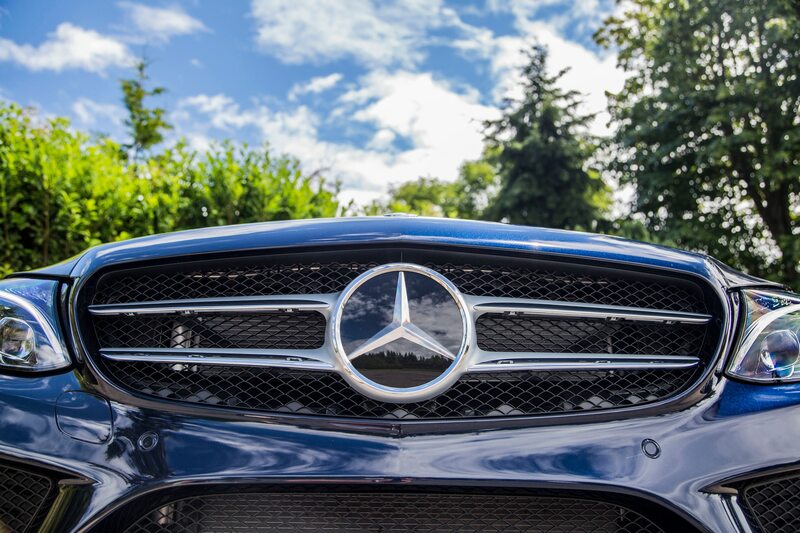 And bond you will. 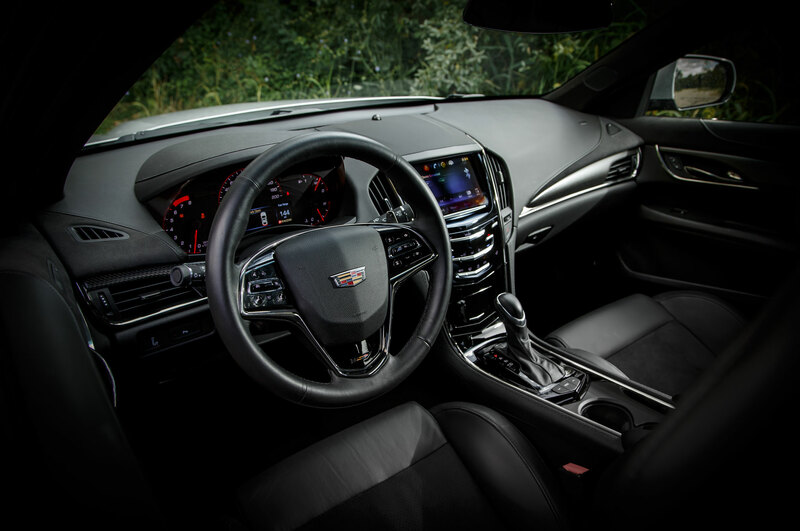 The Cadillac provokes constant opportunities to curse at the idiocy of putting capacitive controls in a moving vehicle. 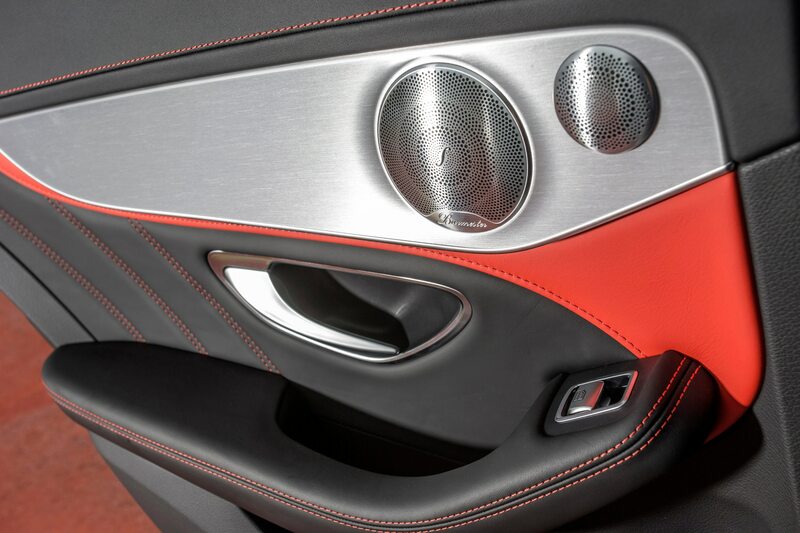 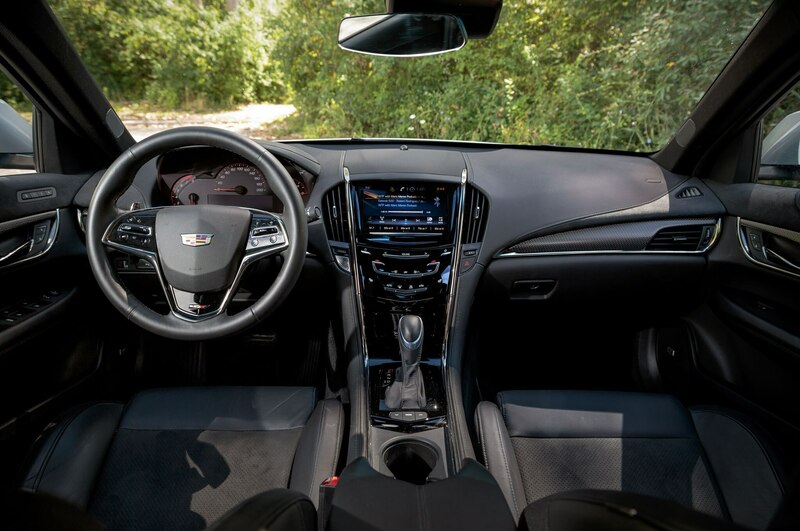 This writer cannot even muster the pinpoint motor skills to consistently adjust the volume while driving, and that’s after consecutive yearlong stints with a 2014 Cadillac ATS and a CTS Vsport. 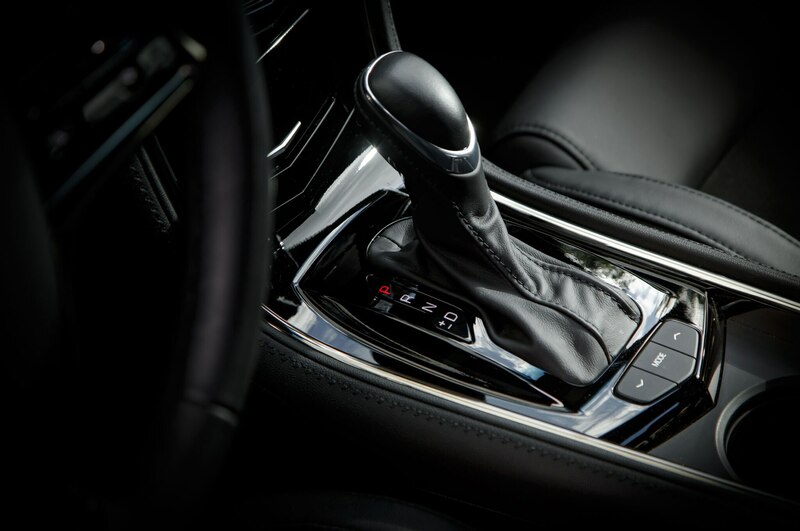 All this function sacrificed for a center-stack that looks elegant when it’s clean, but through daily use becomes an unsavory petri dish of fingerprints and smudges. 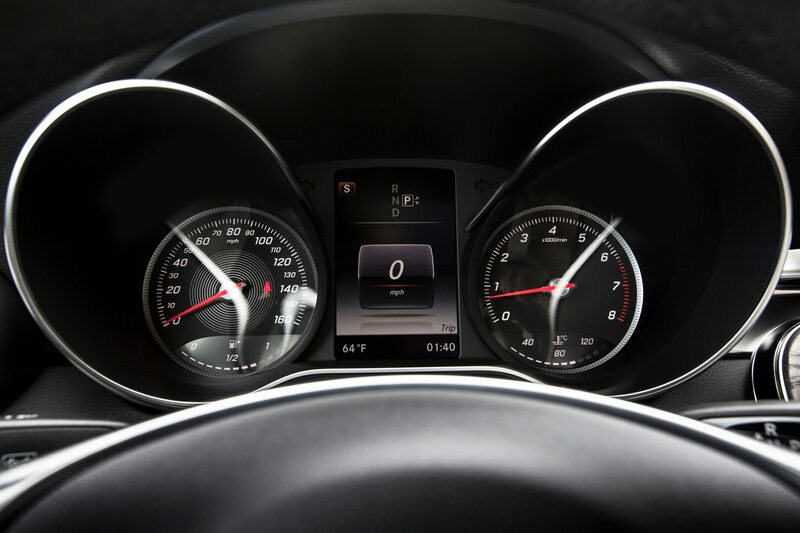 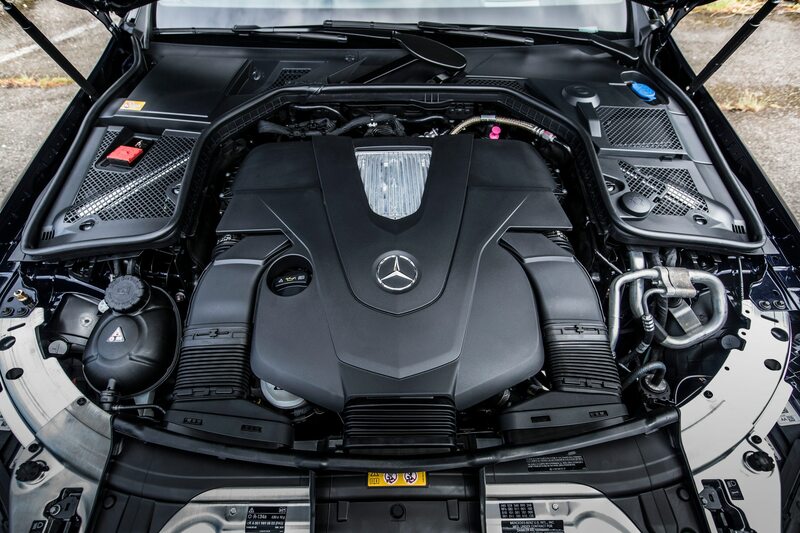 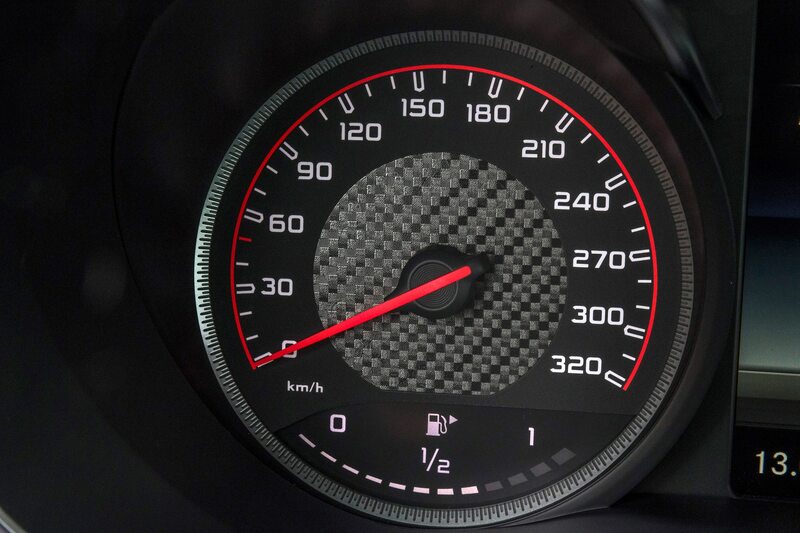 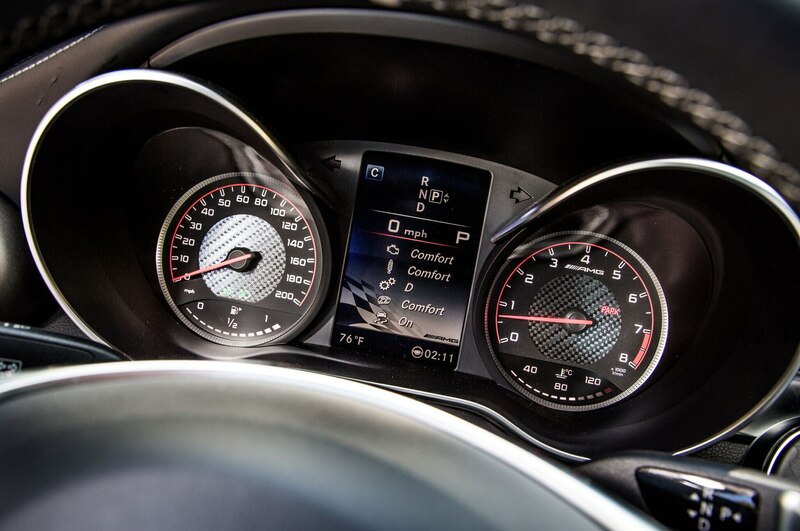 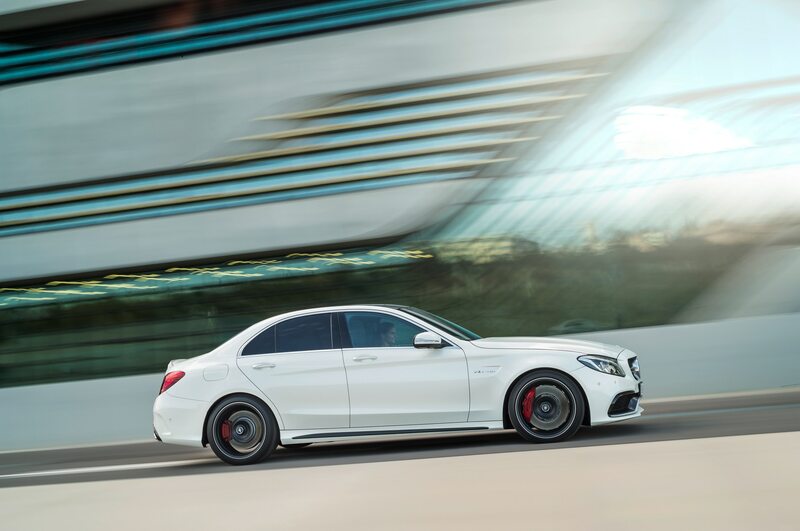 Press the starter button on the C63 S, and the 4.0-liter turbo V-8 awakens like a bulldog poked with a stick. 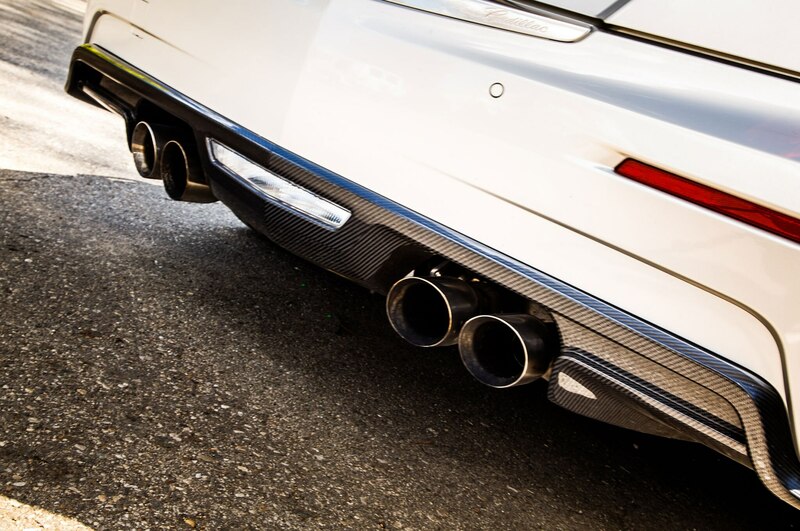 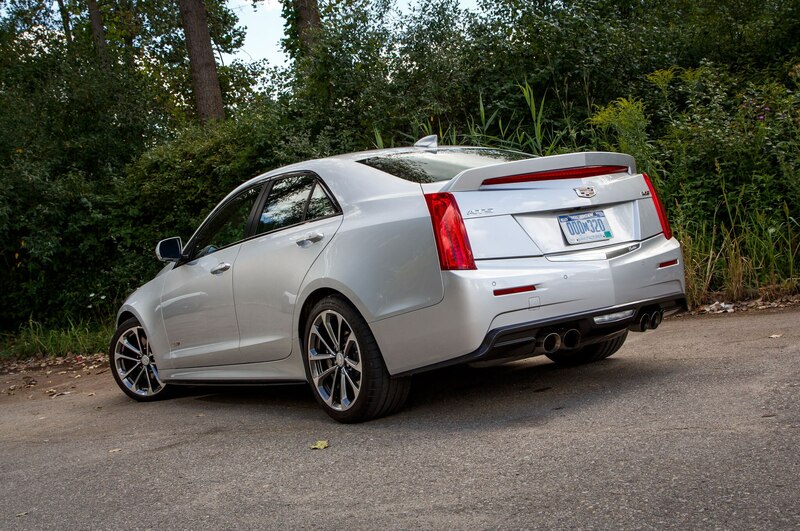 It doesn’t quite match the Howitzer exhaust note of its predecessor’s 6.2-liter V-8, but it does sound damn good, and certainly drowns out the tepid six-cylinder hum of the Cadillac. 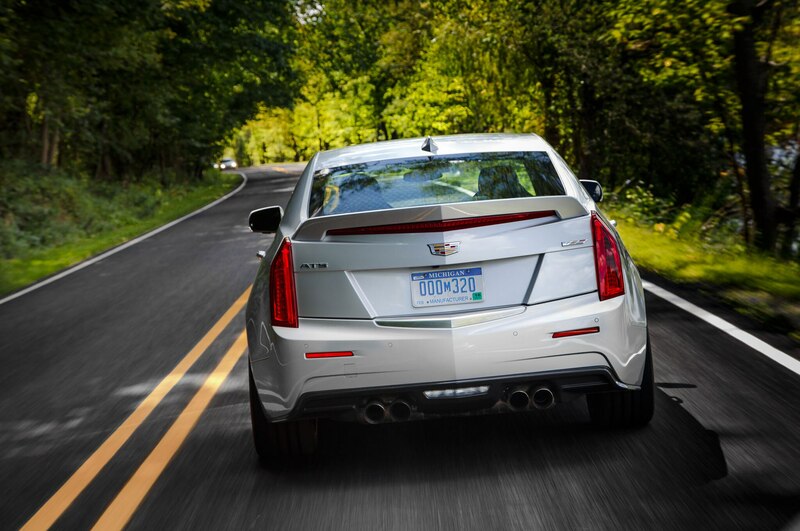 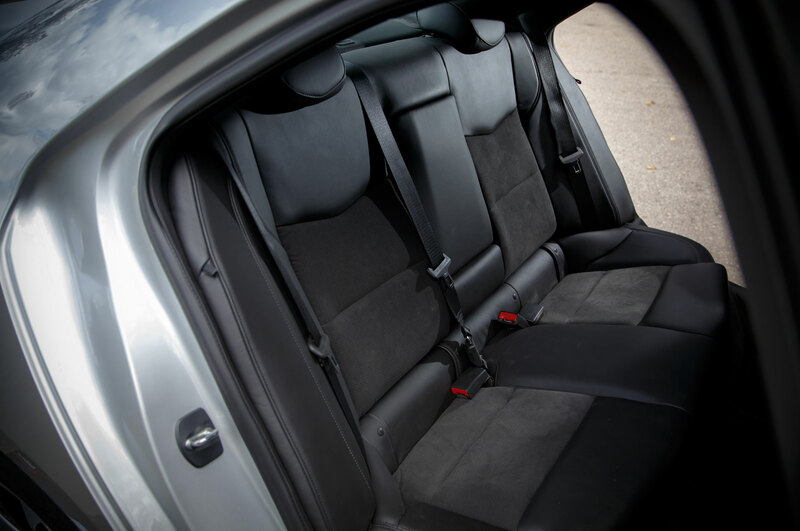 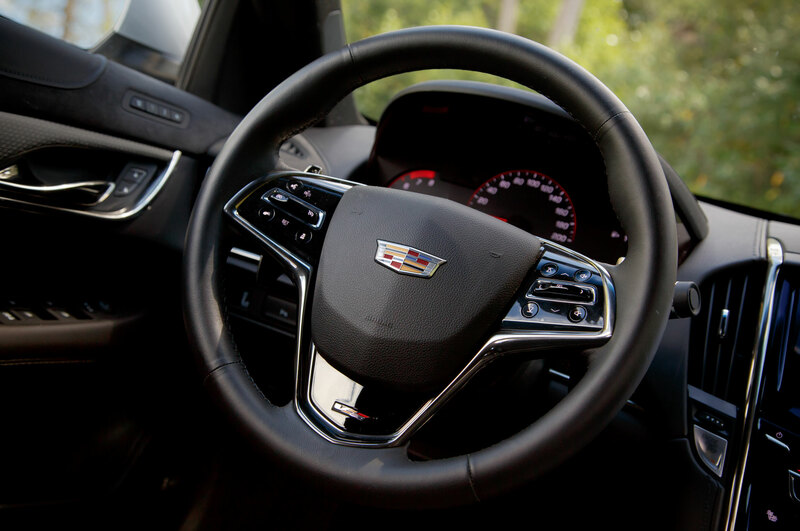 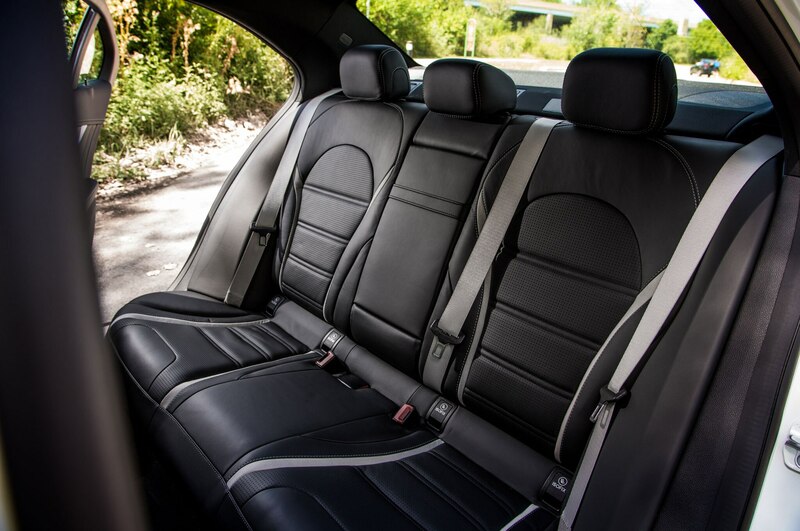 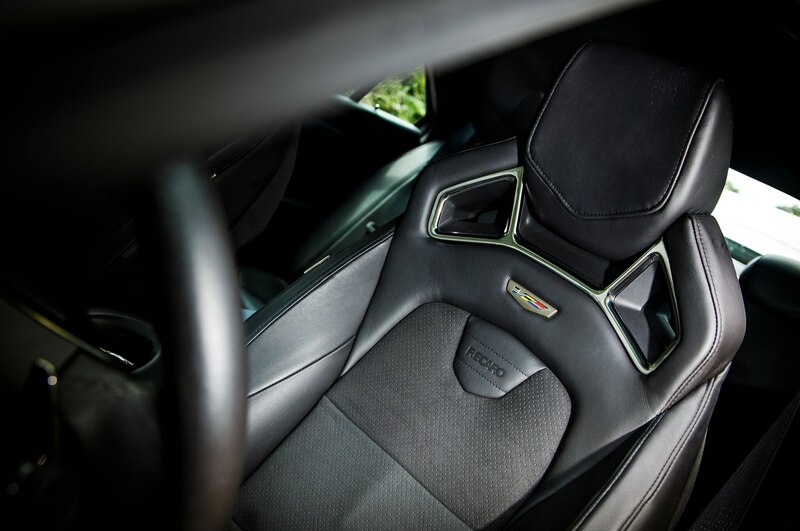 The quieter Cadillac begins to assert itself when it gets moving. 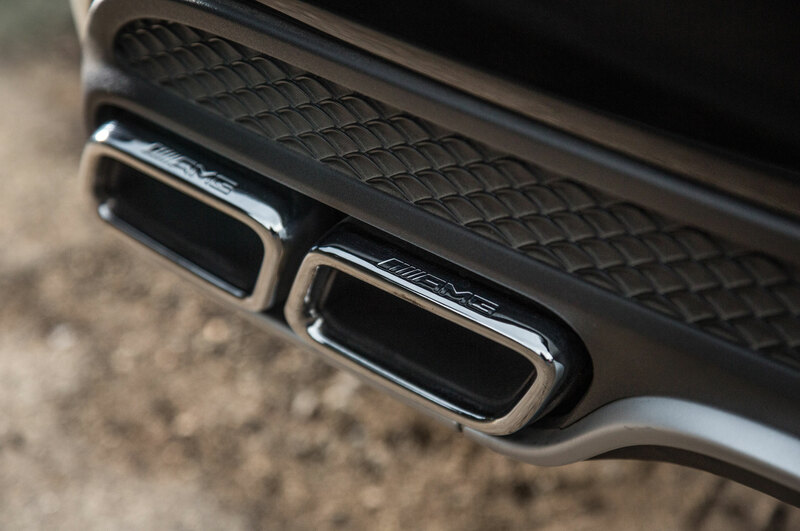 Even driving around town, one can appreciate the tactile, lively steering and unflappably smooth ride from its magnetic dampers. 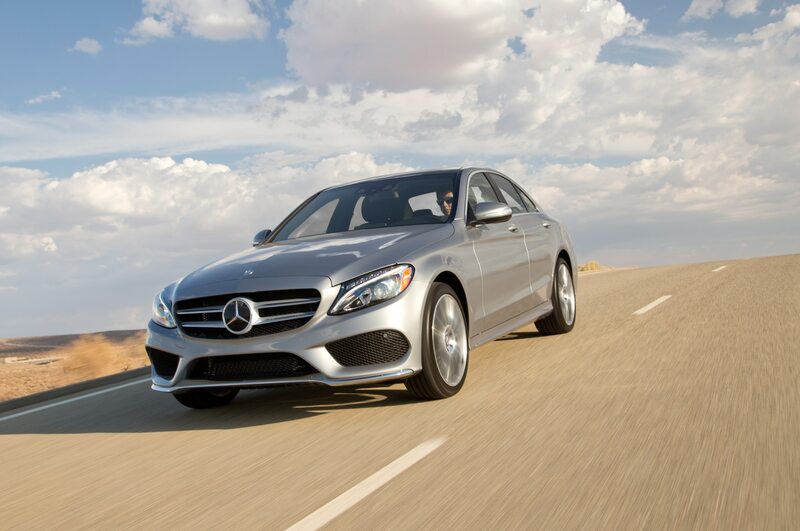 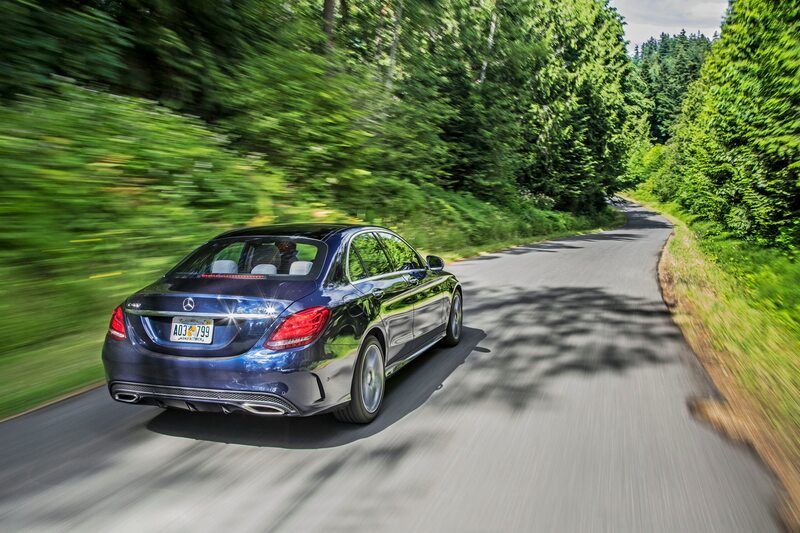 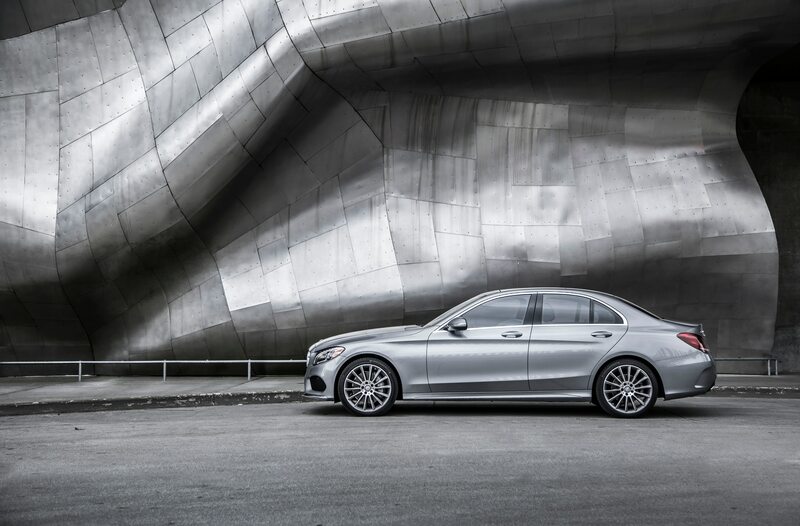 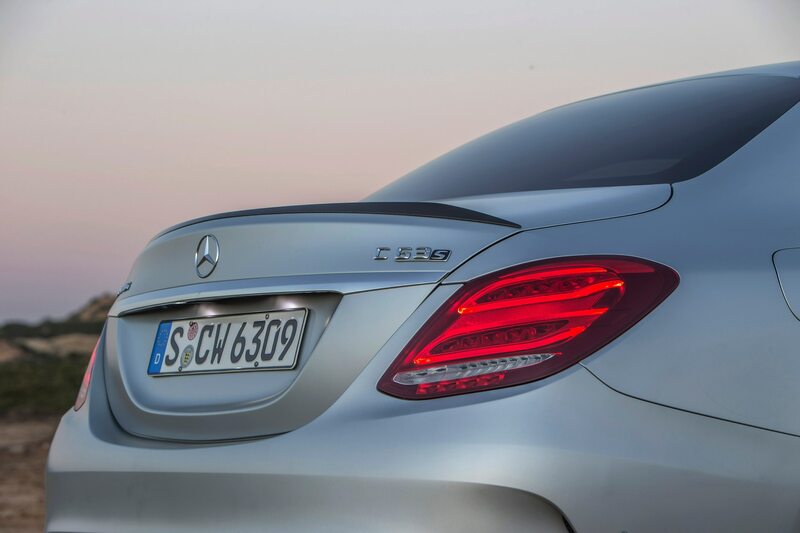 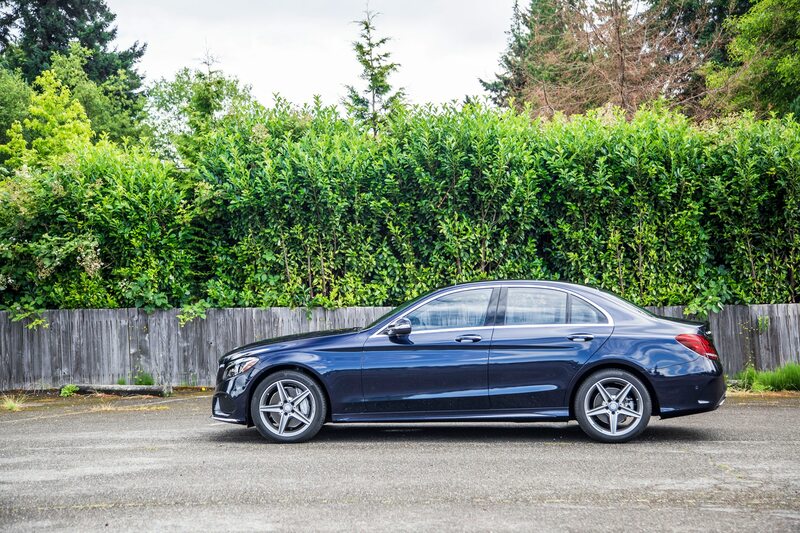 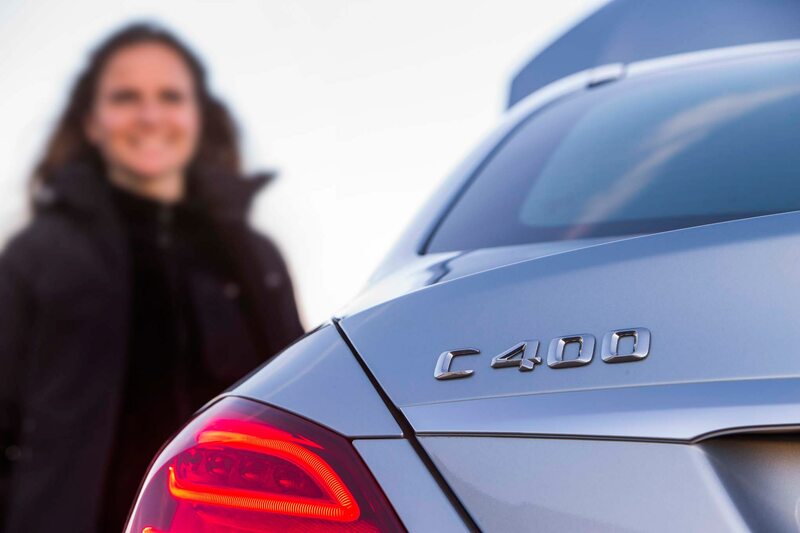 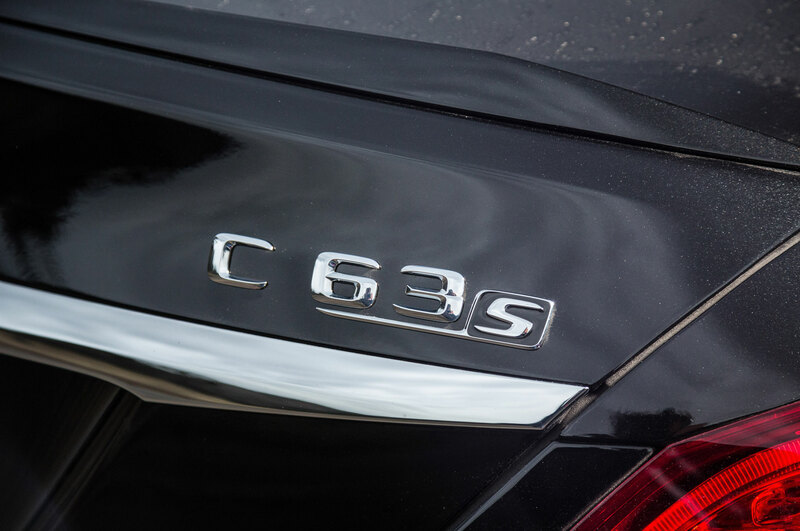 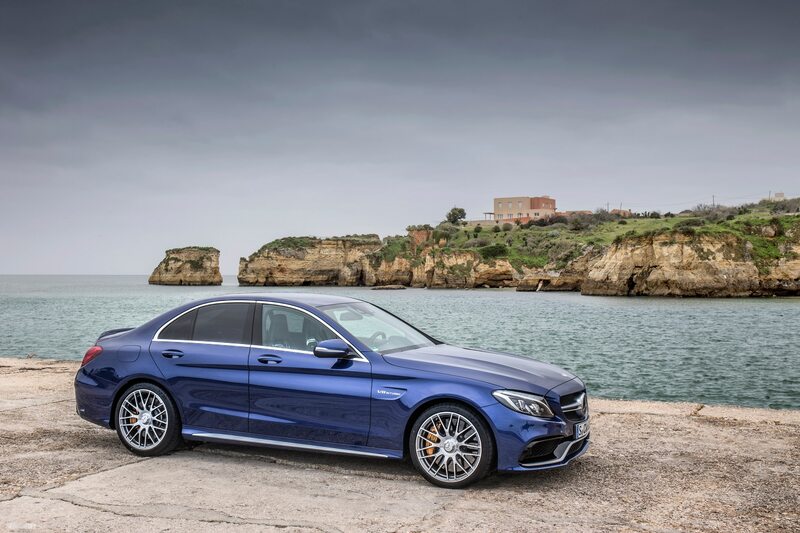 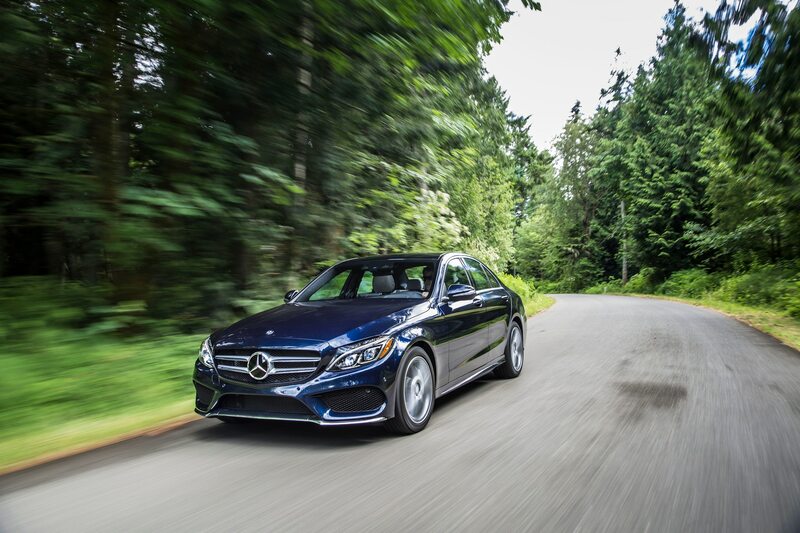 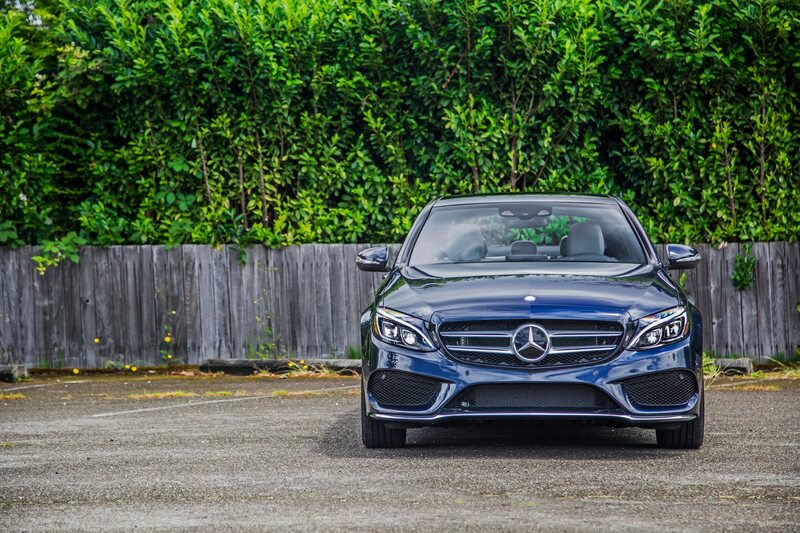 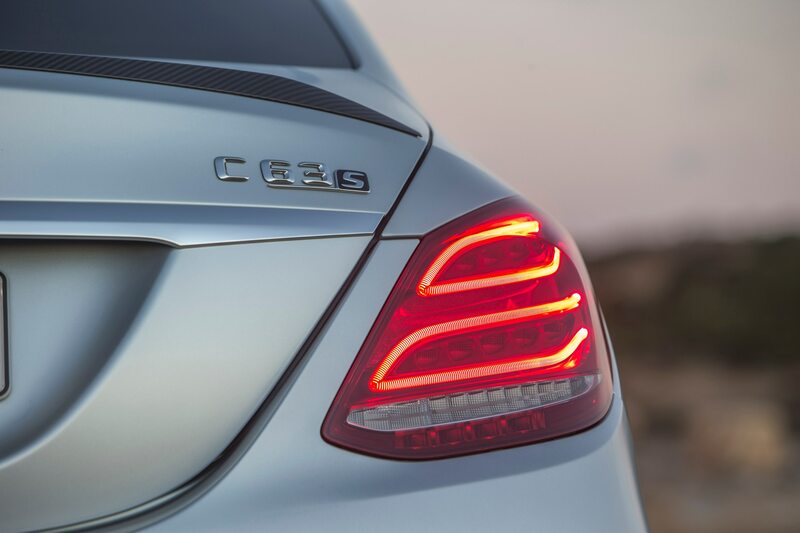 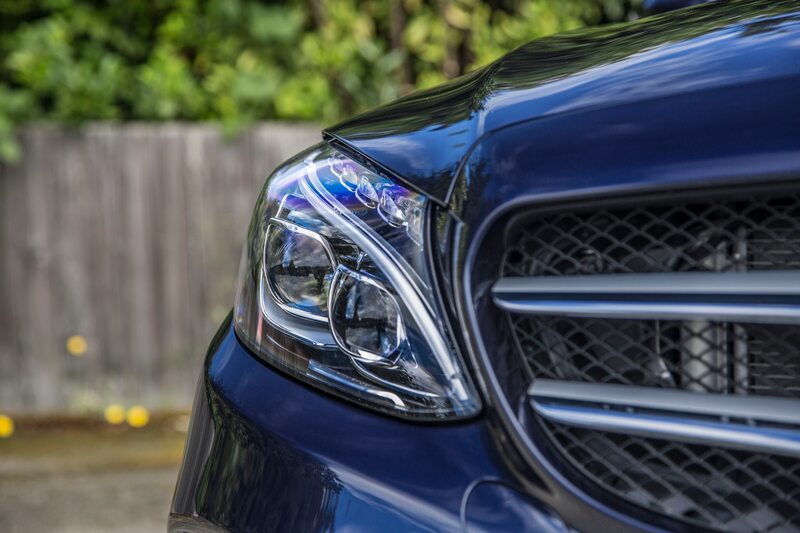 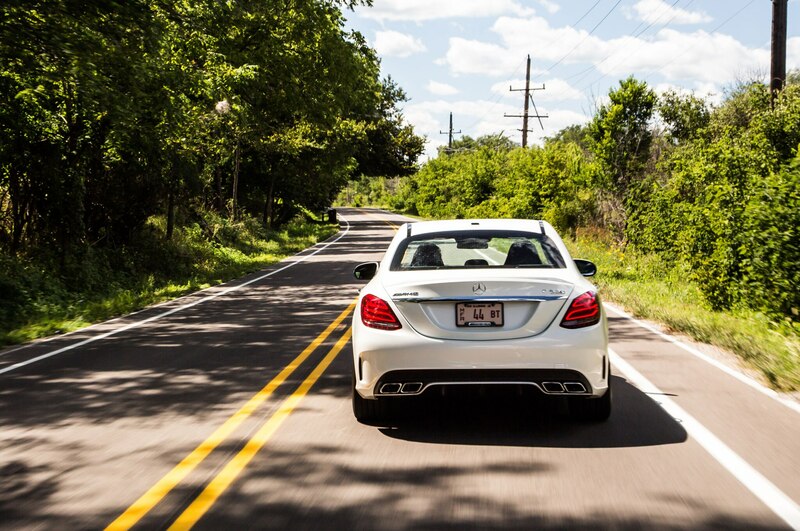 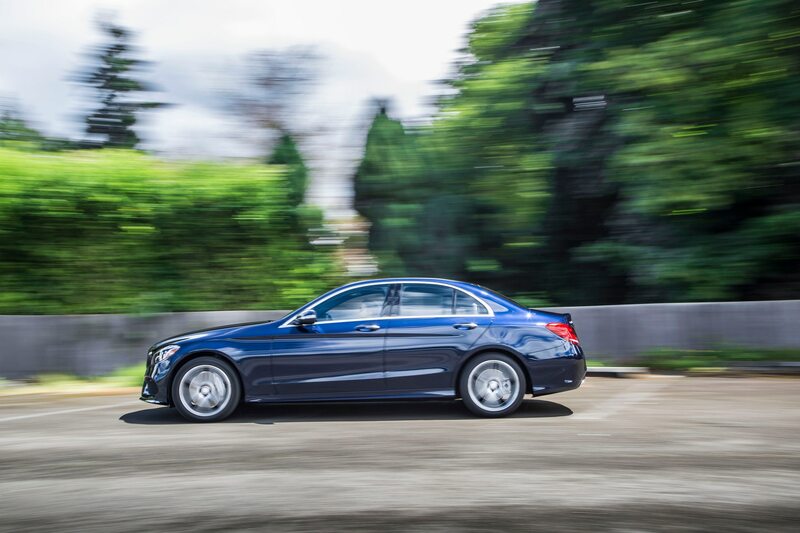 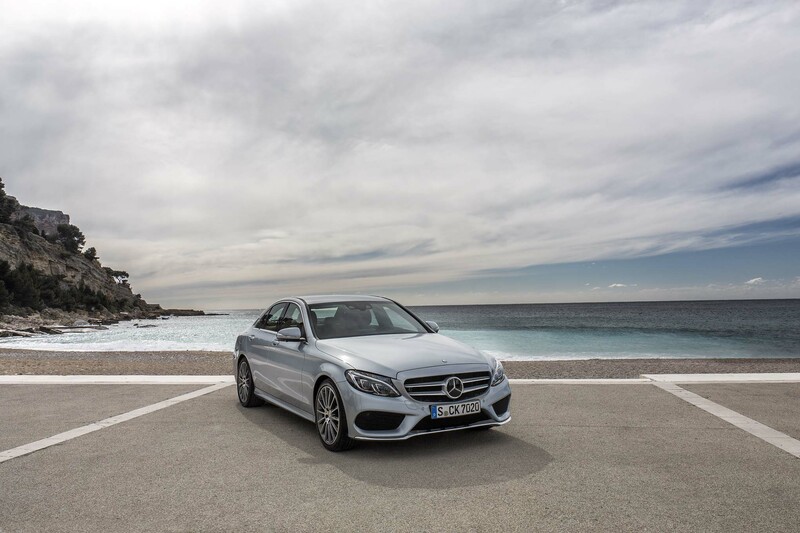 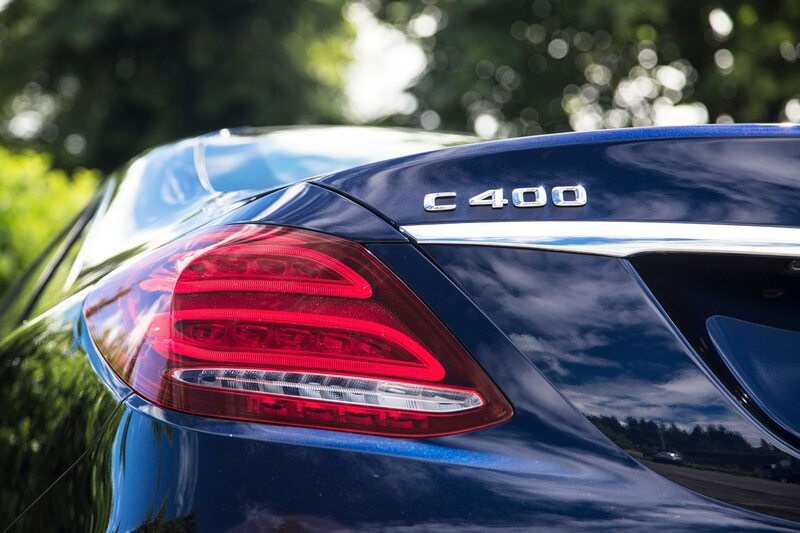 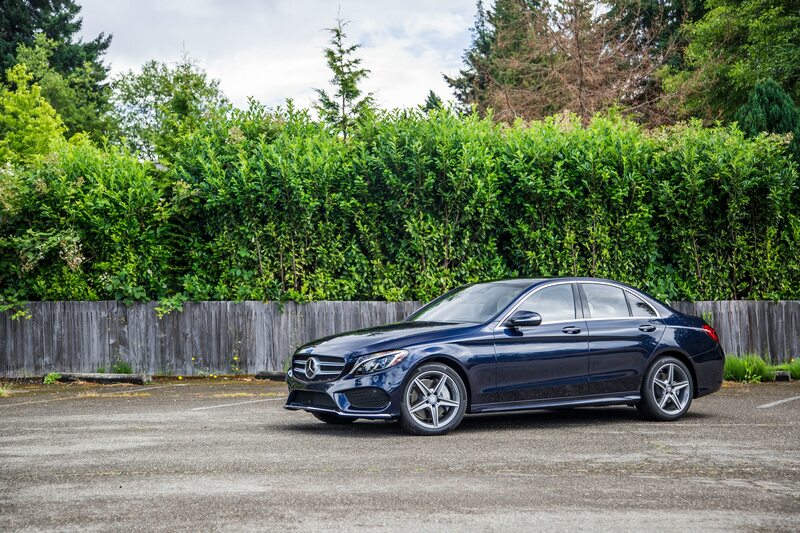 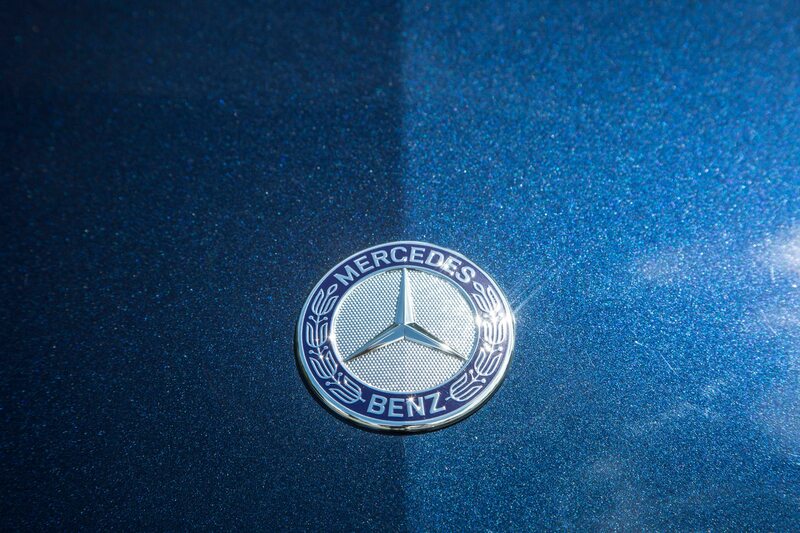 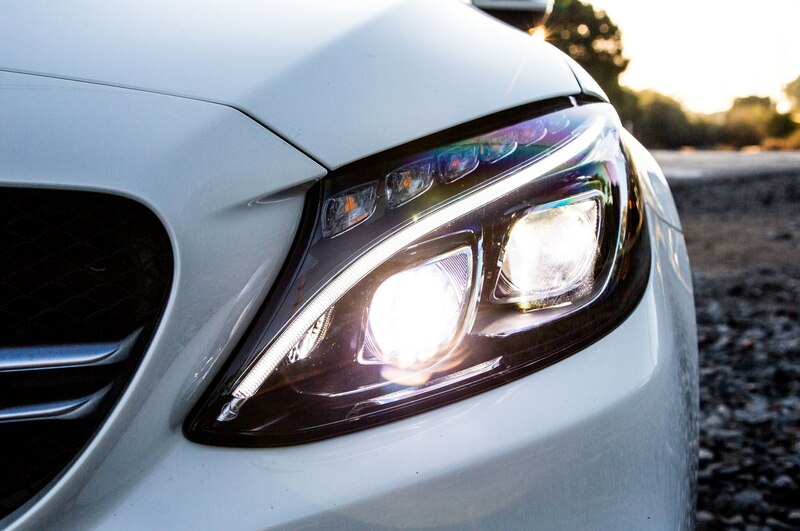 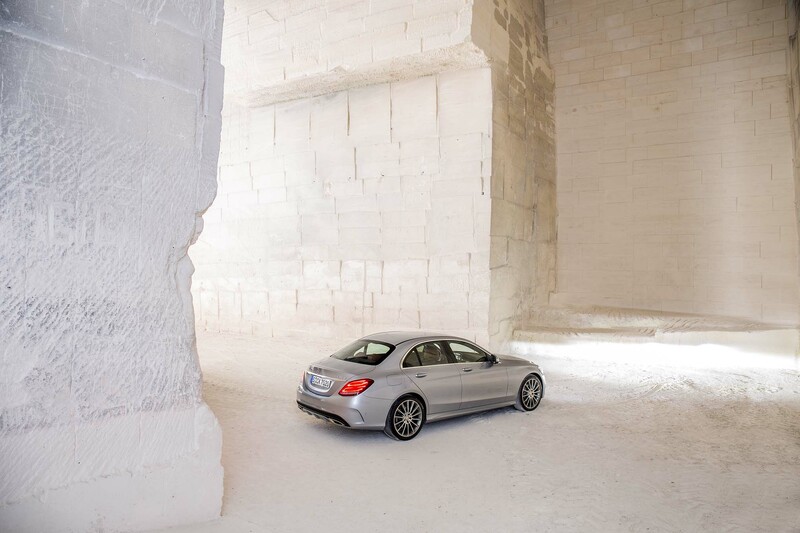 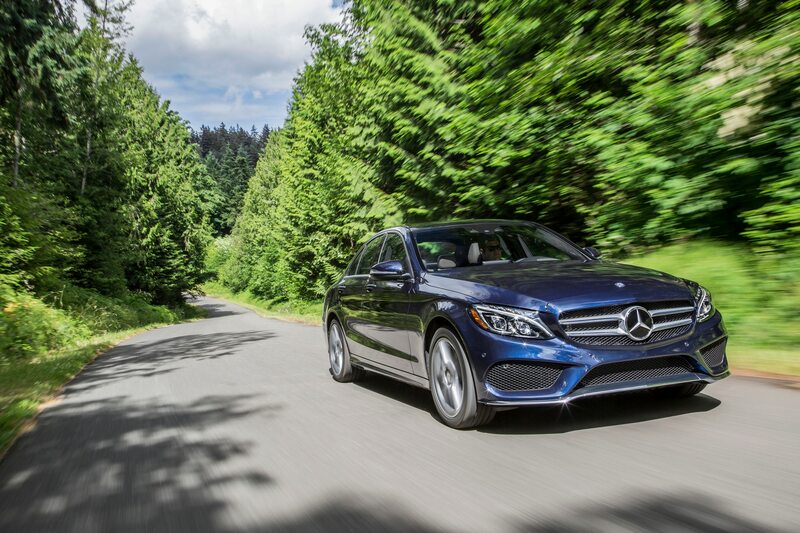 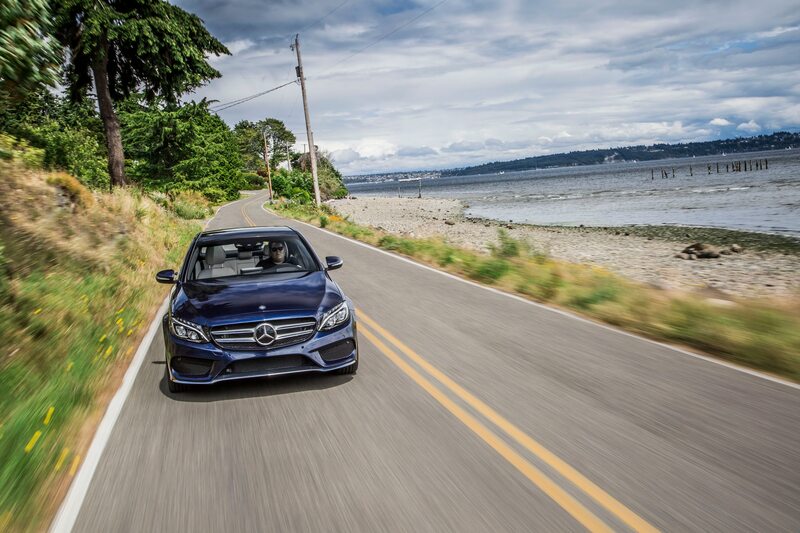 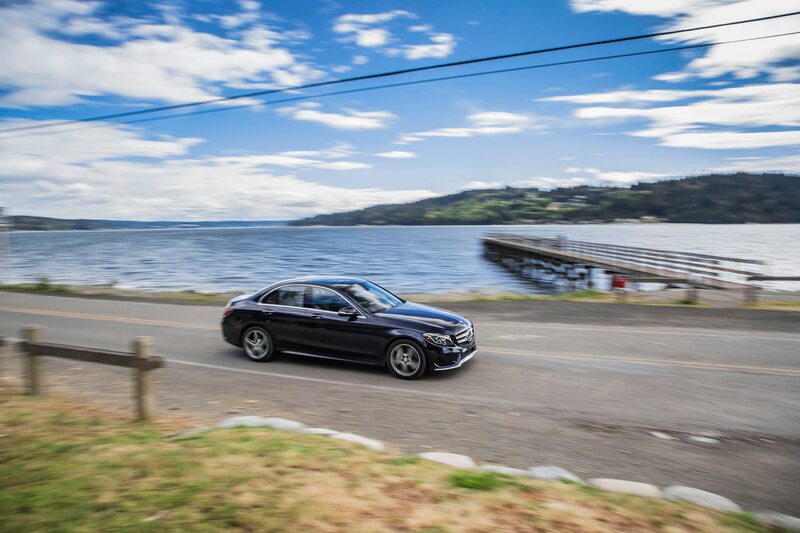 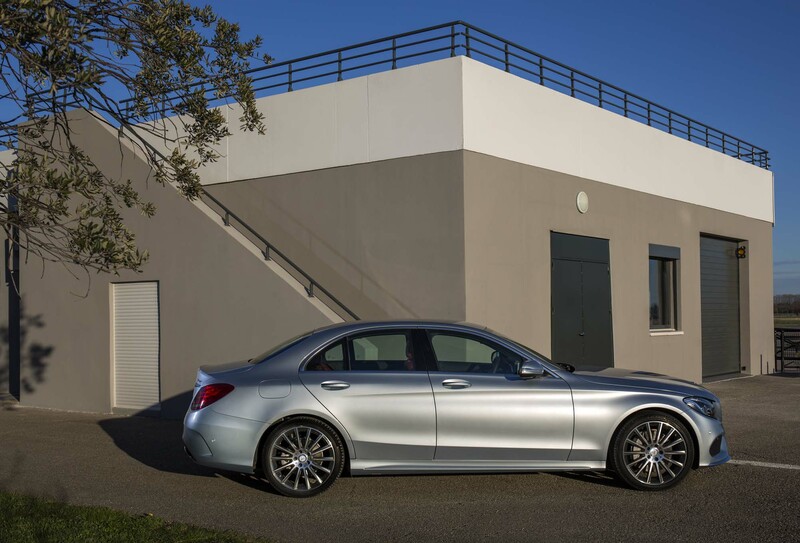 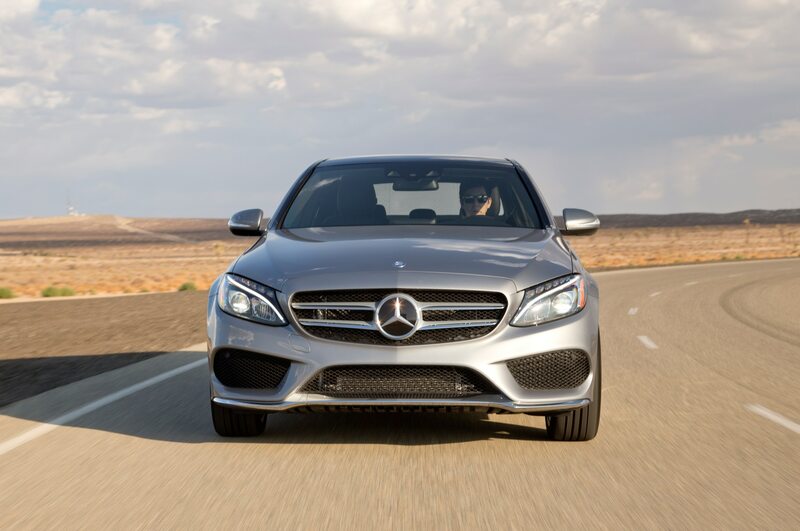 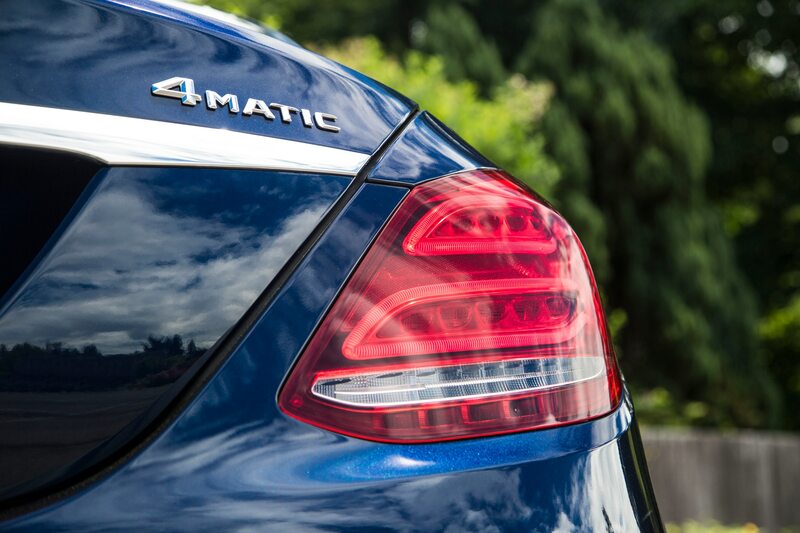 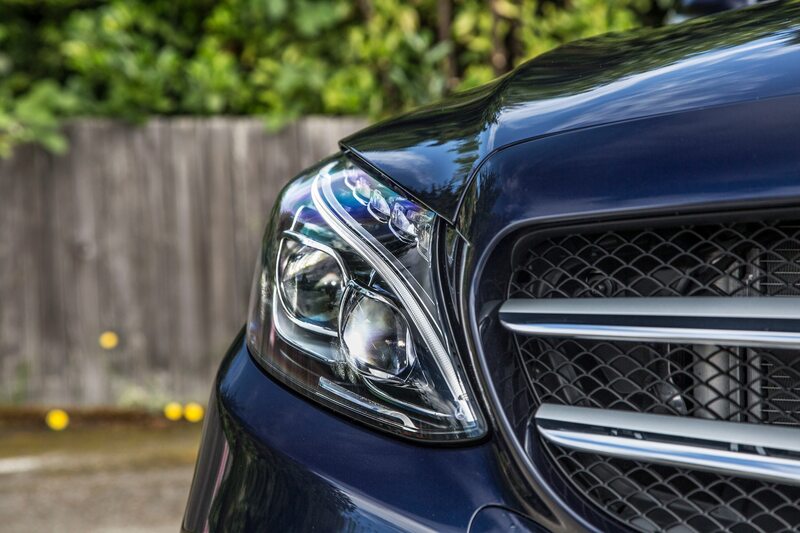 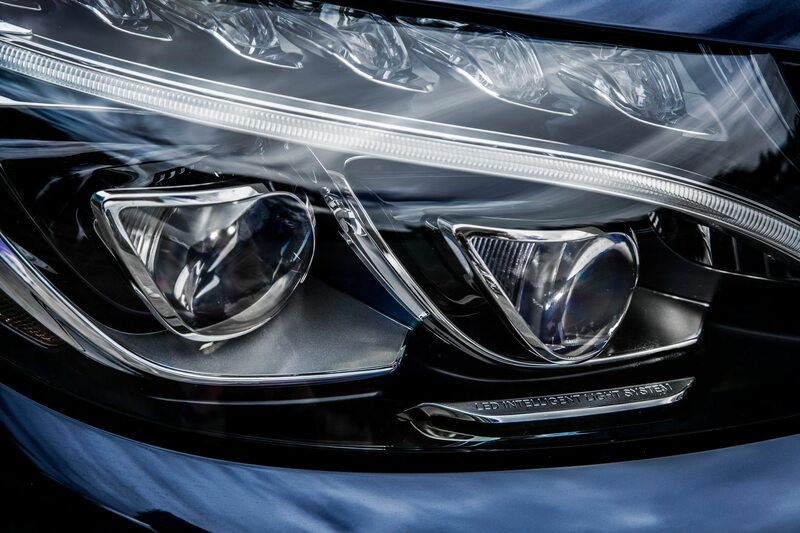 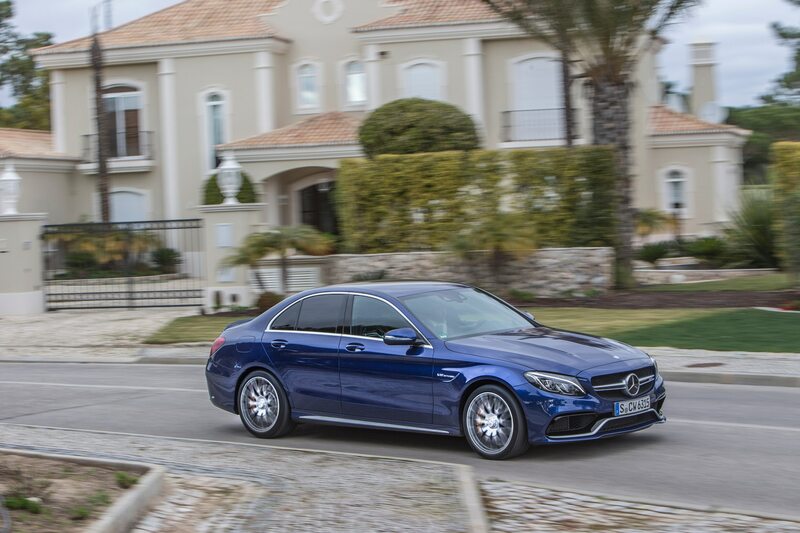 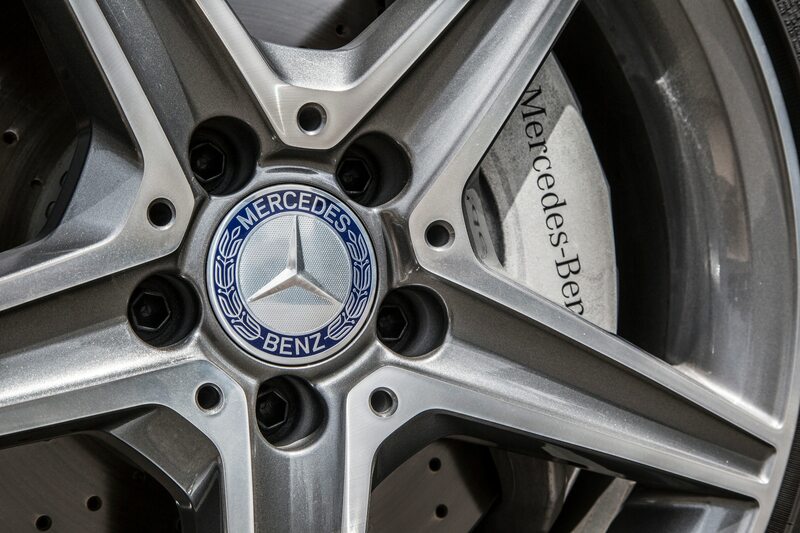 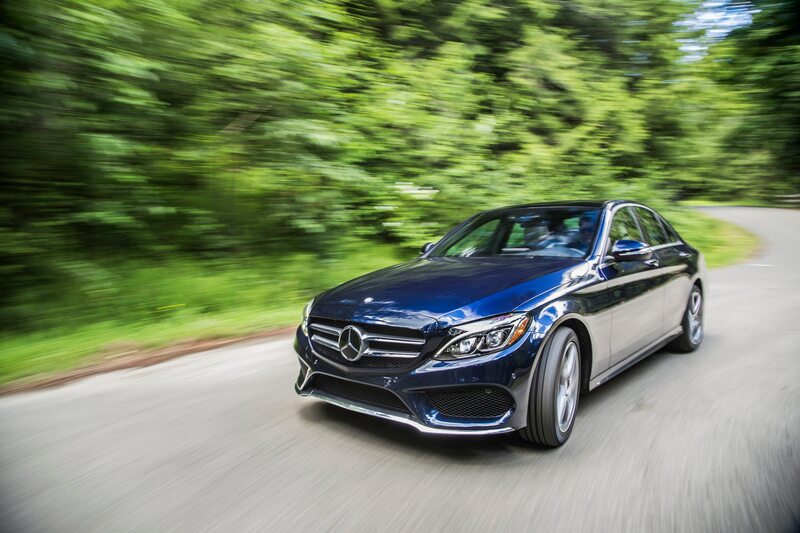 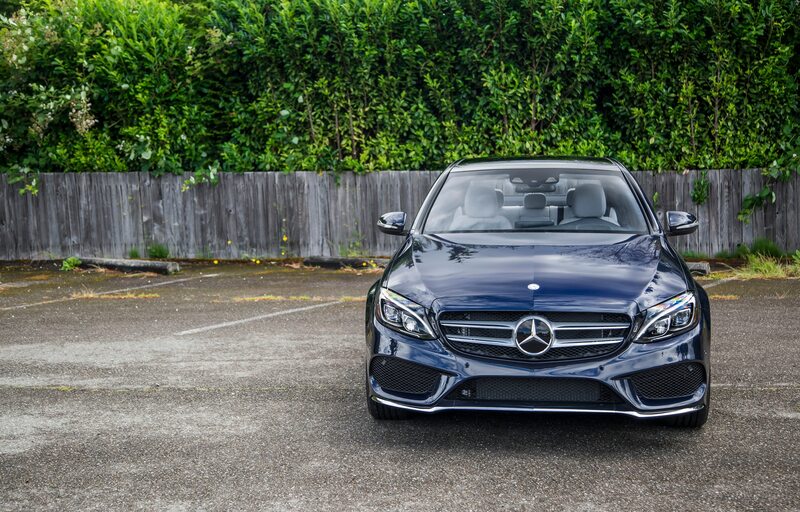 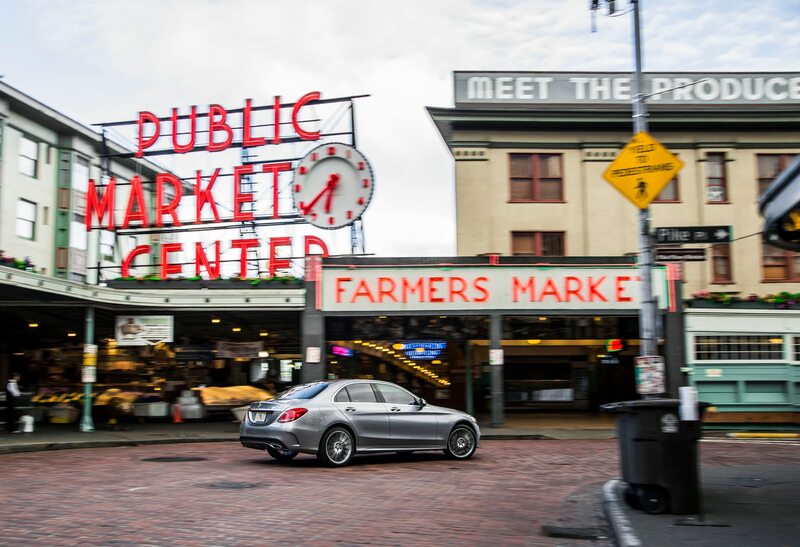 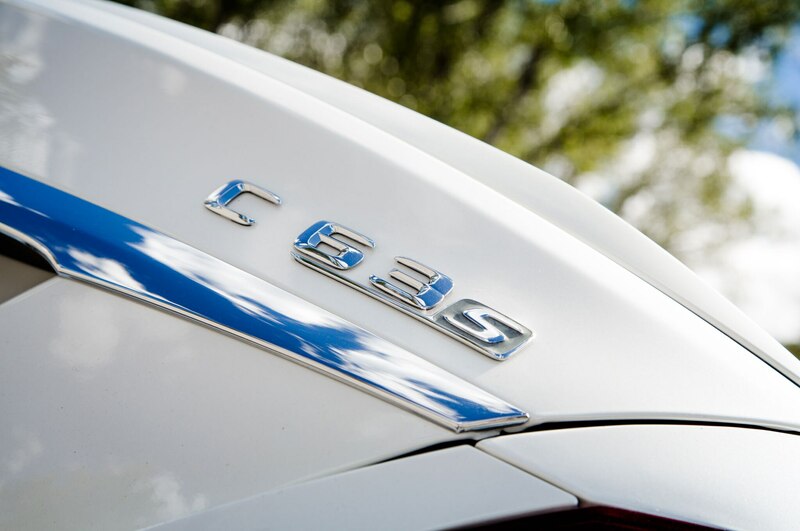 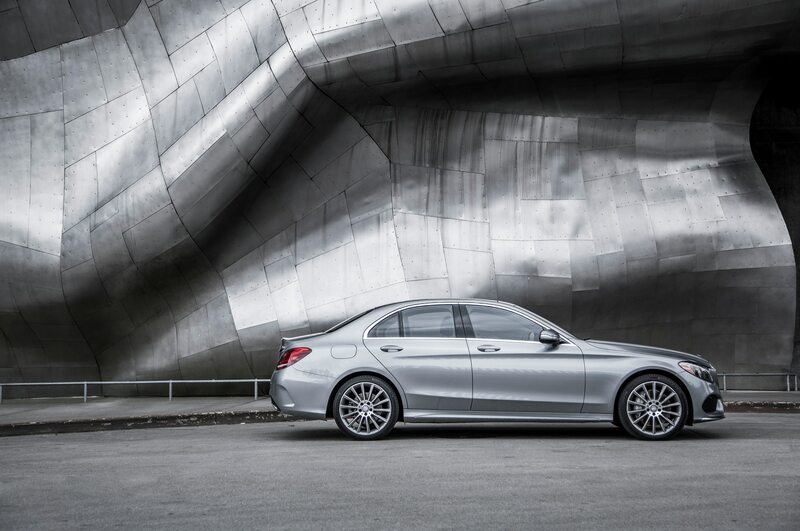 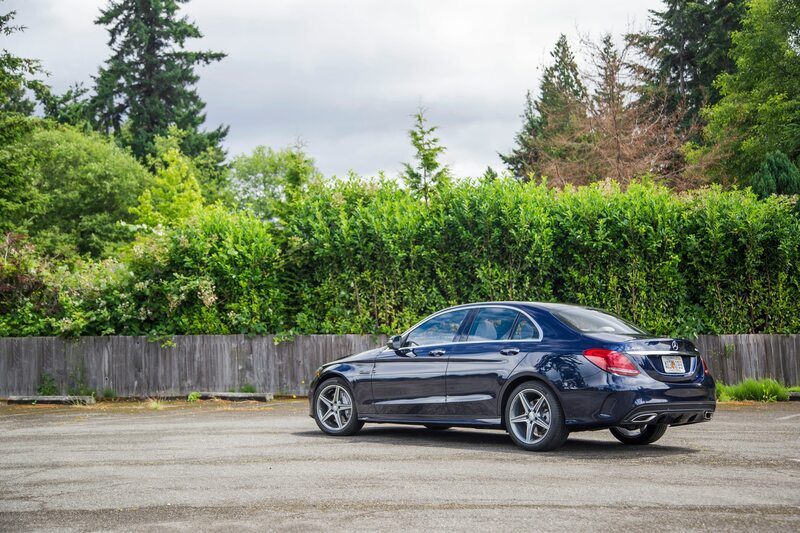 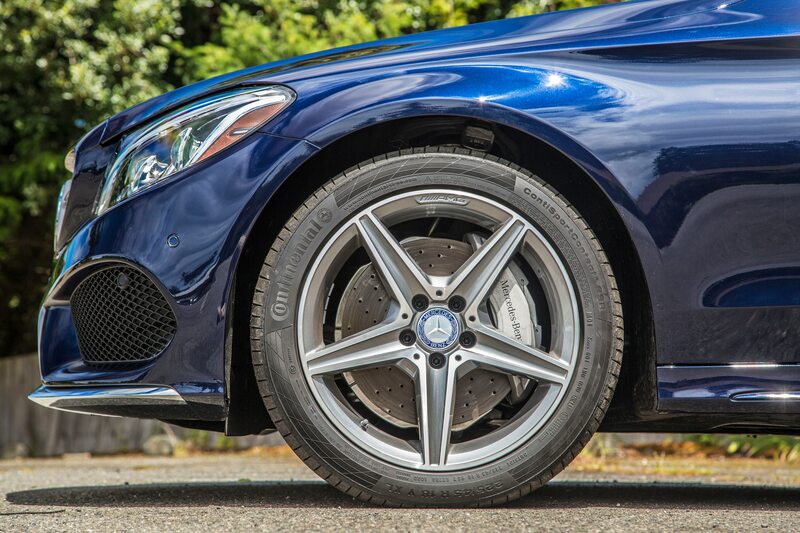 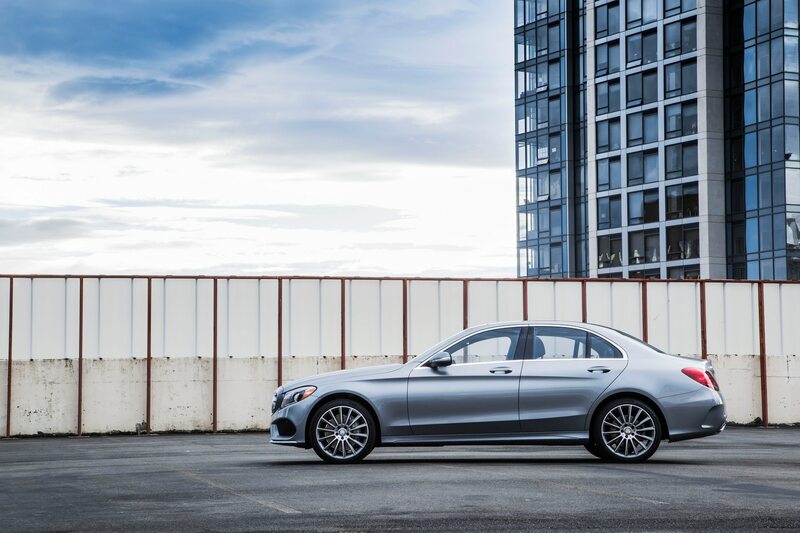 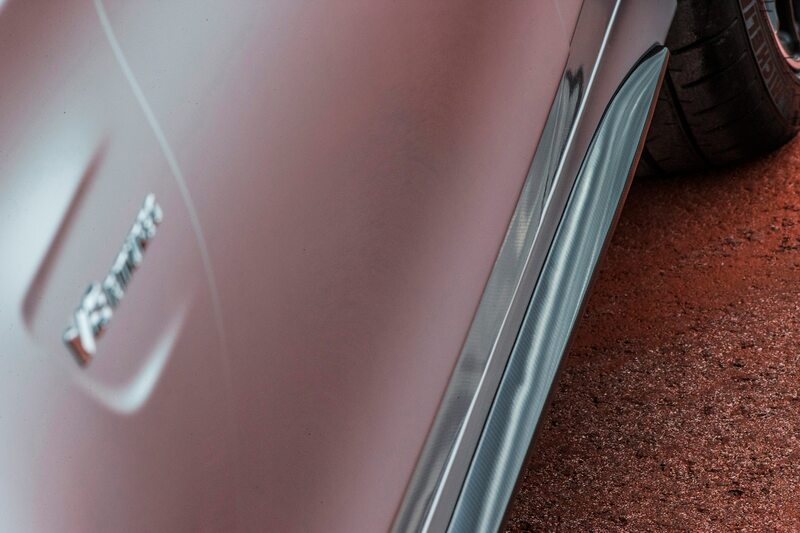 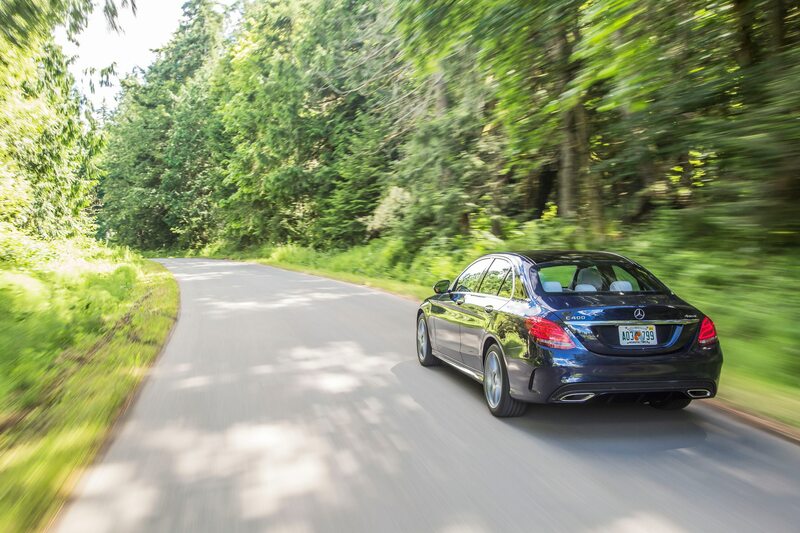 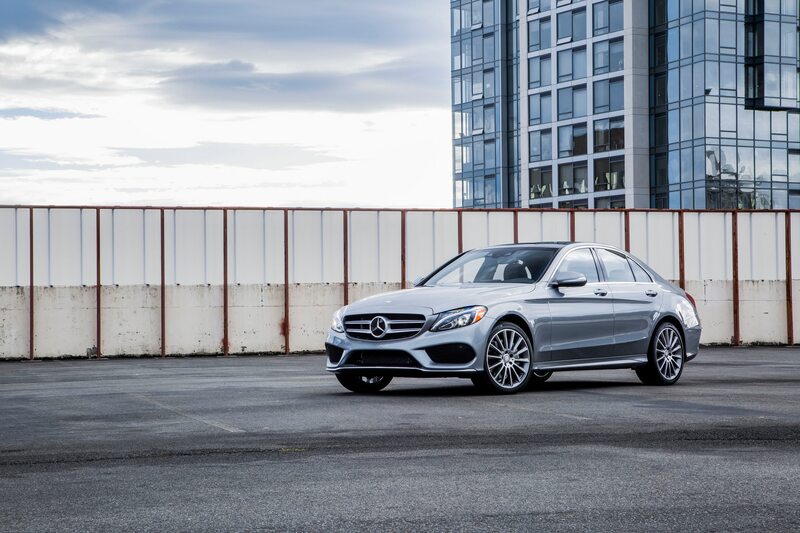 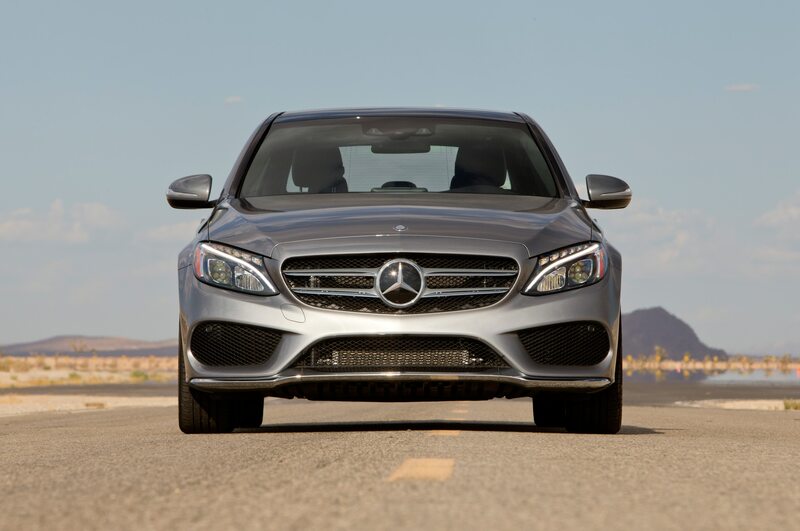 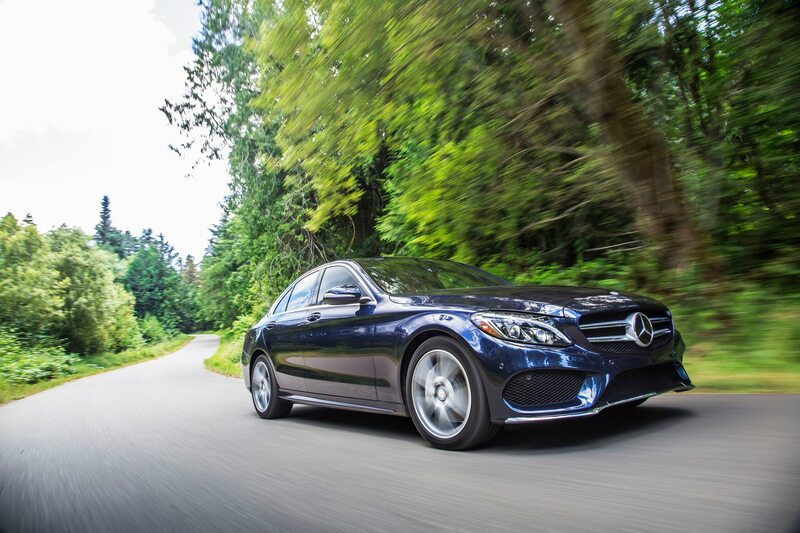 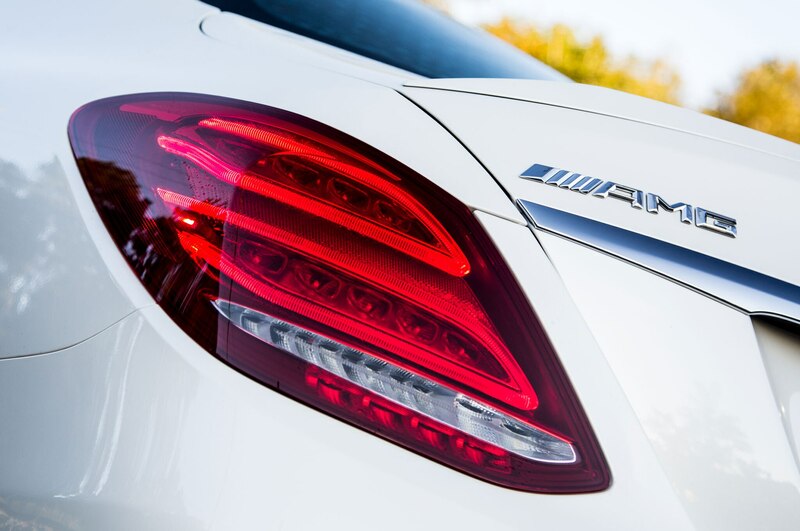 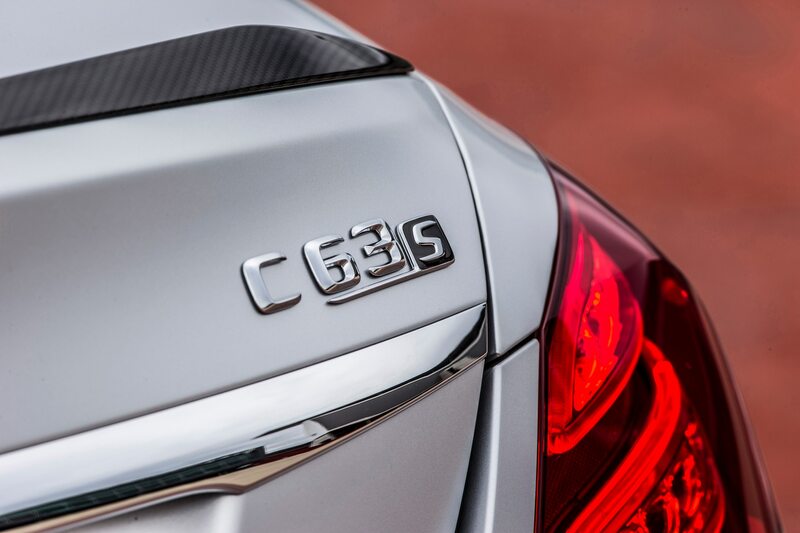 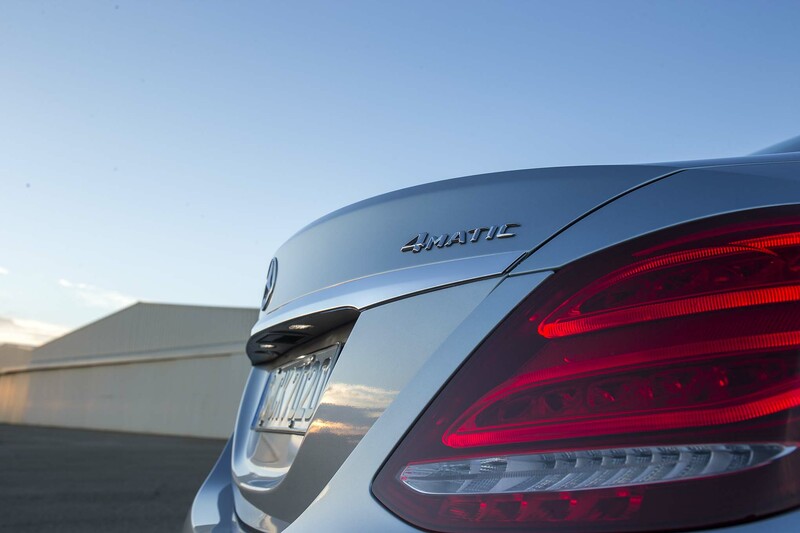 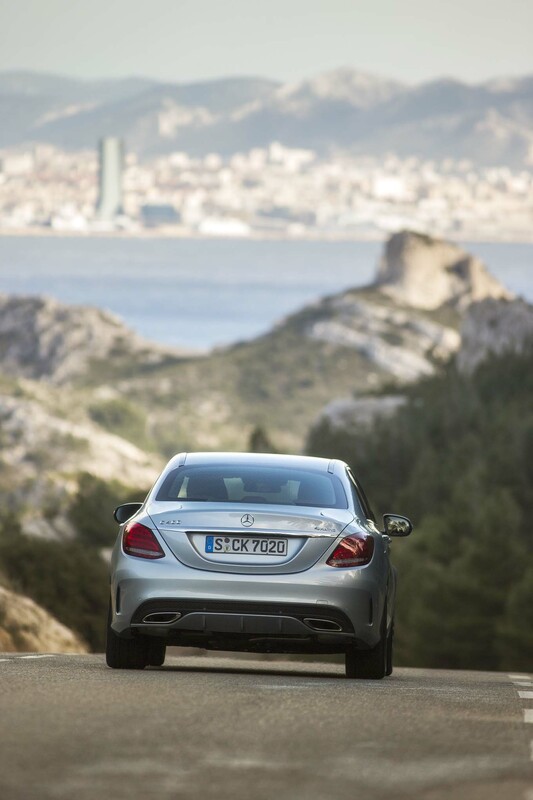 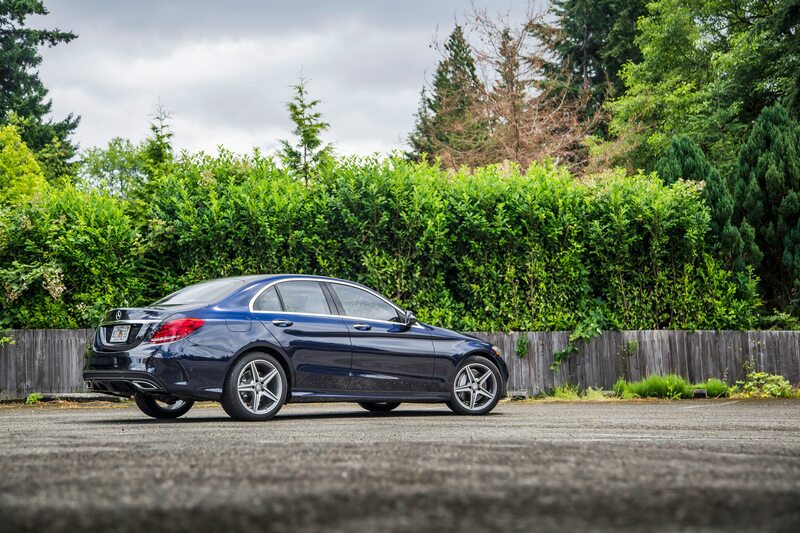 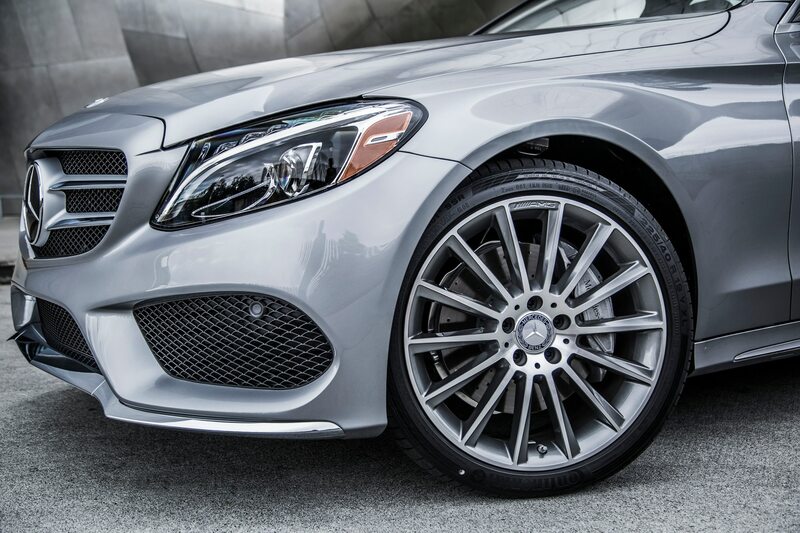 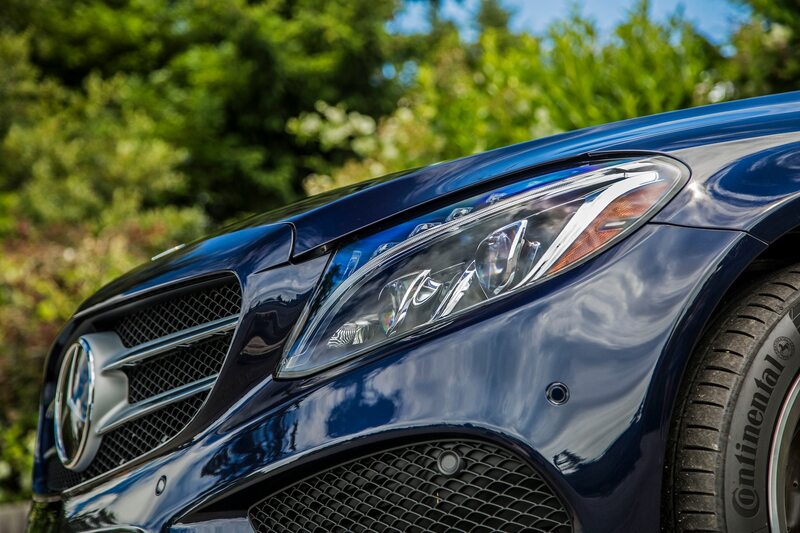 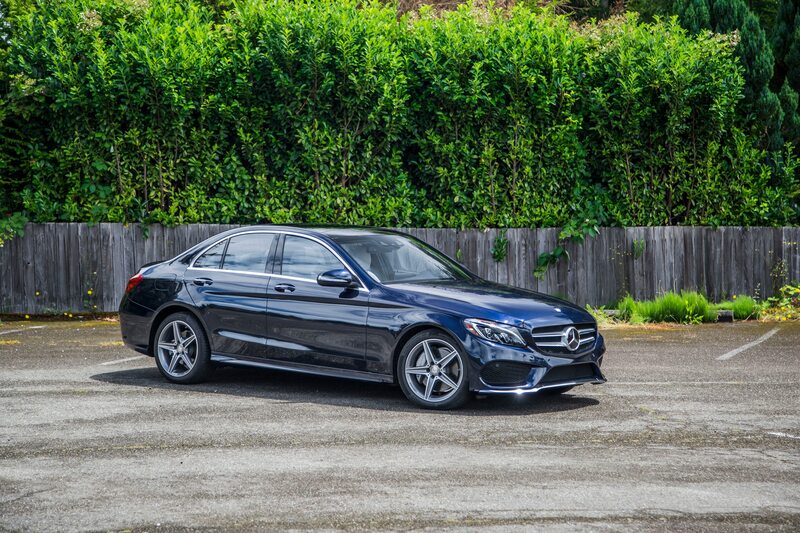 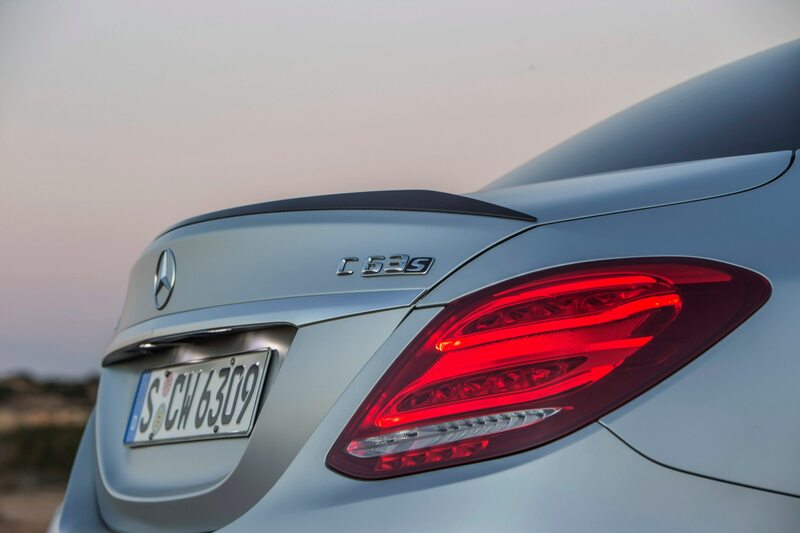 The Mercedes feels sharp, too, but less refined. 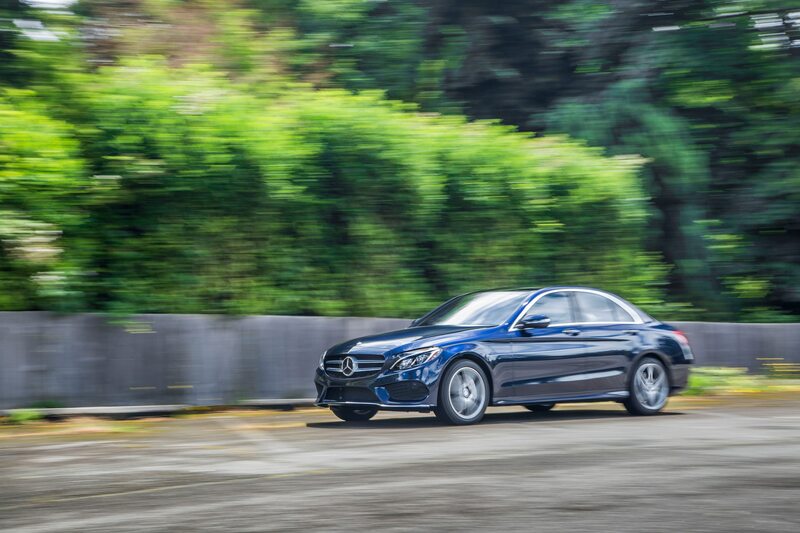 Its suspension pitches over potholes, and the steering, though much sharper than what’s in the regular C-Class, doesn’t load up as naturally as in the ATS-V. 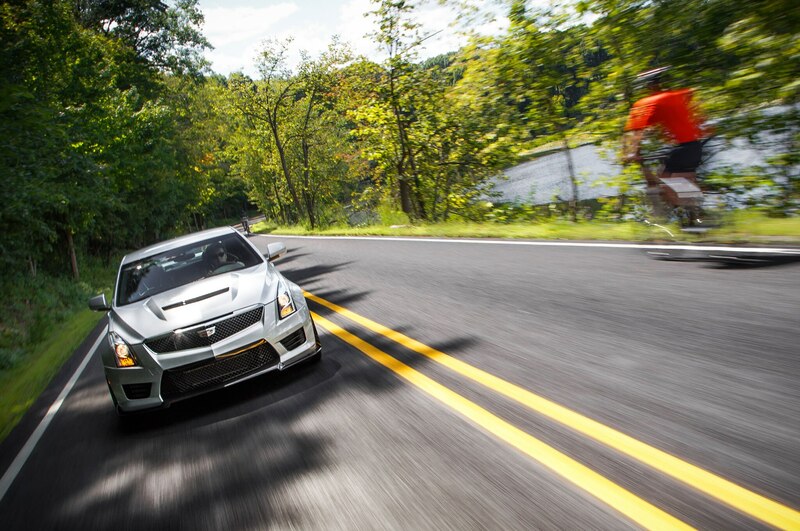 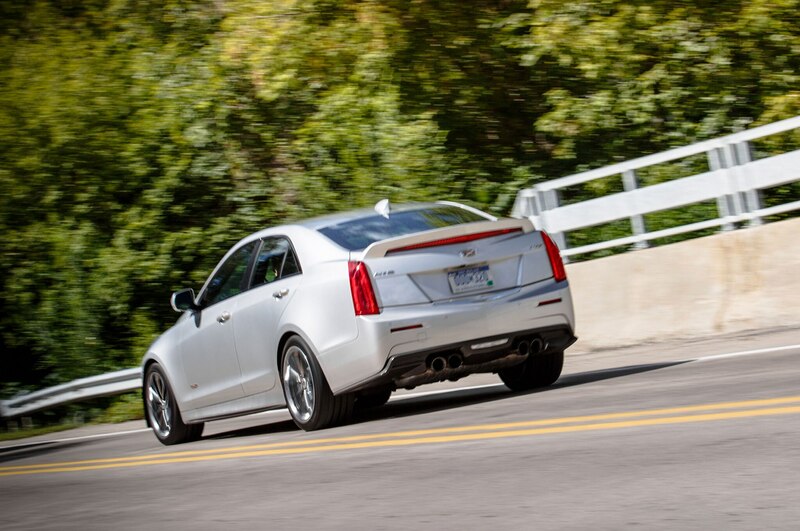 But it’s at Gingerman Raceway where the ATS-V truly sings. 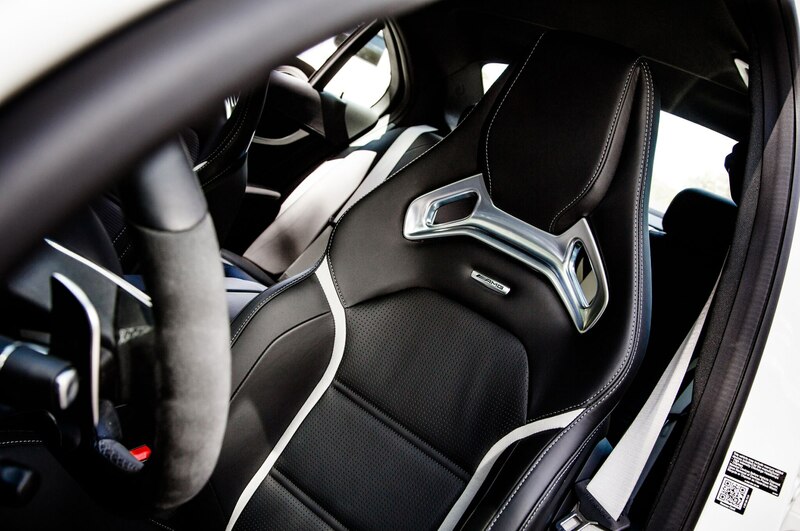 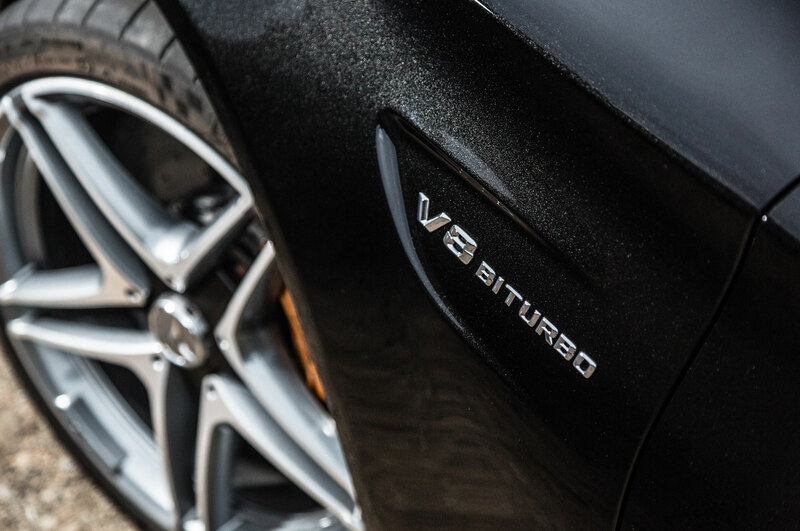 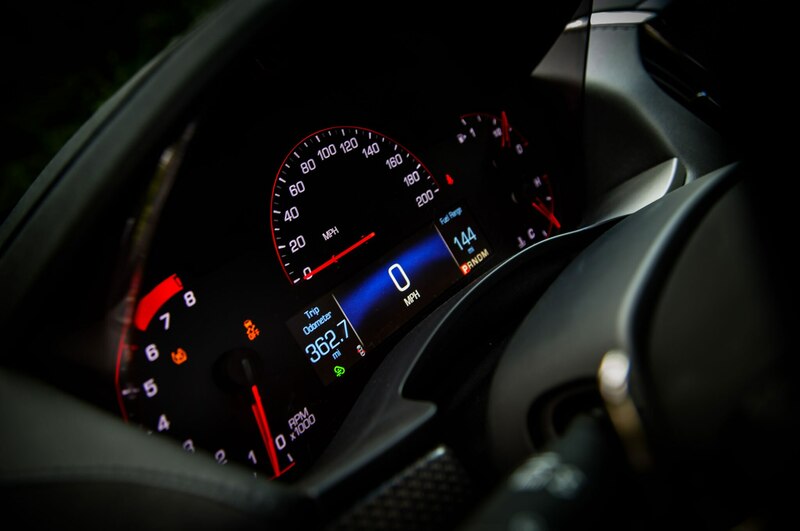 The turbo V-6 purrs contentedly through the long straights, the brake pedal responds with first-stop urgency after a dozen laps, and the steering loads up reassuringly as you turn into a corner. 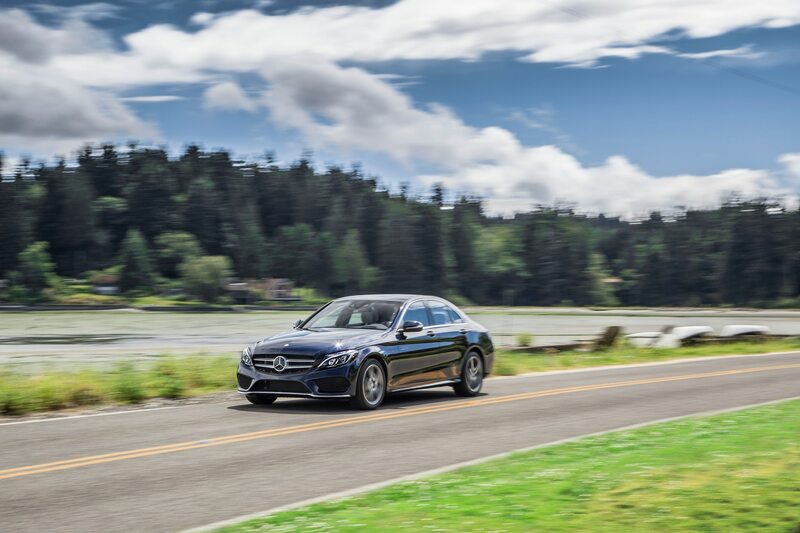 Its electronic limited-slip differential and sophisticated traction control system help you deliver just the right amount of power to the rear wheels to arc through the apex. 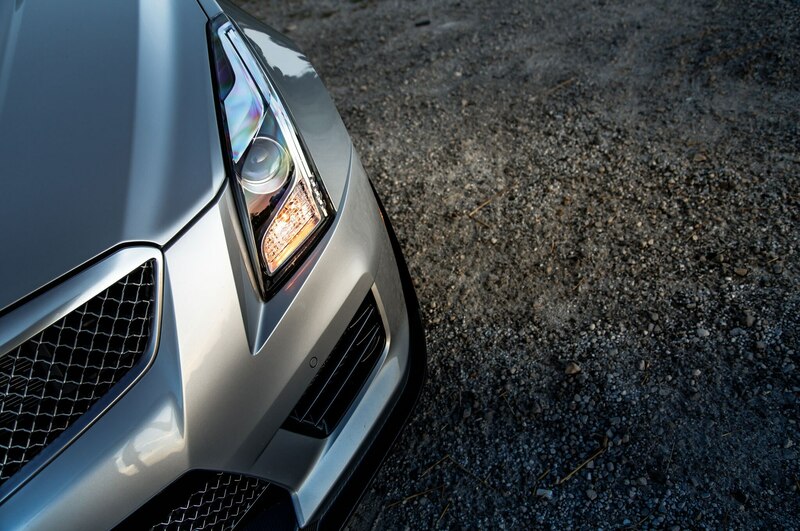 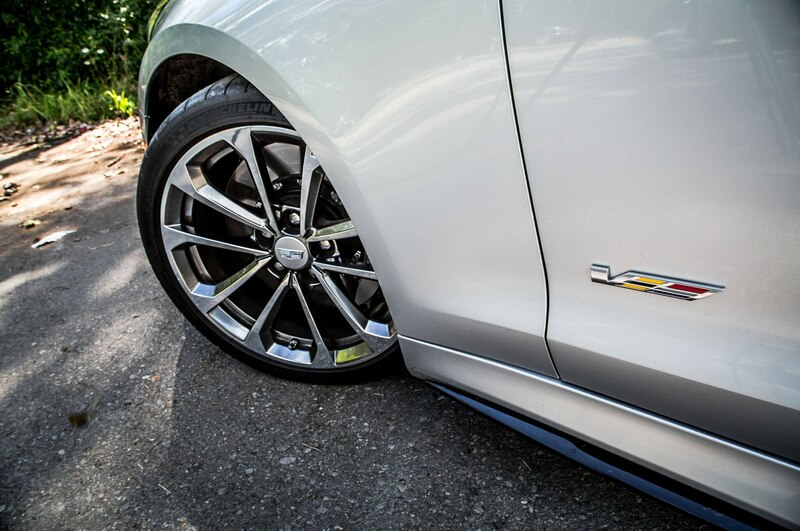 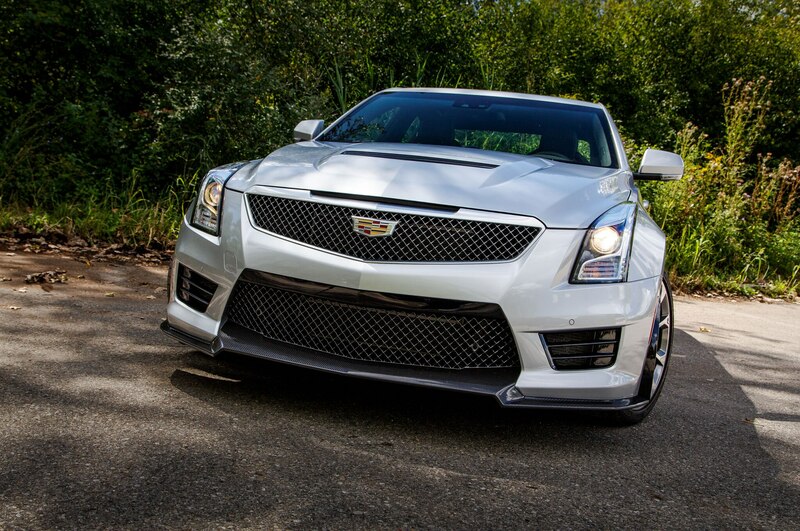 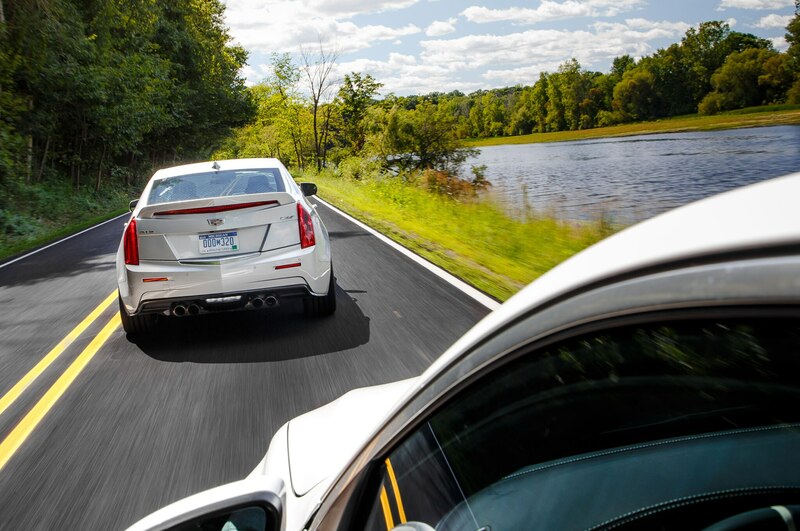 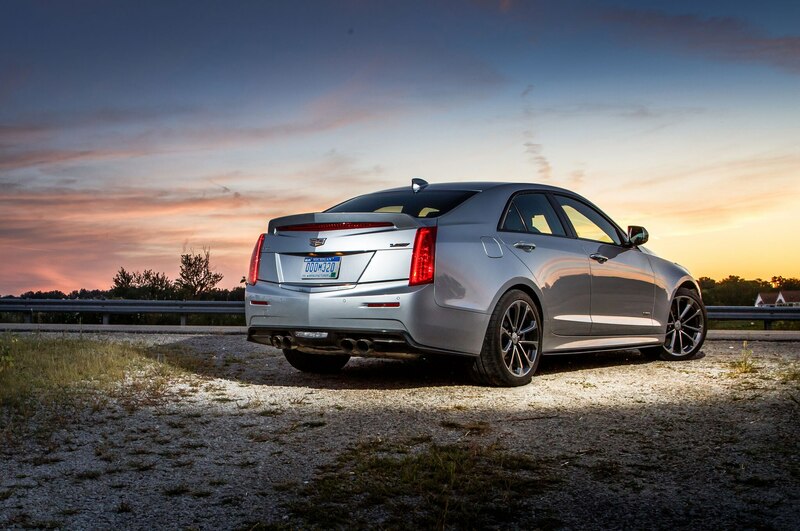 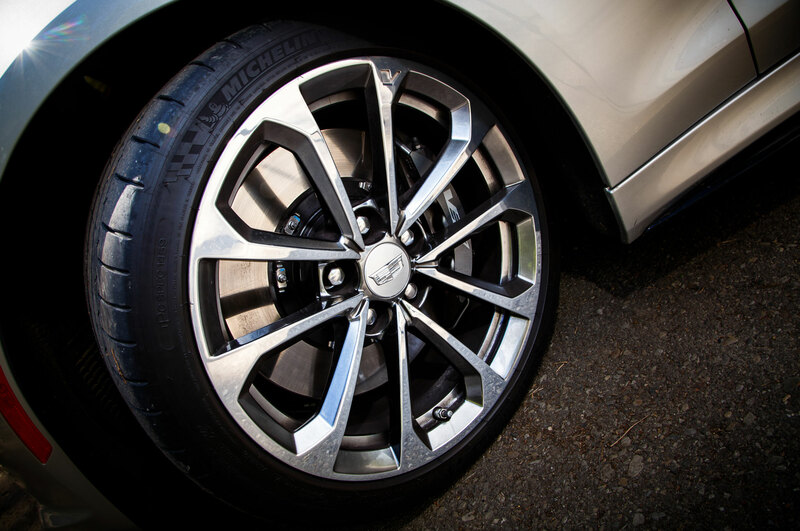 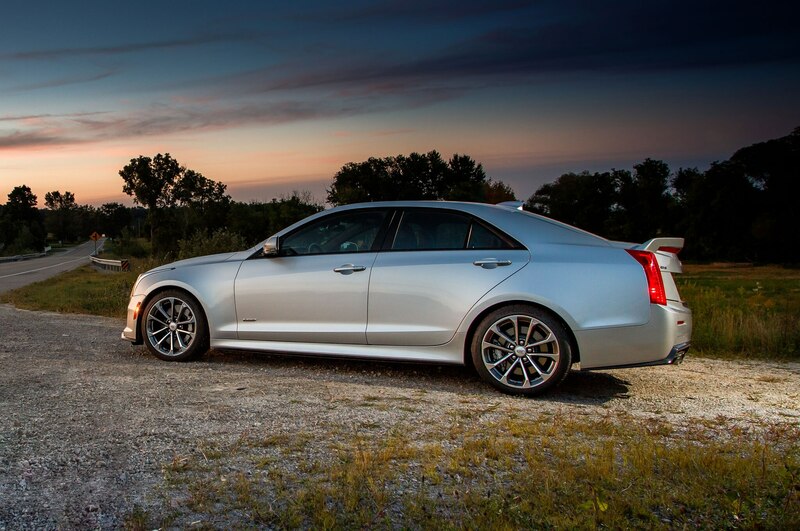 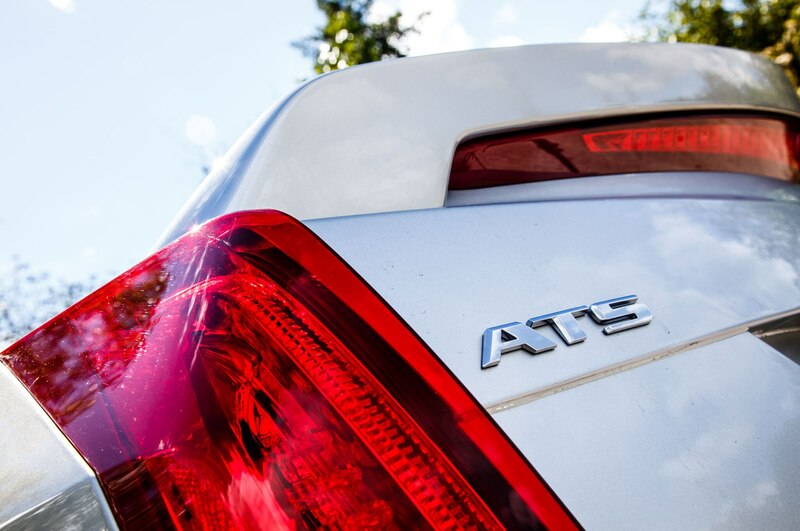 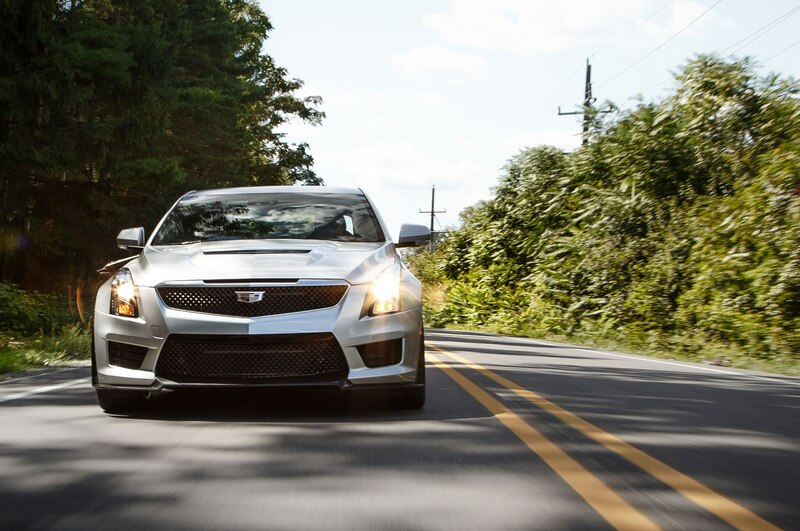 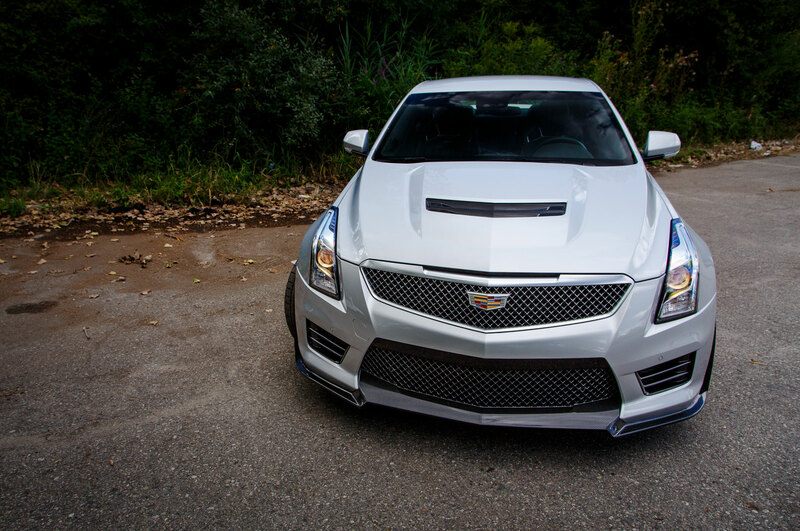 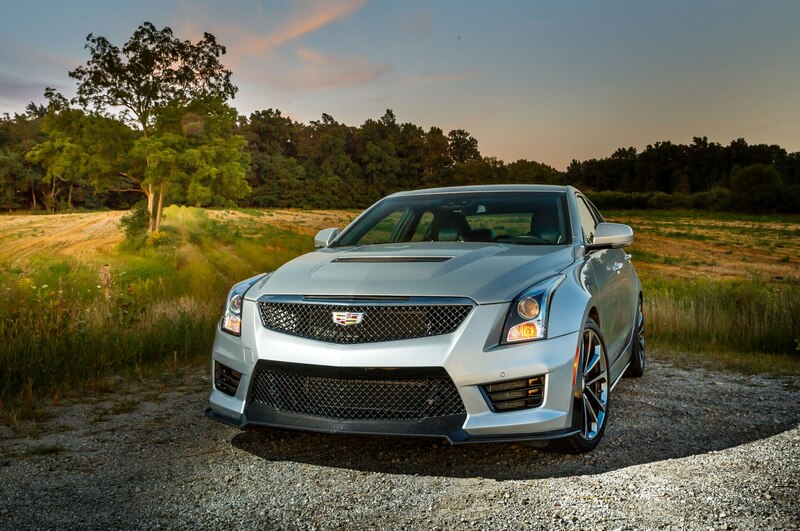 The ATS-V is as graceful on the track as Muhammad Ali in the ring: fluid, coordinated, and razor sharp. 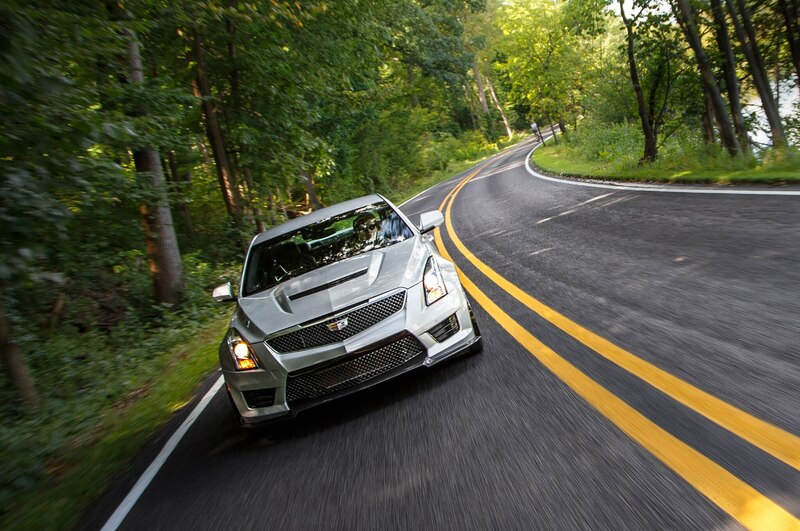 The resulting battle at Gingerman Raceway is not at all unlike the Rumble in the Jungle. 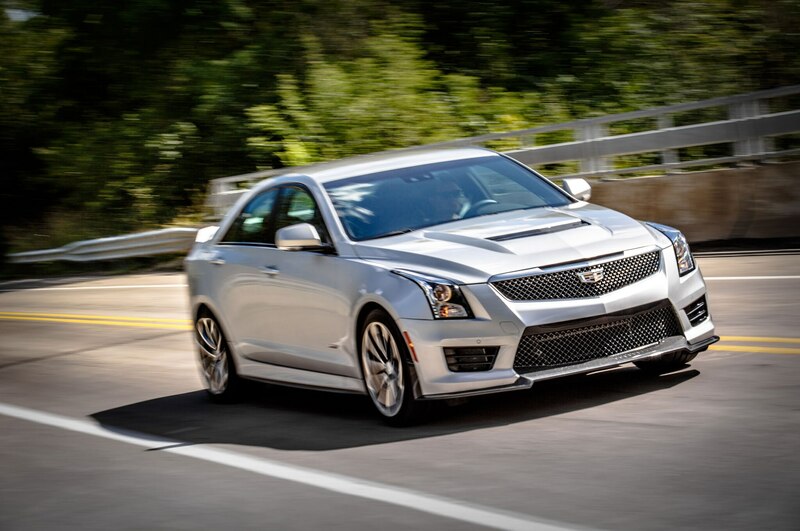 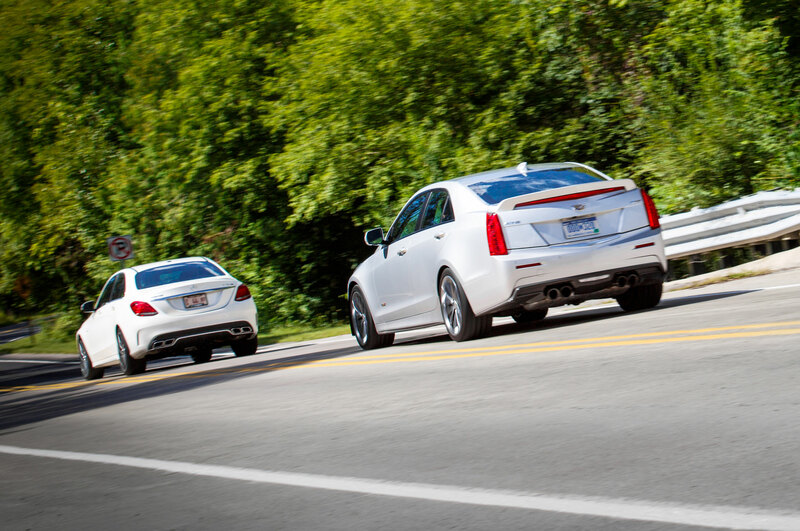 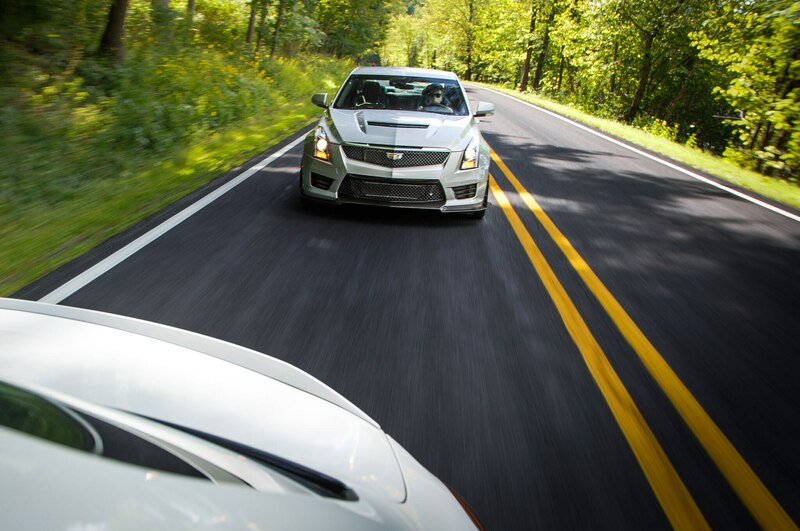 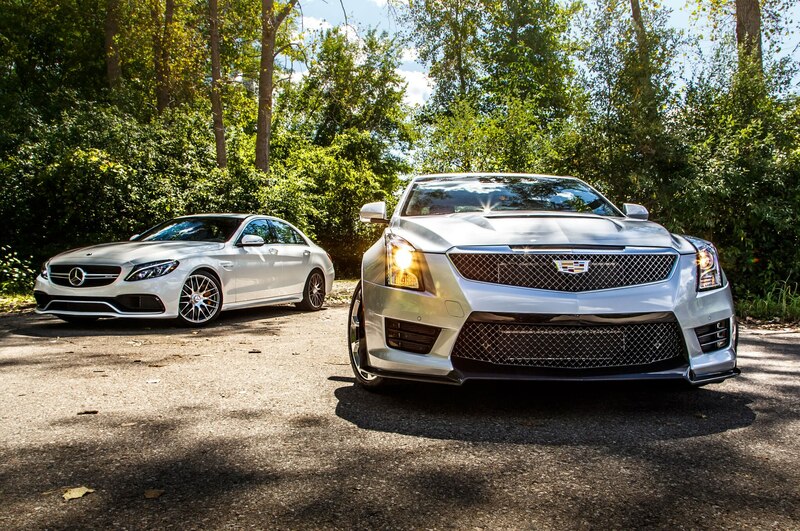 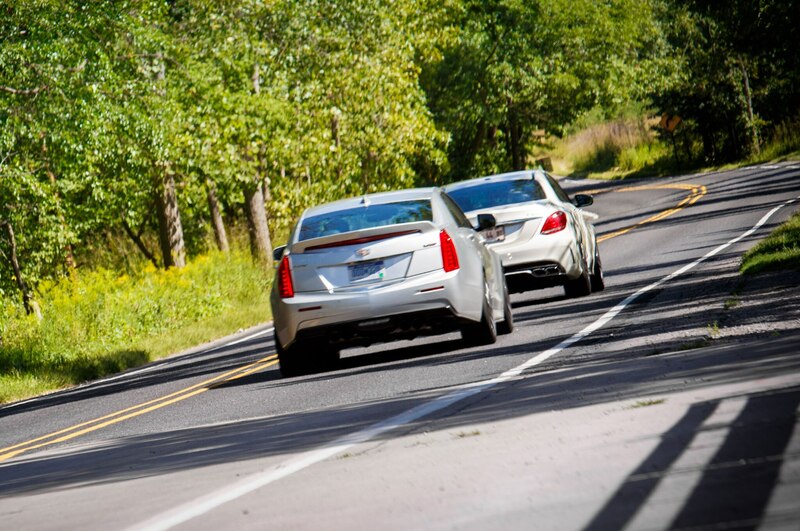 The ATS plays rope-a-dope for a couple of laps, falling back on the straights as the Mercedes unloads its 503 hp, and then the Caddy plays catch-up in the corners. 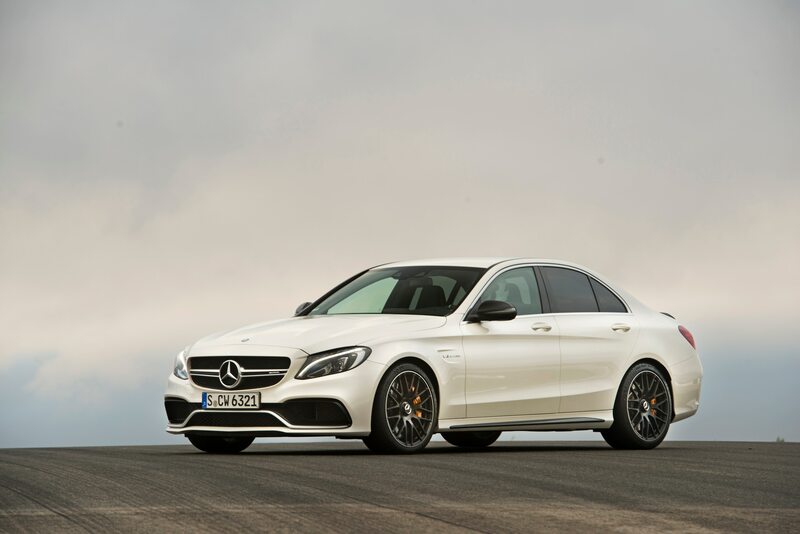 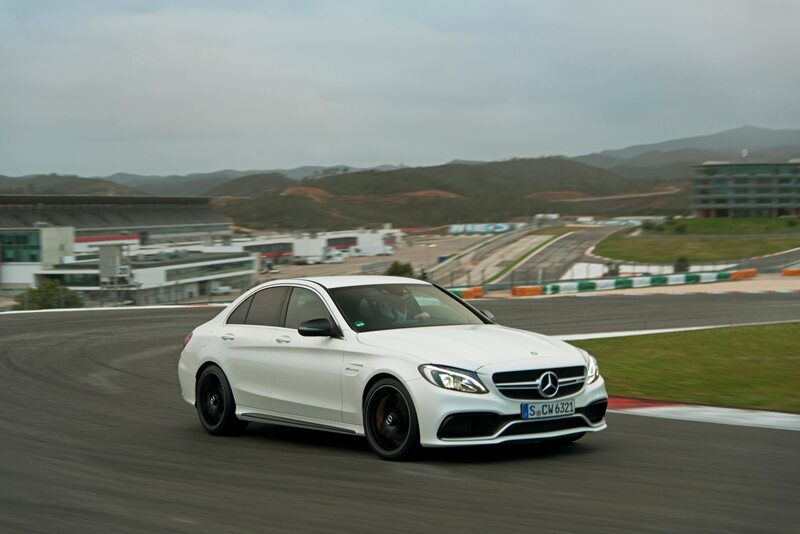 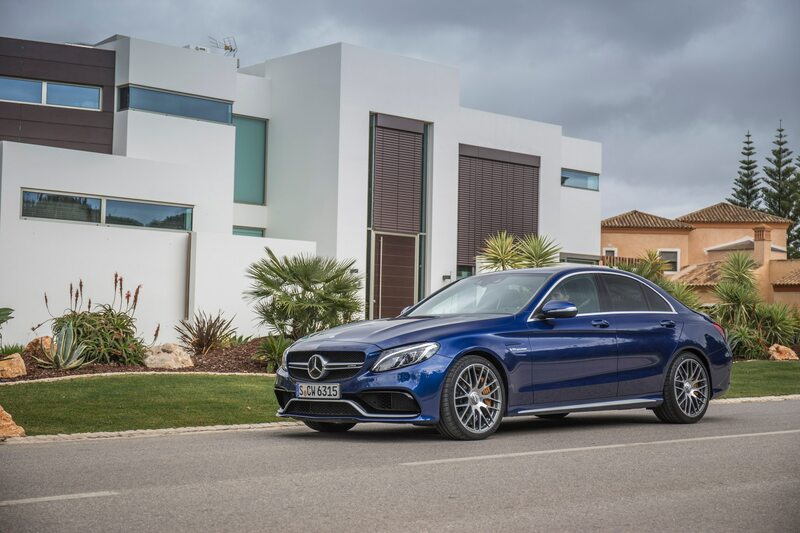 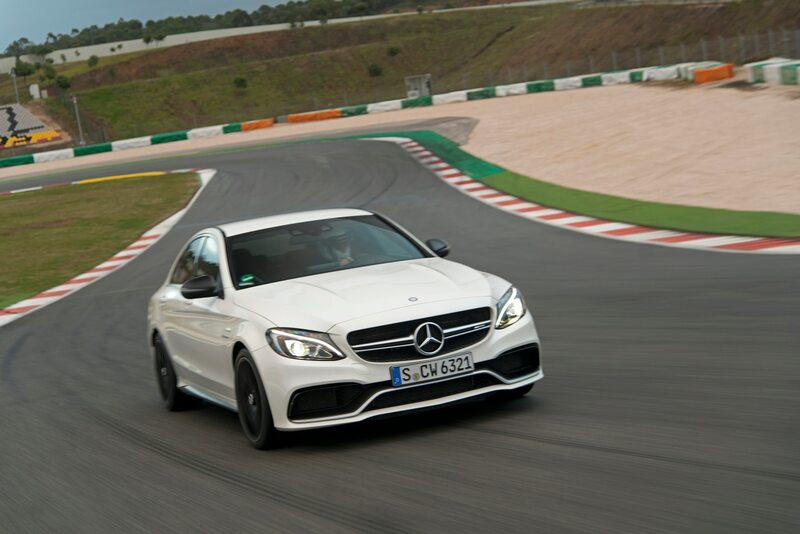 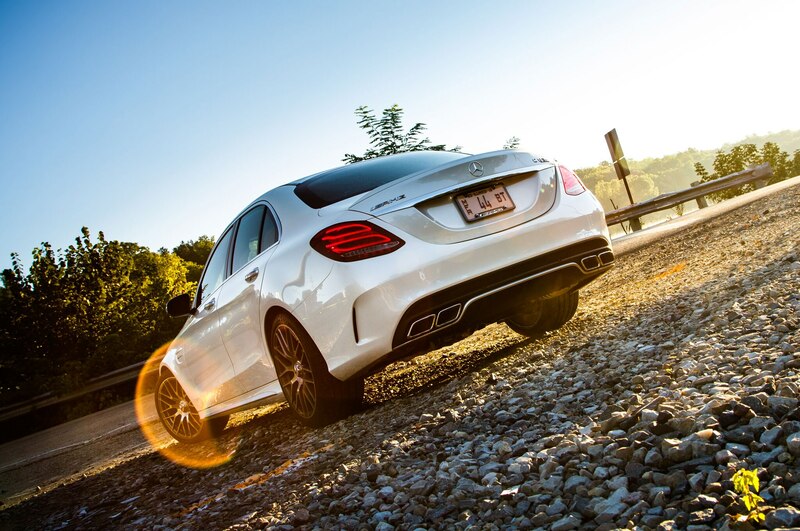 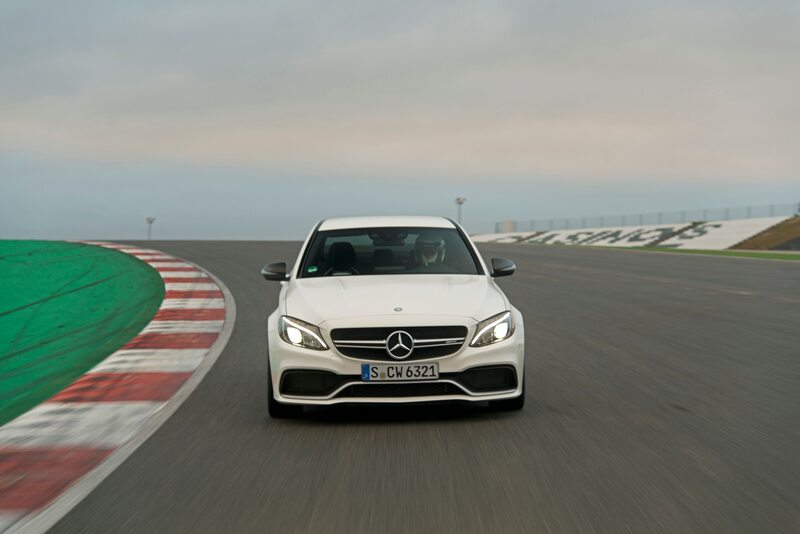 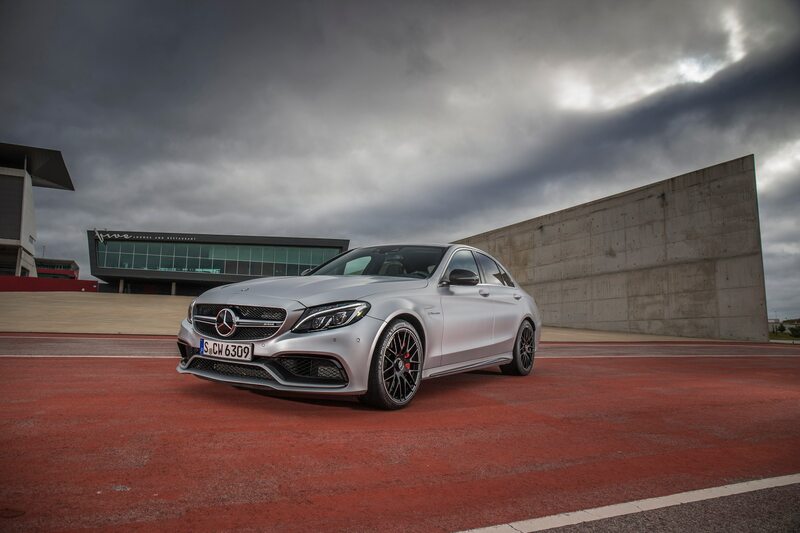 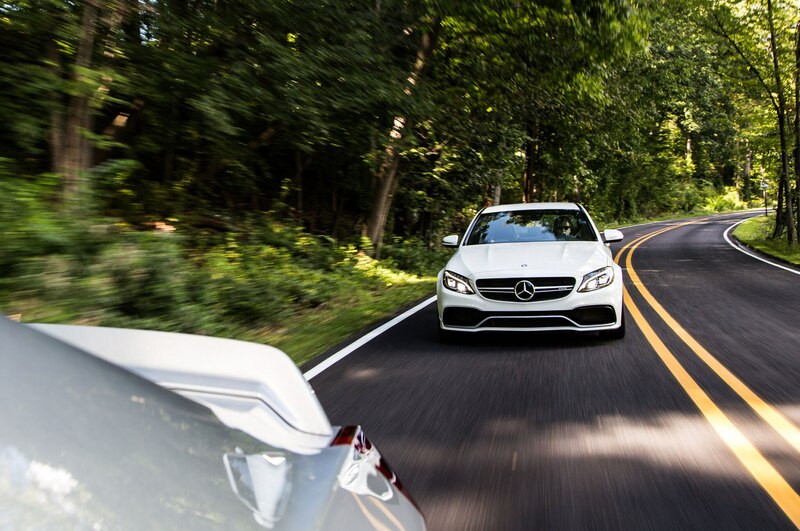 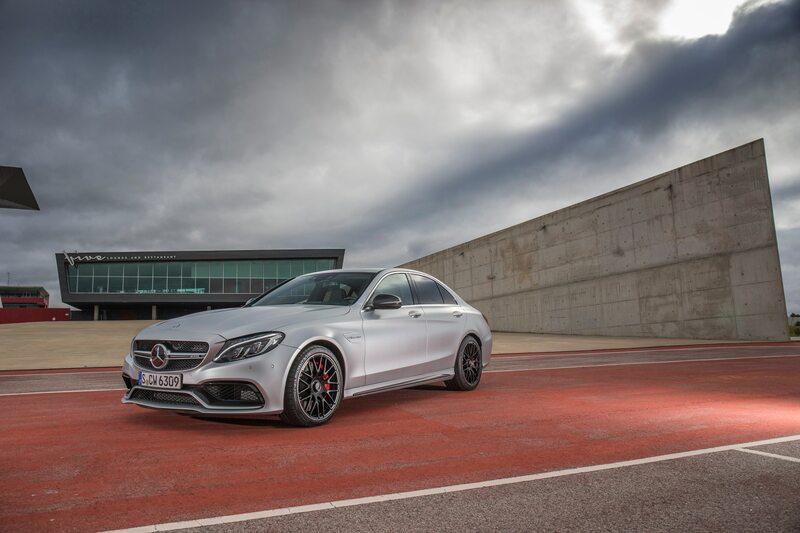 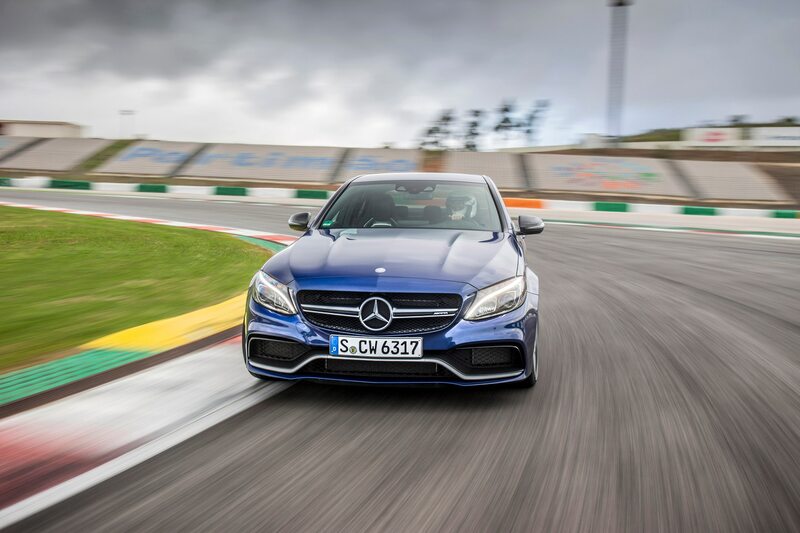 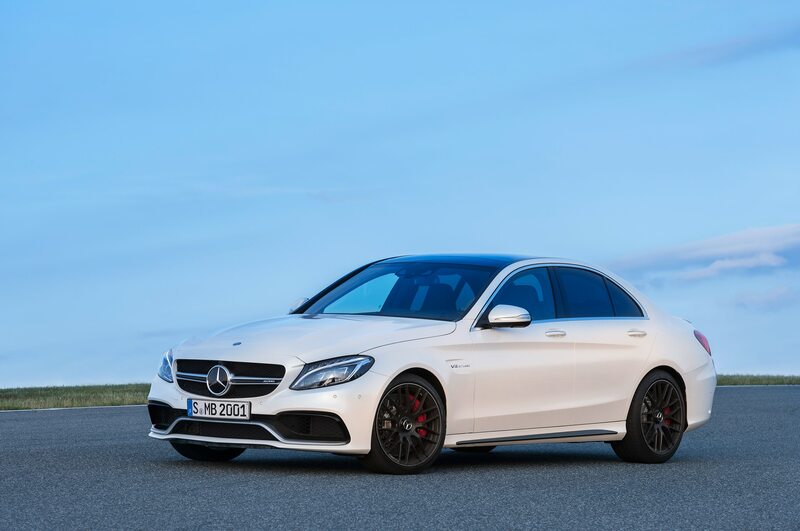 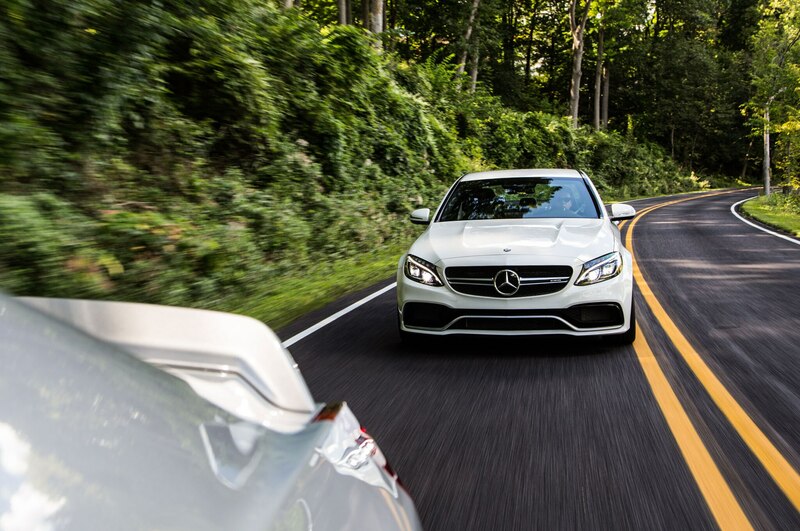 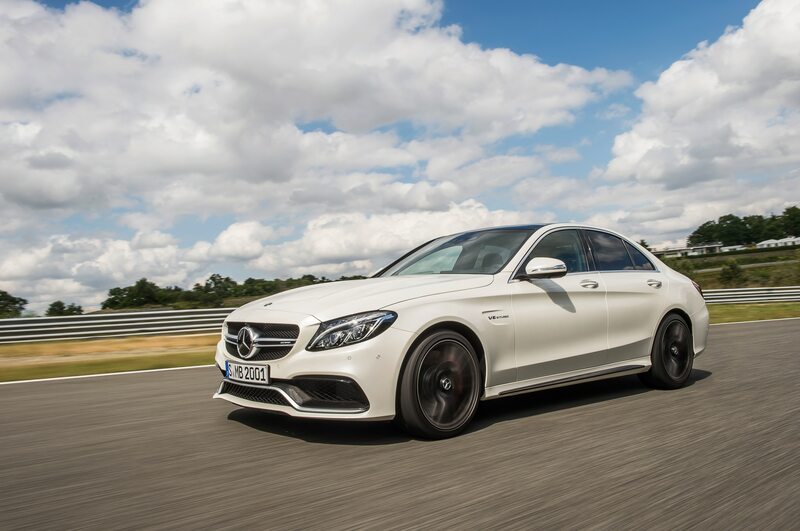 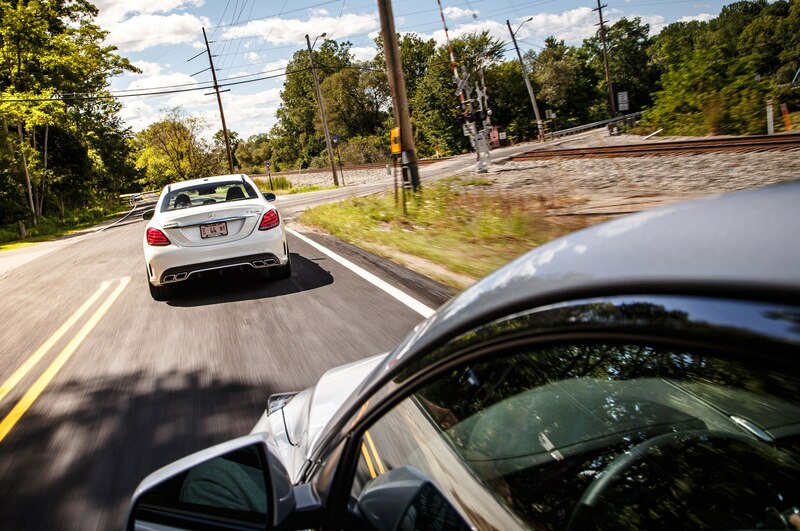 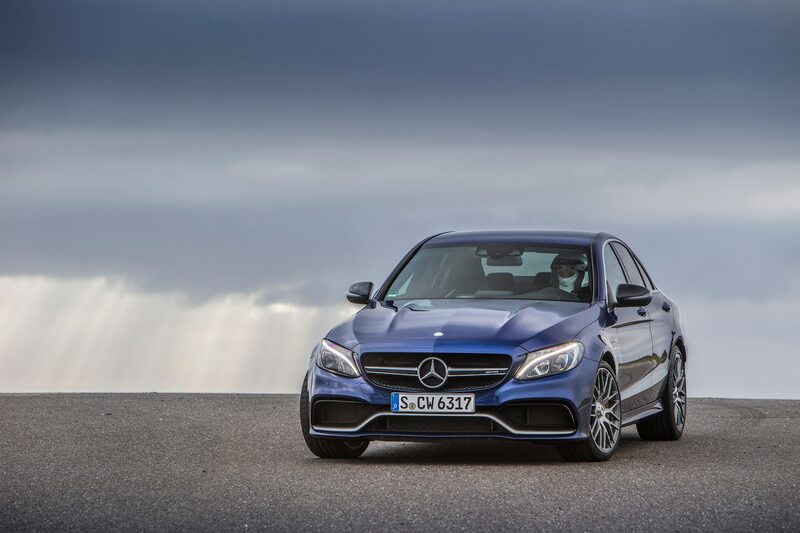 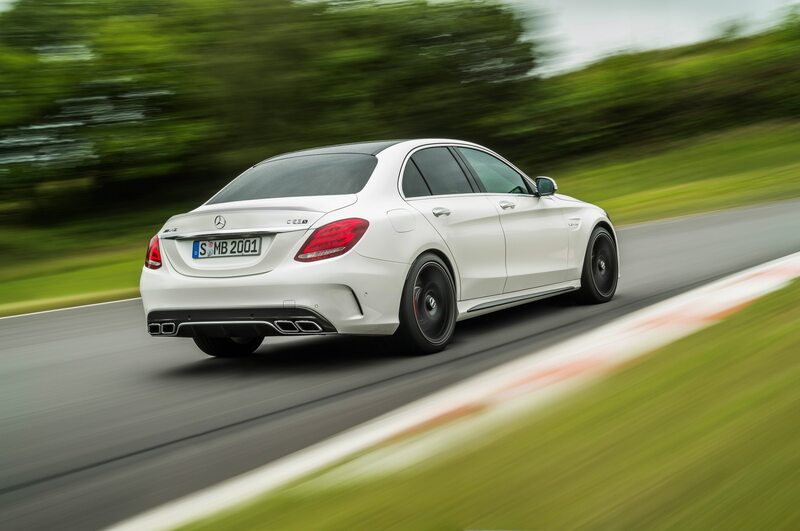 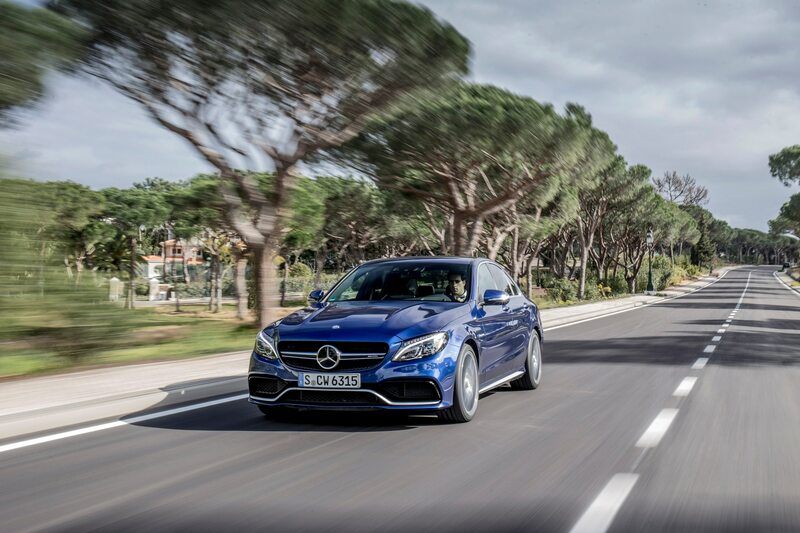 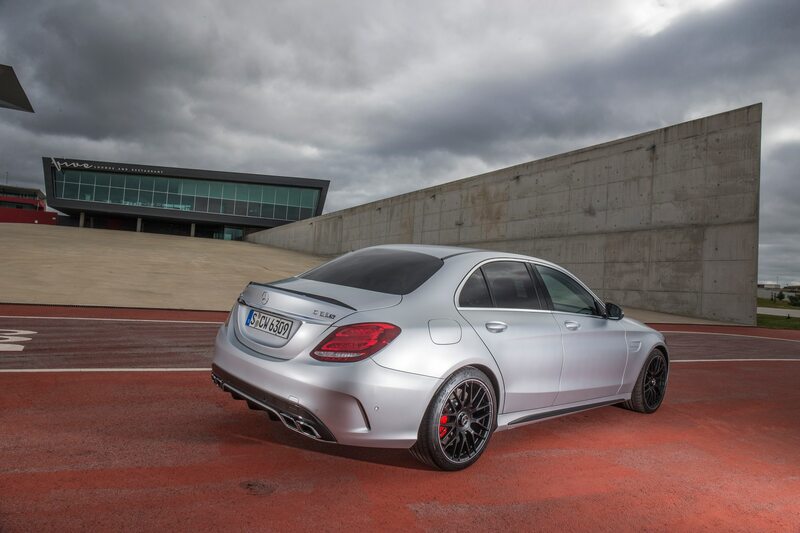 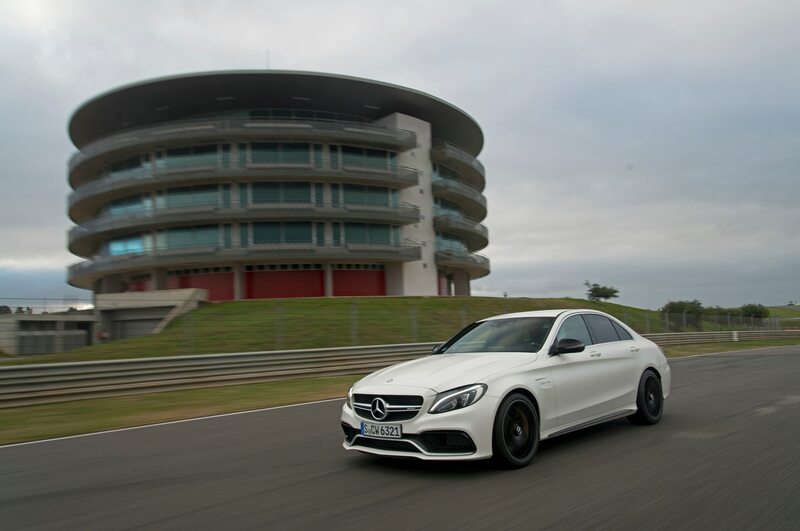 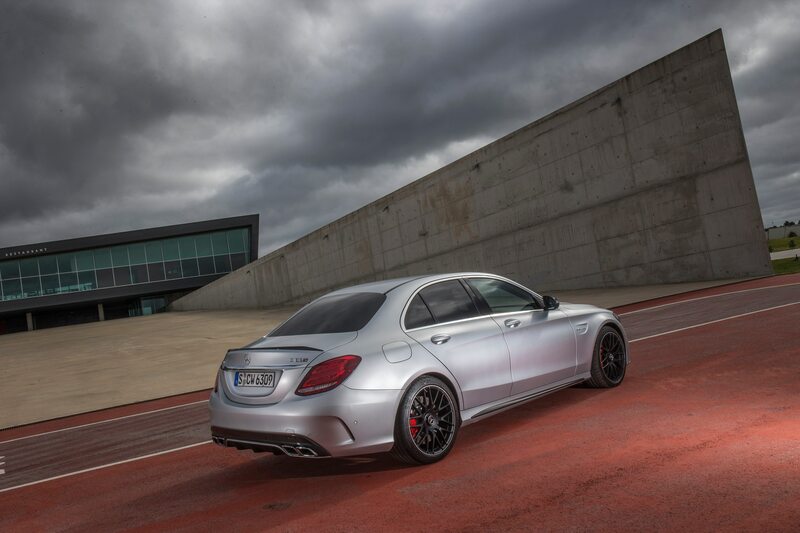 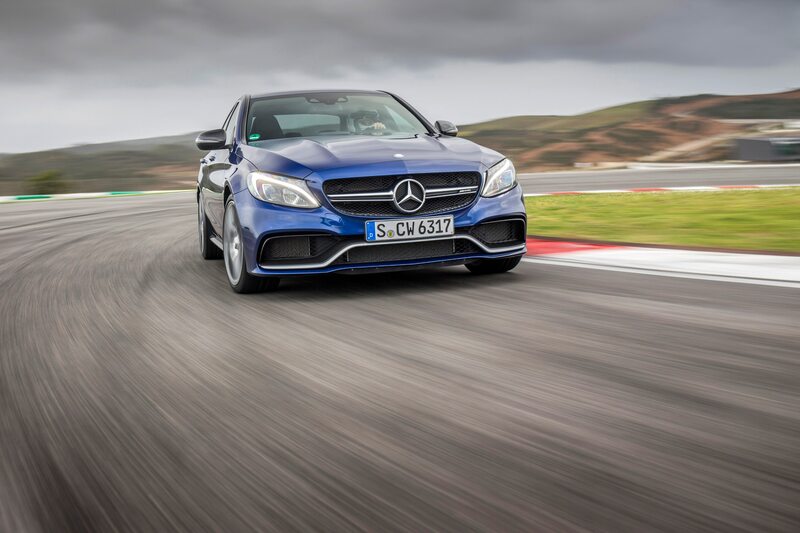 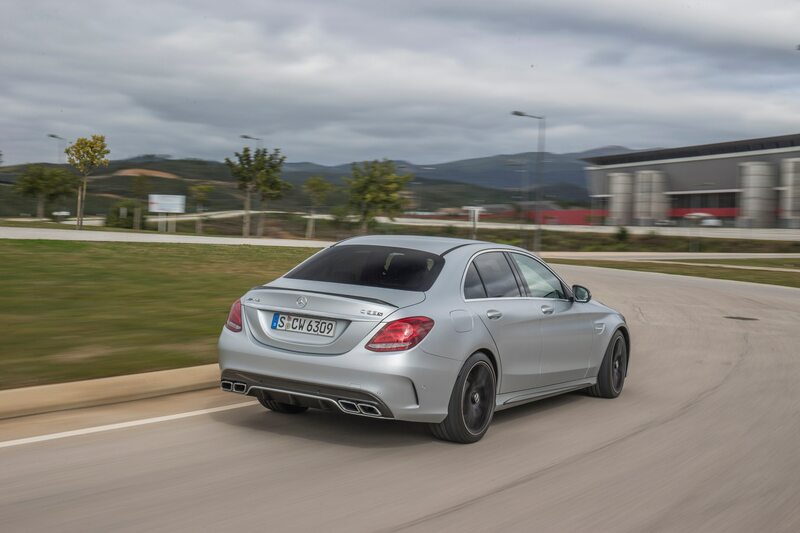 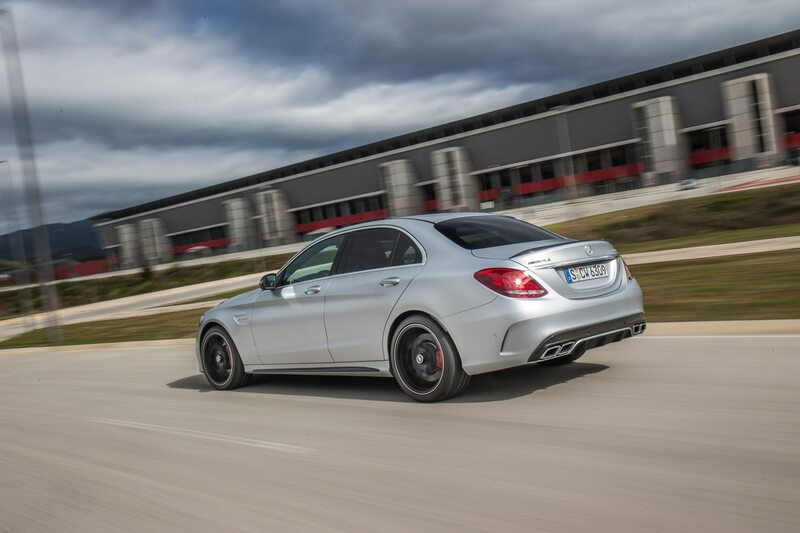 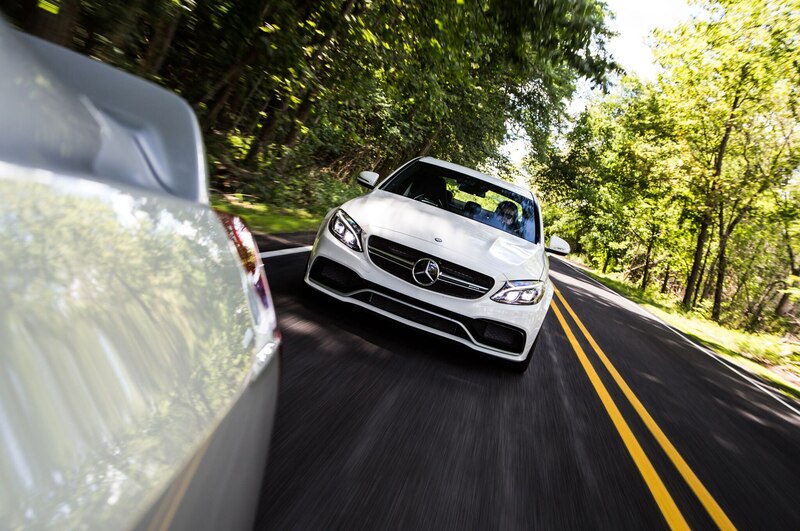 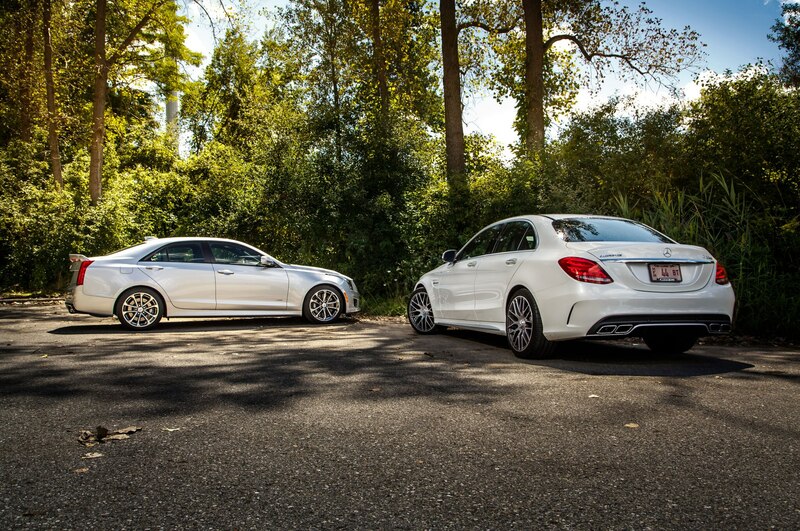 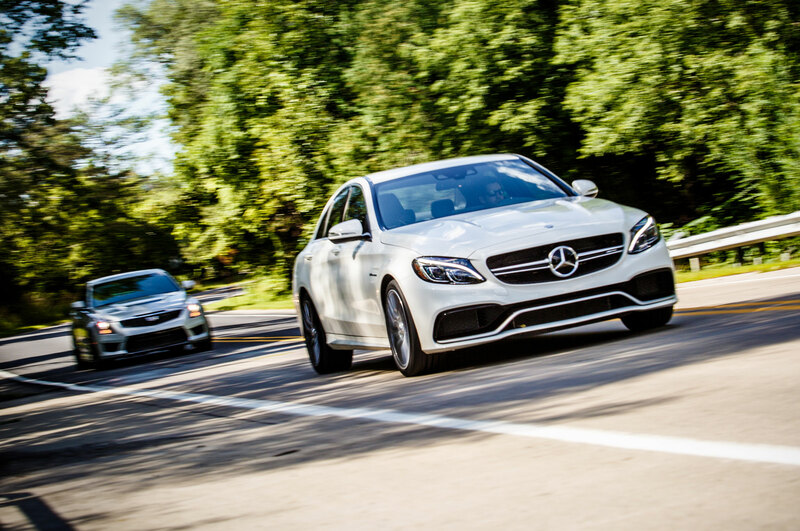 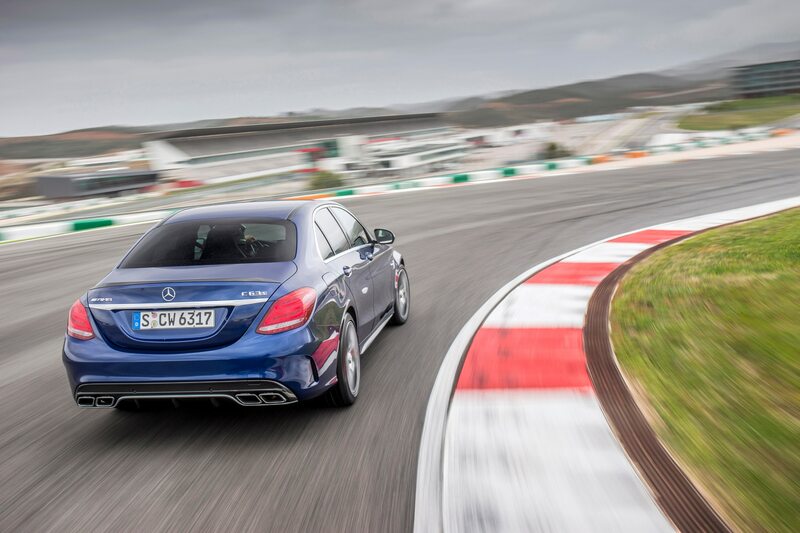 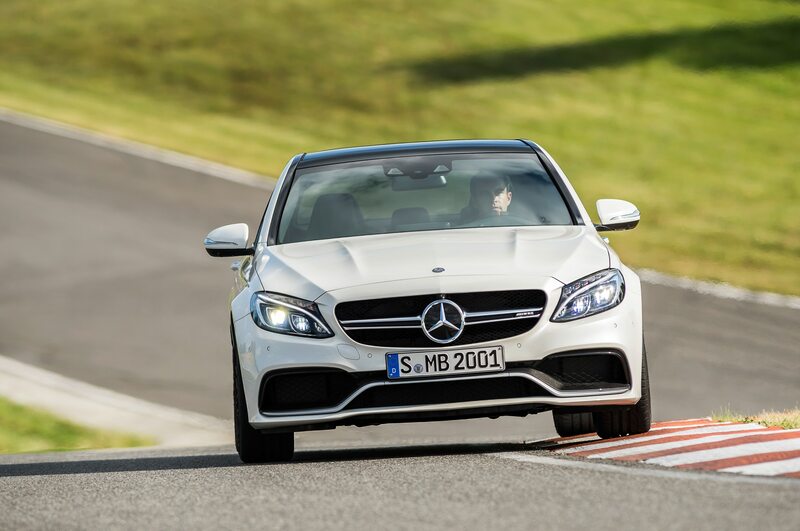 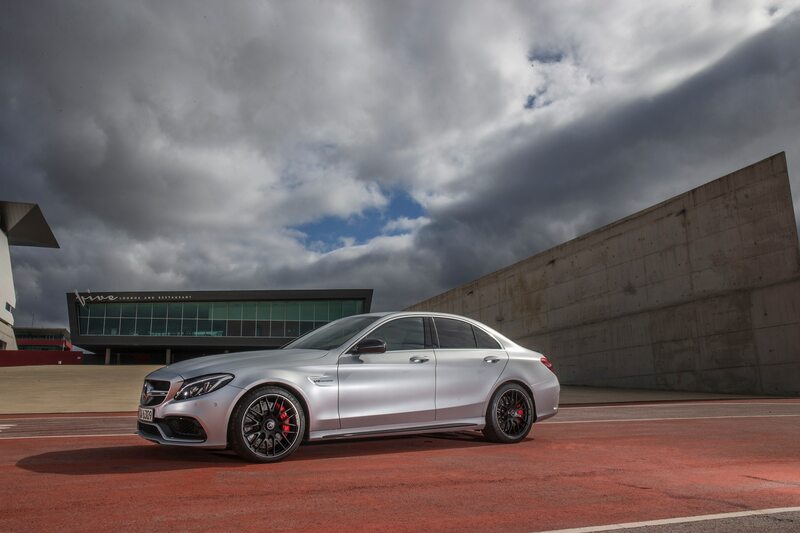 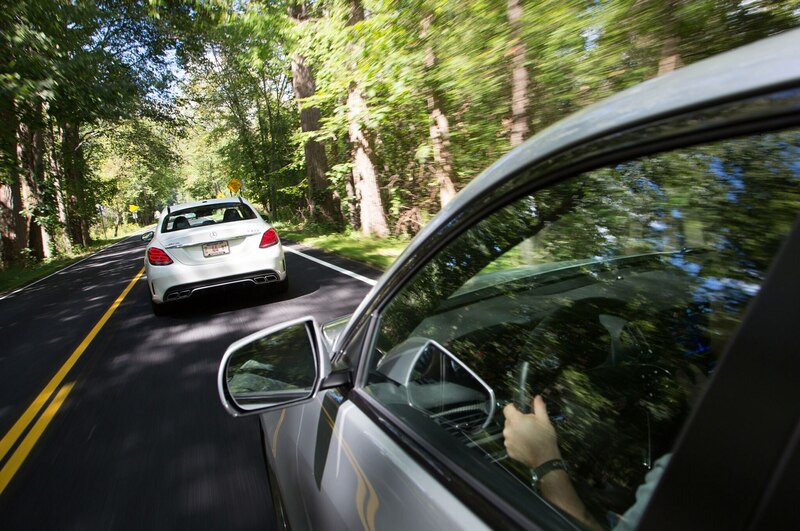 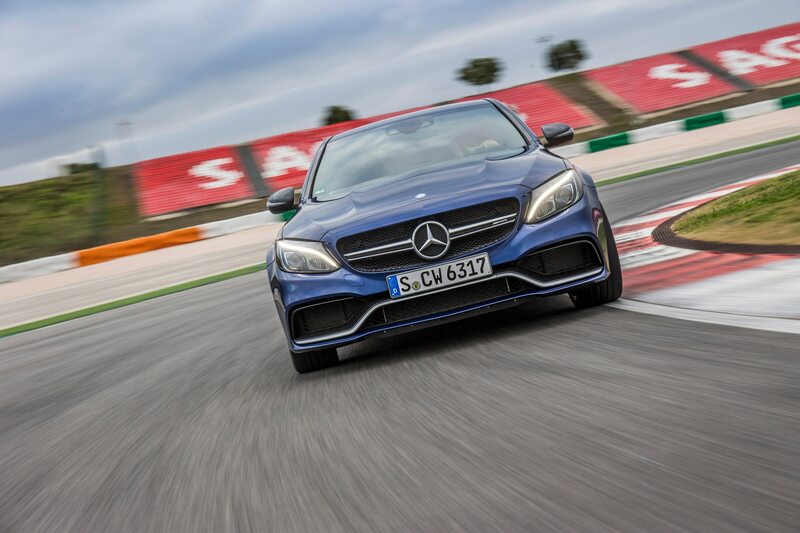 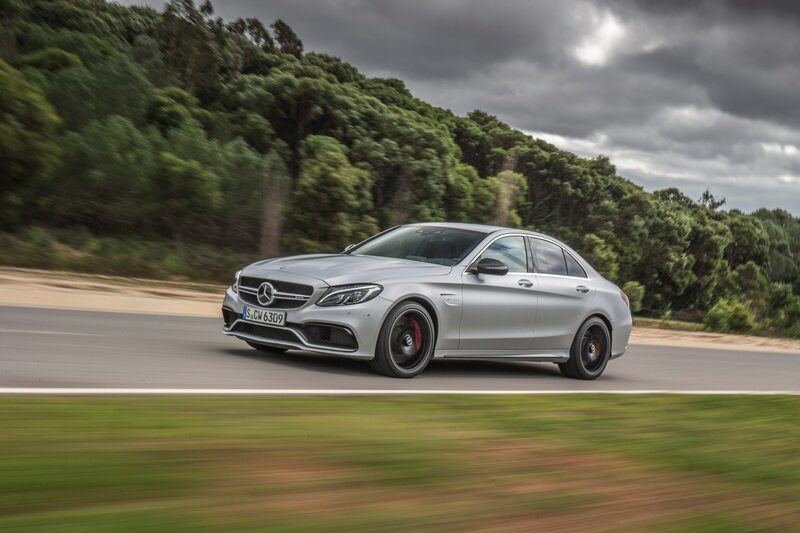 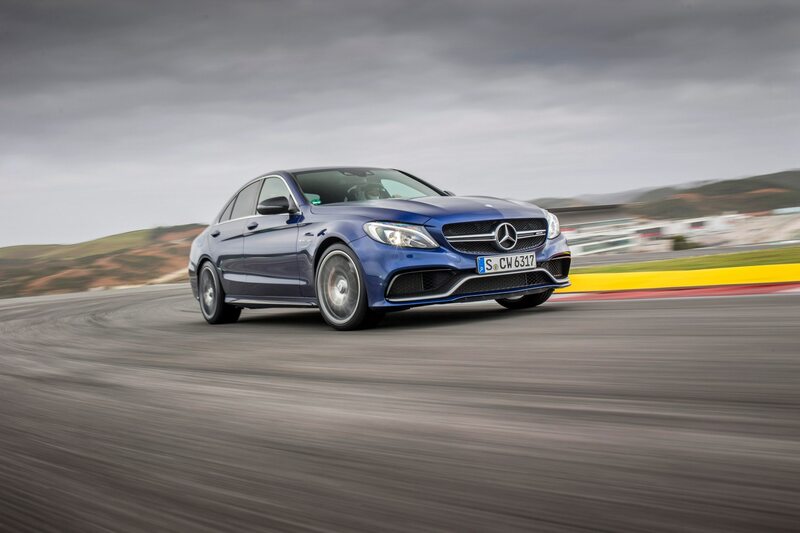 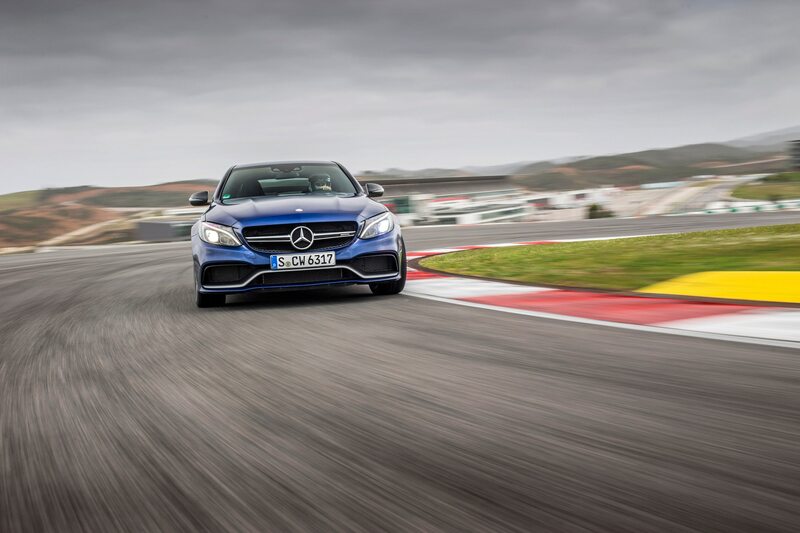 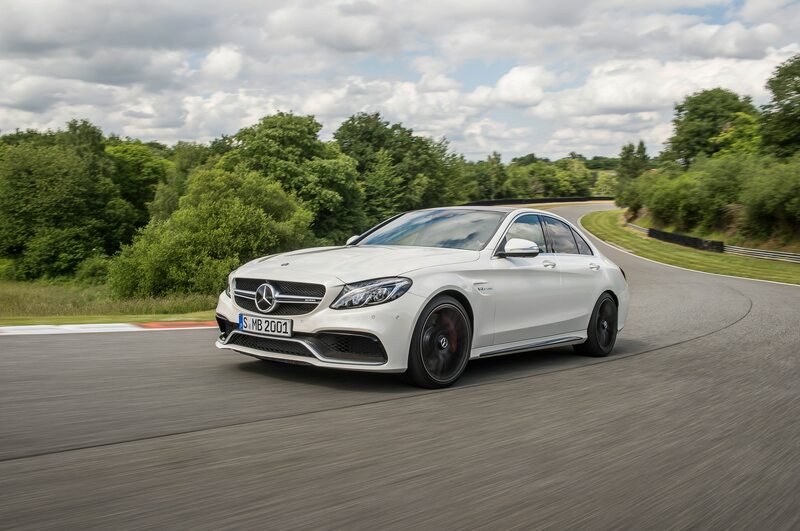 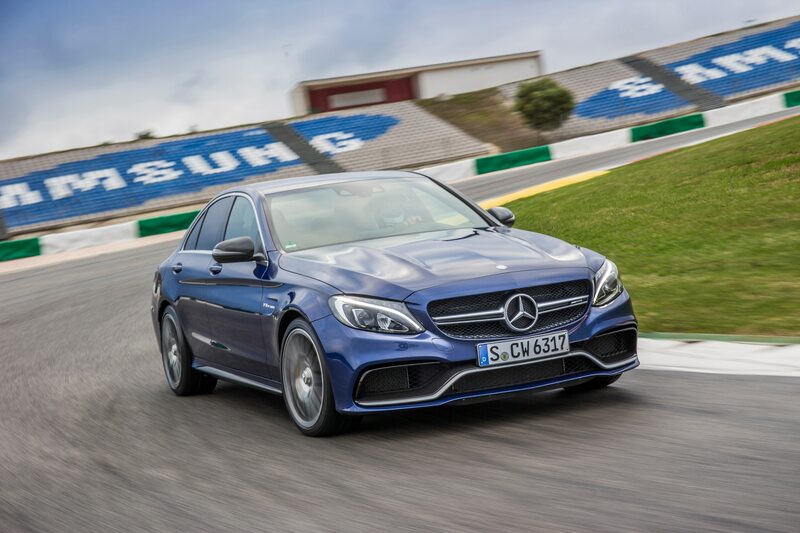 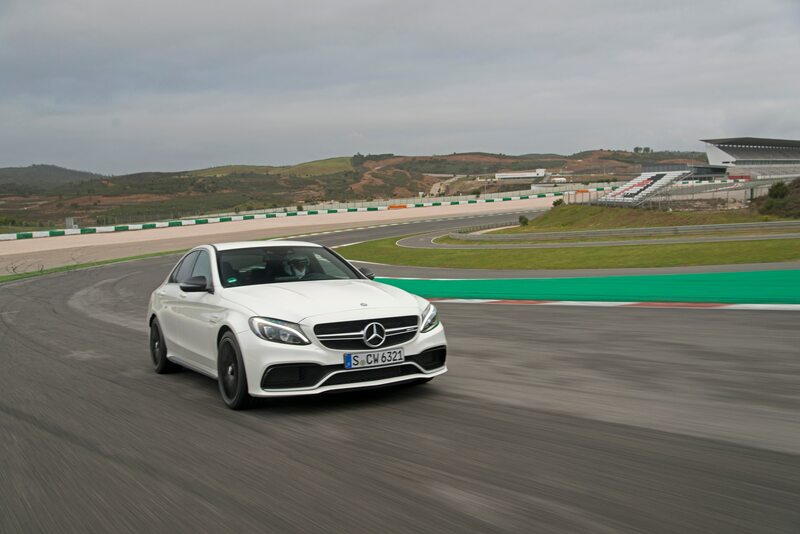 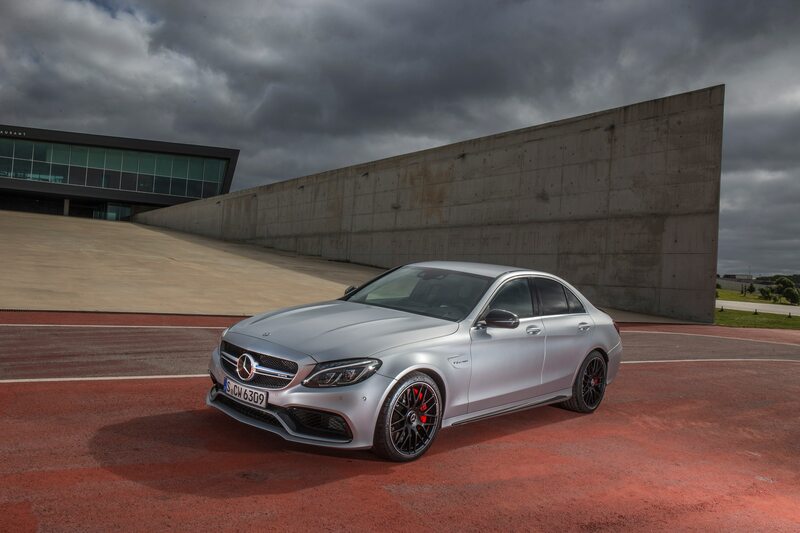 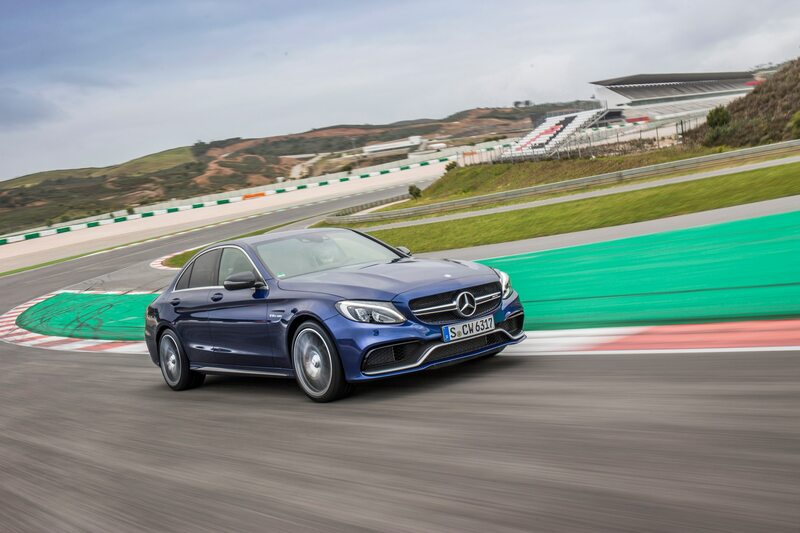 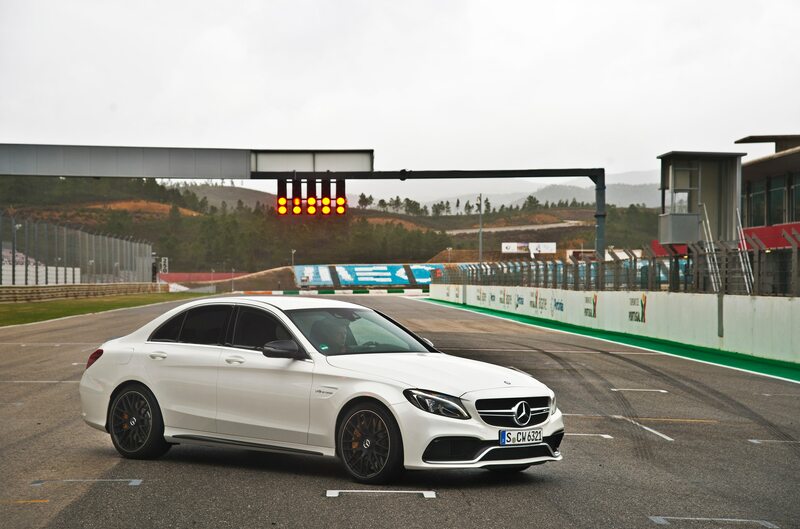 Eventually, the C63 S overworks its brakes, and the ATS-V goes for the knockout. 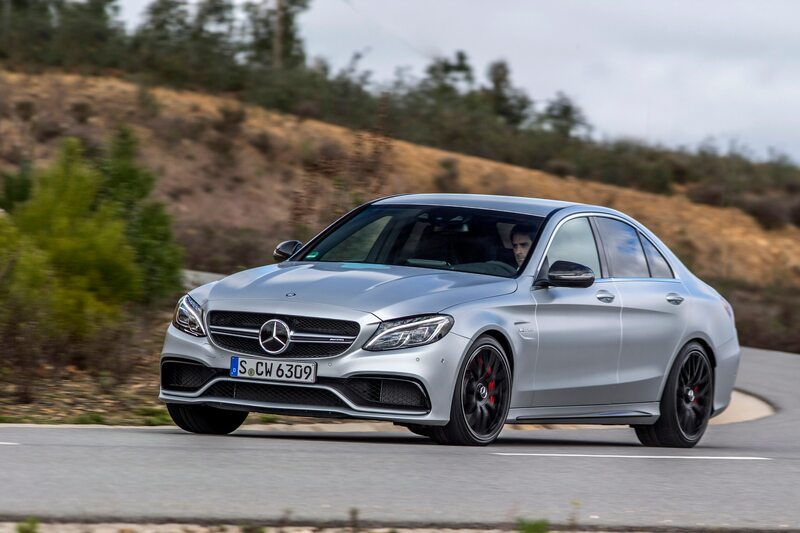 None of this should be taken as our saying the C63 S fared poorly or wasn’t enjoyable. 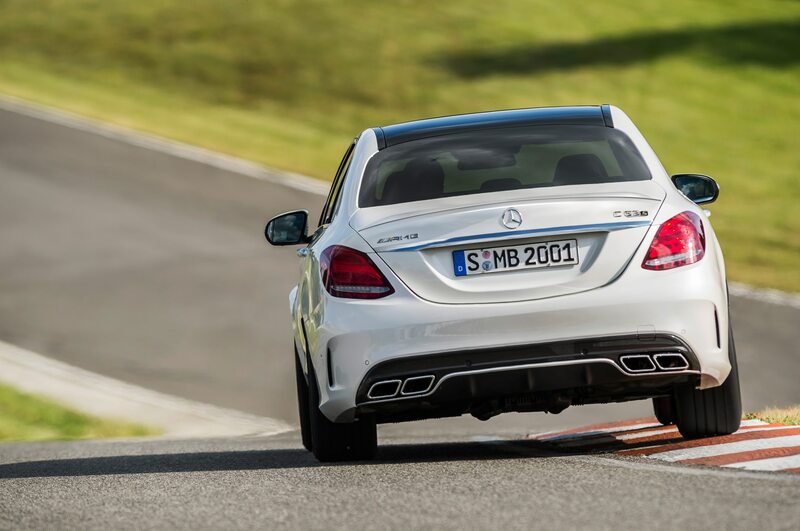 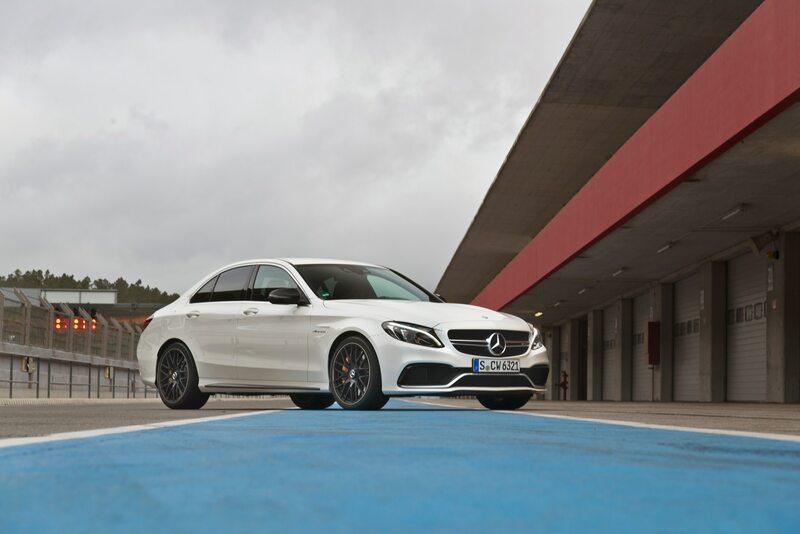 The macho engineers in Affalterbach would surely argue that taming a 503-hp car from AMG is supposed to demand some skill and finesse. 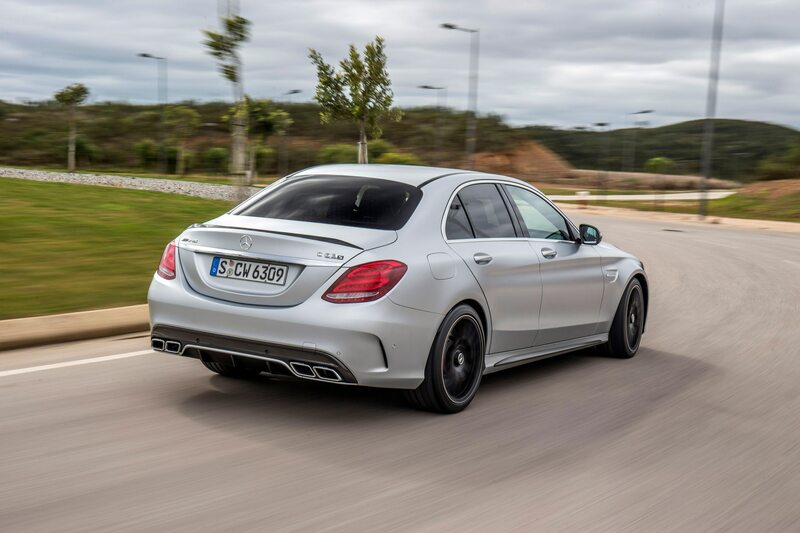 Indeed, there are few pleasures greater than chasing someone down in the C63 S and drowning them in glorious V-8 noise as you pass. 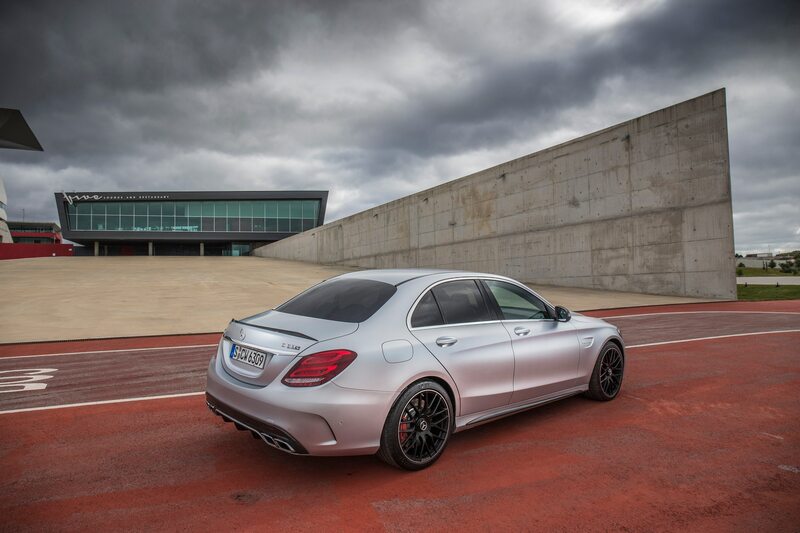 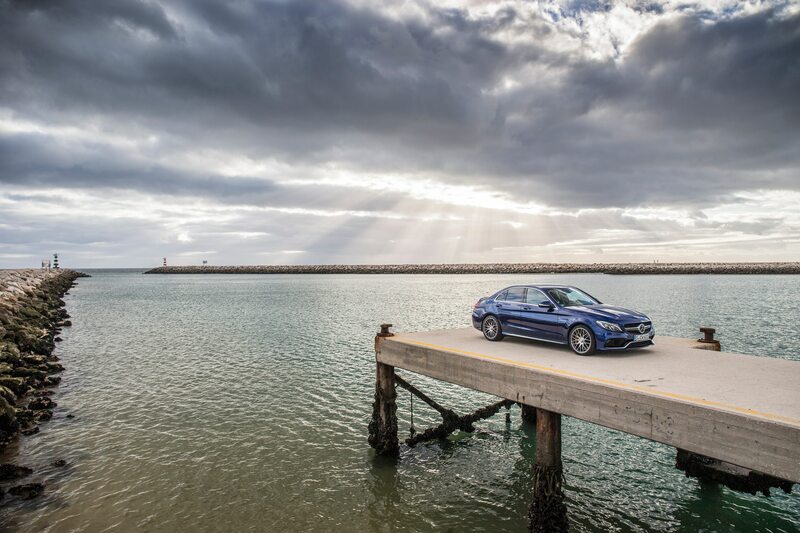 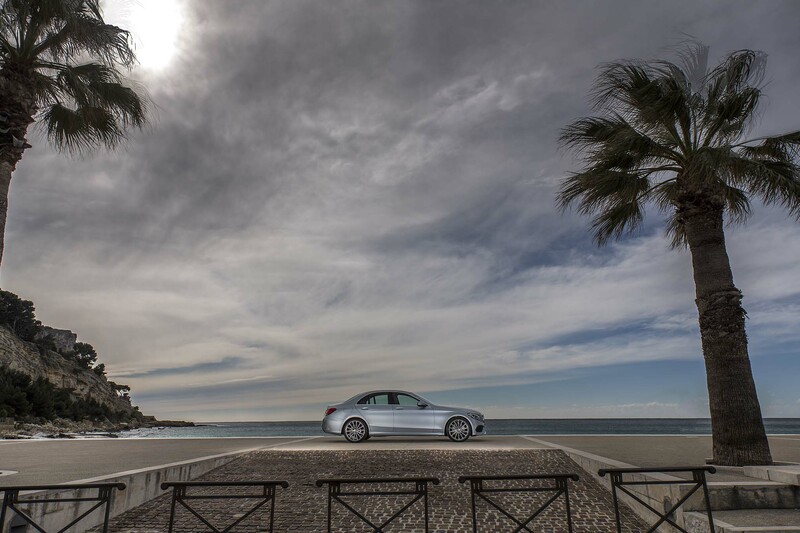 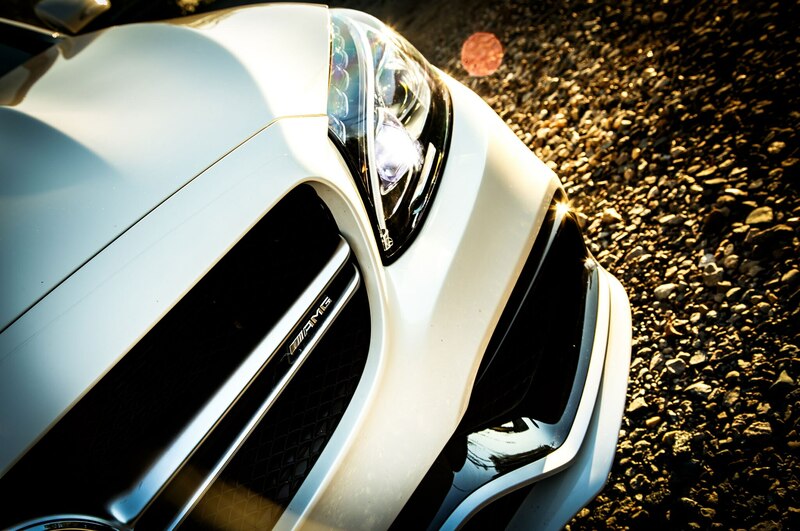 This is a car that never lets you forget you’re driving something special, something that demands extra attention. 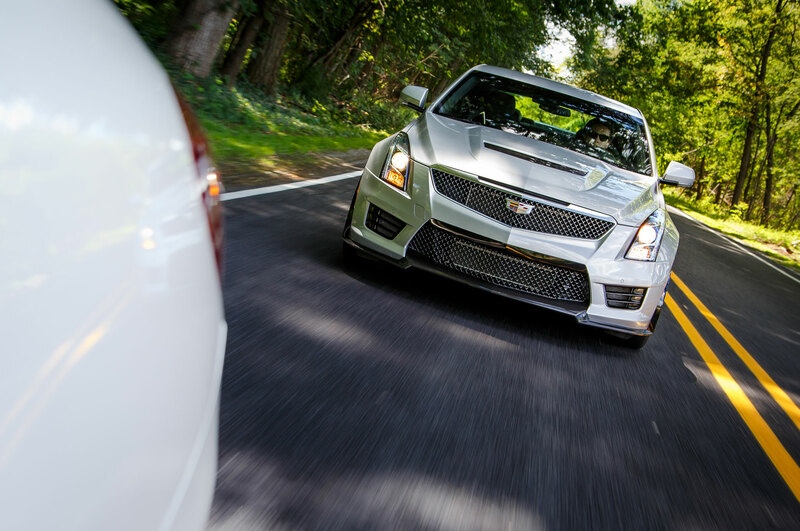 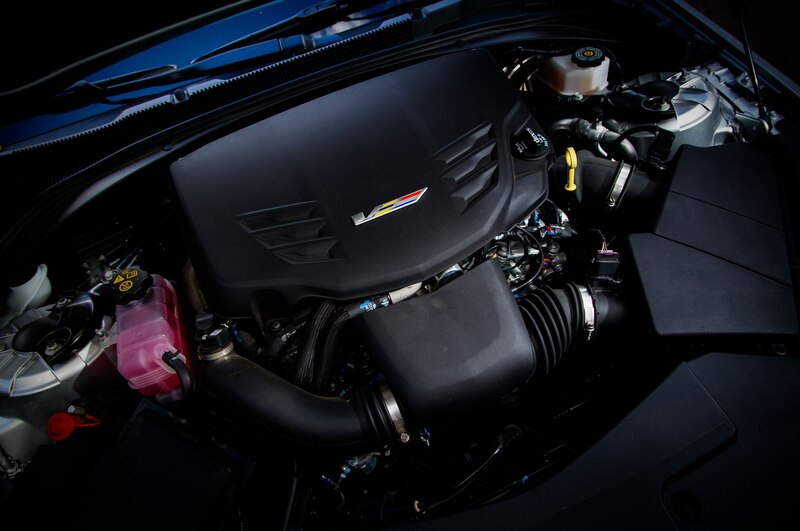 Cadillac should be very proud of the ATS-V, a car built in Lansing, Michigan, that can outrun German competition. 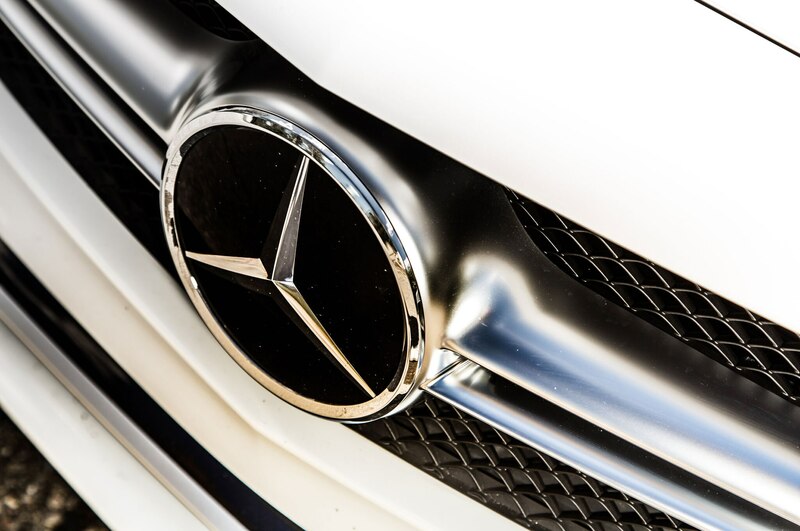 Heck, we’re proud. 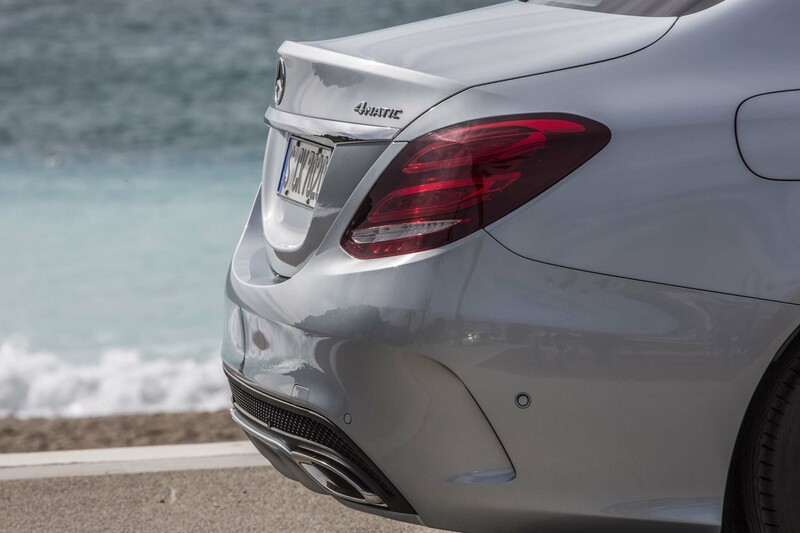 But the hard truth is that it’s not enough. 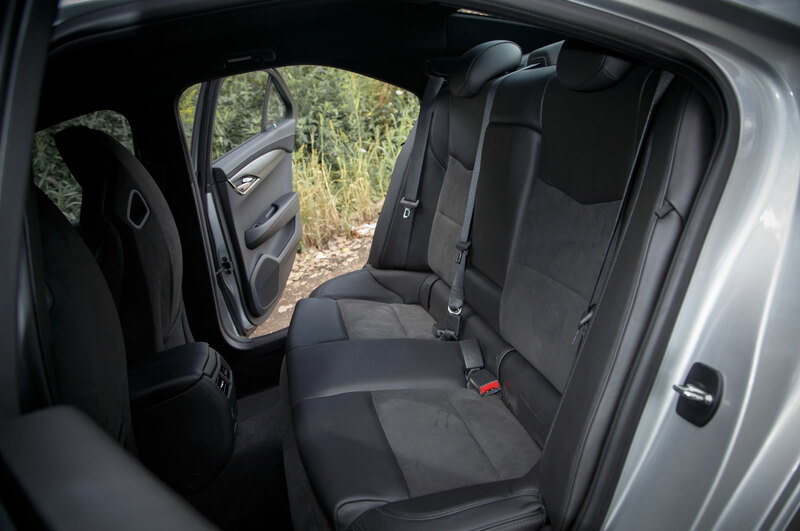 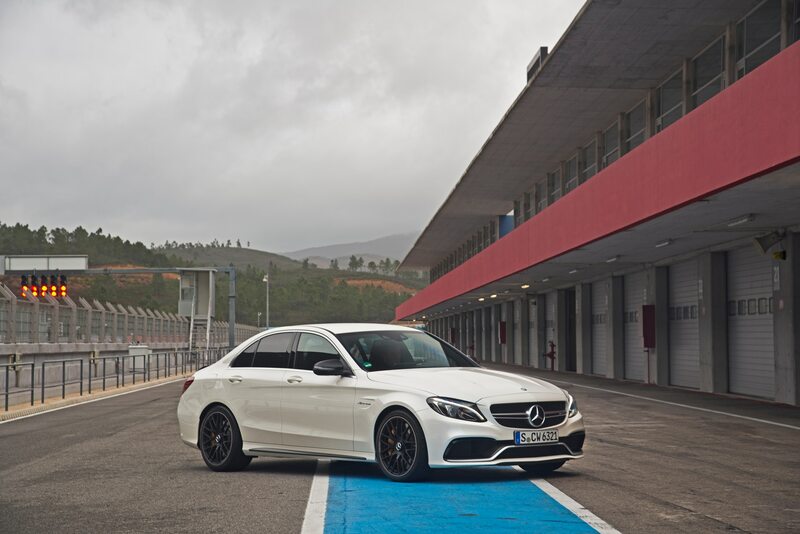 In the very exclusive club of super sport sedans, superb driving dynamics don’t guarantee you’ll find someone to dance with; they’re merely what it takes to get past the bouncer. 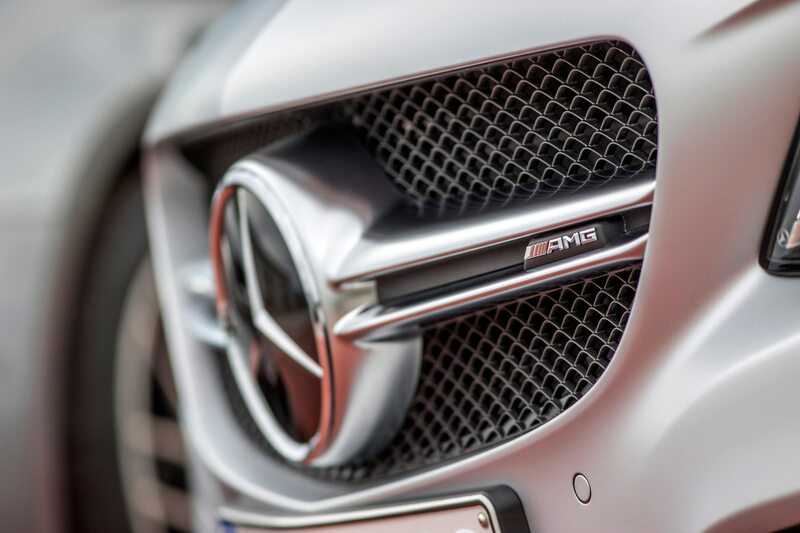 makes you surprised you ever lived without it. 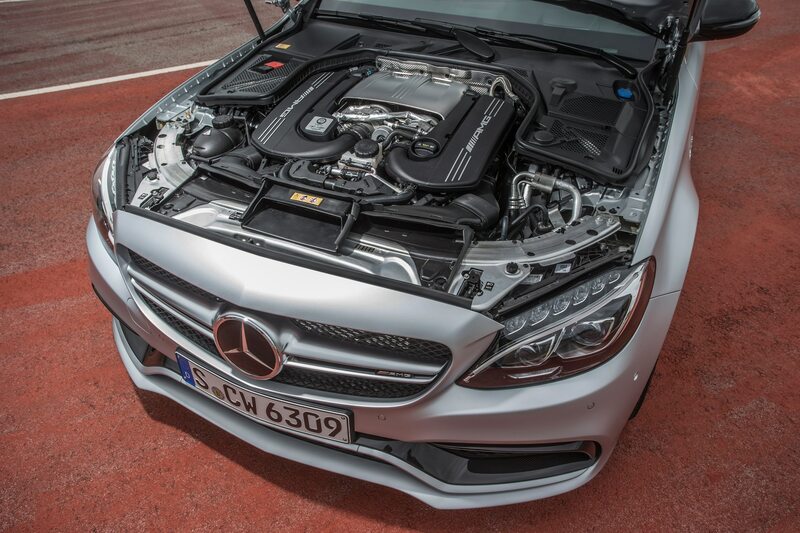 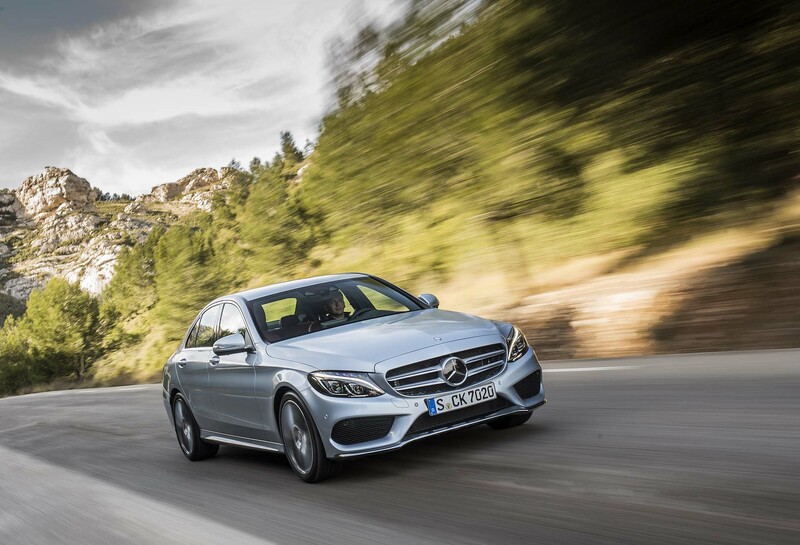 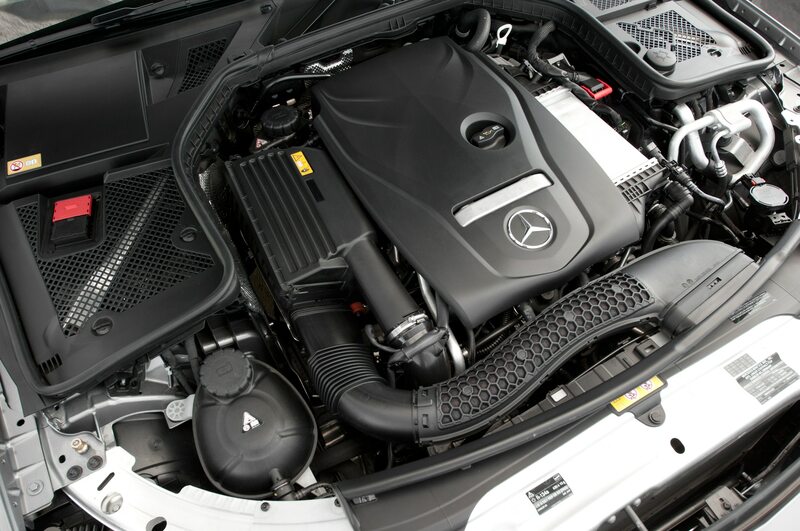 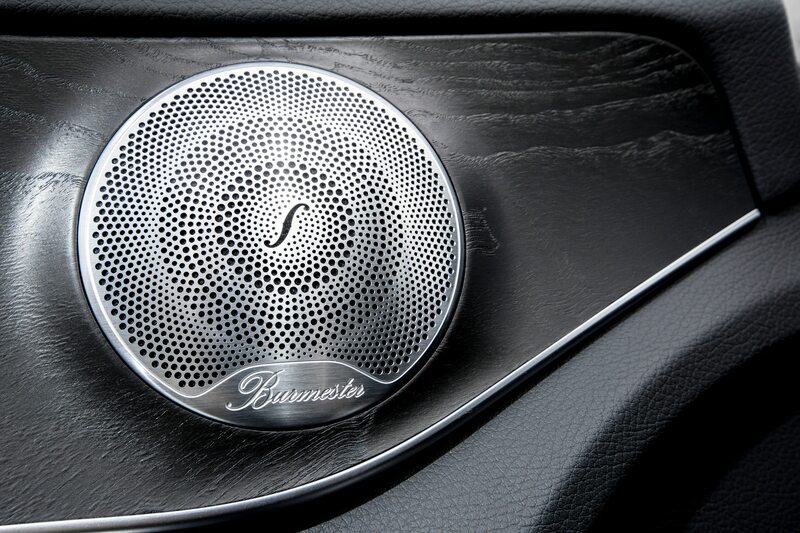 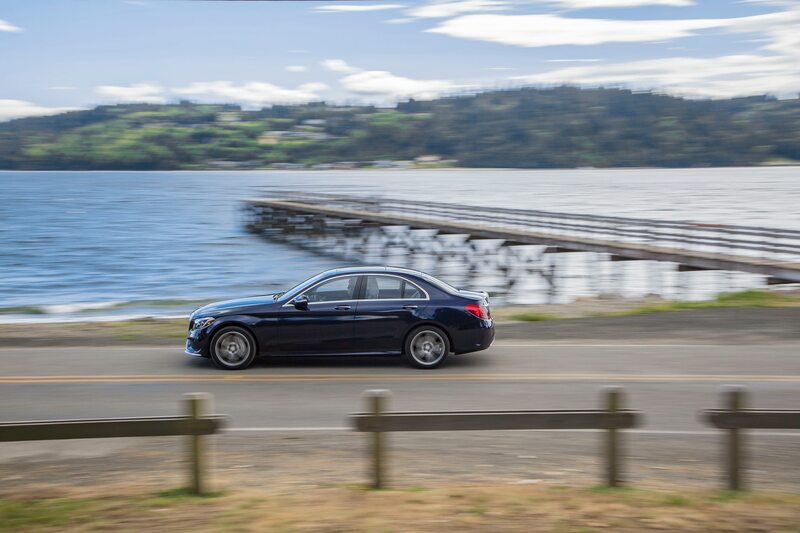 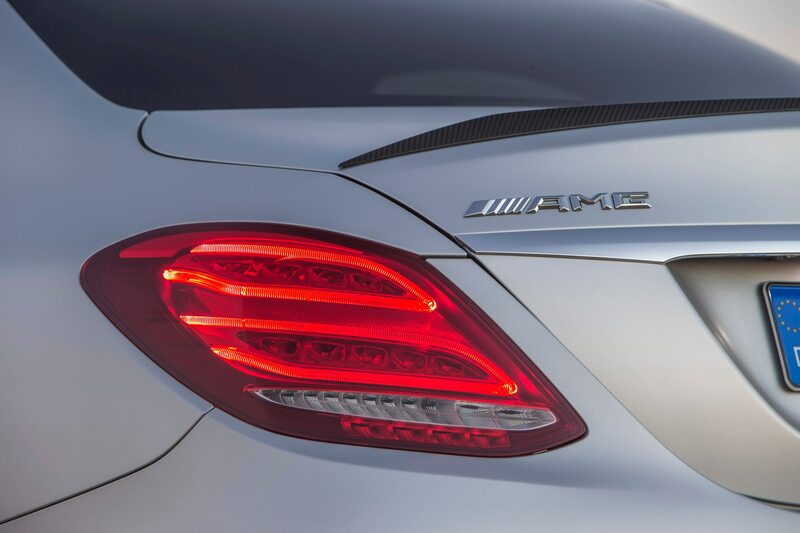 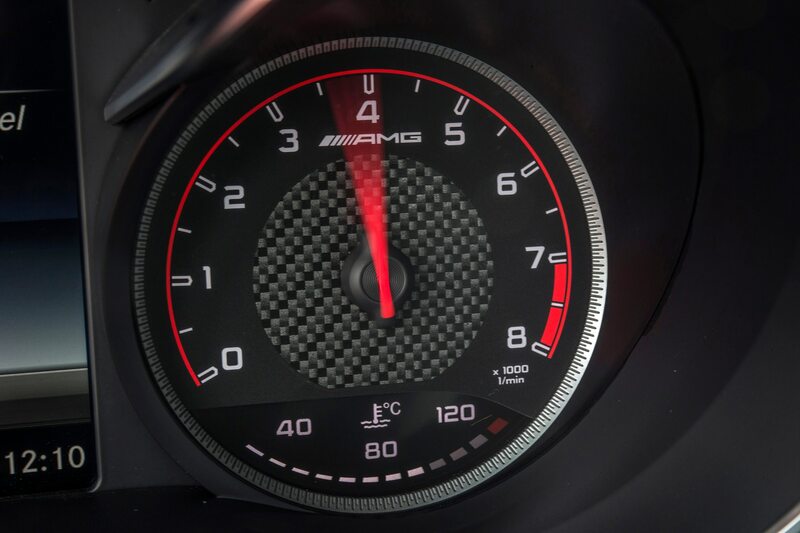 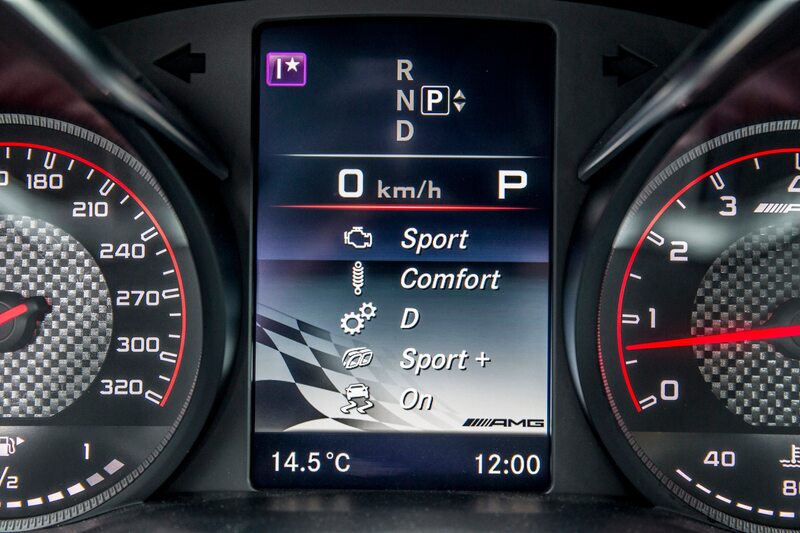 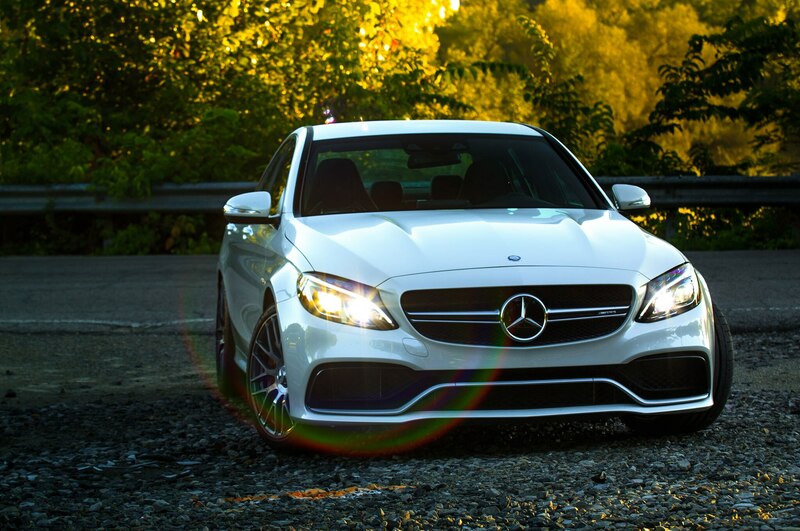 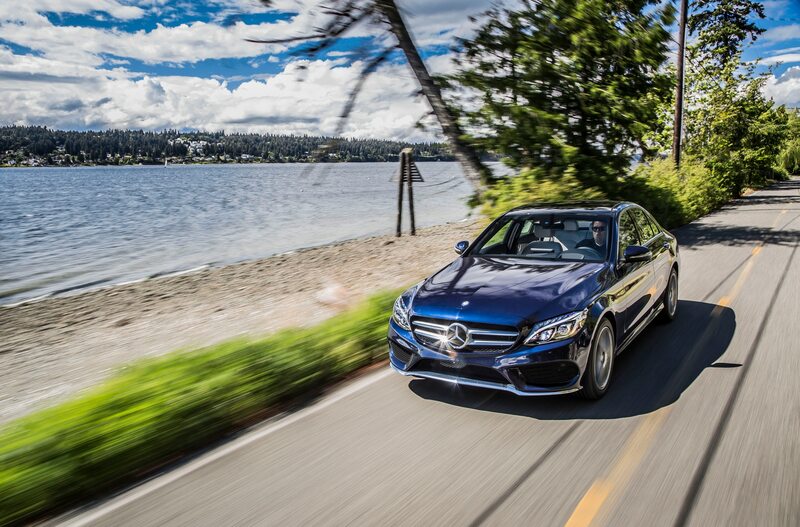 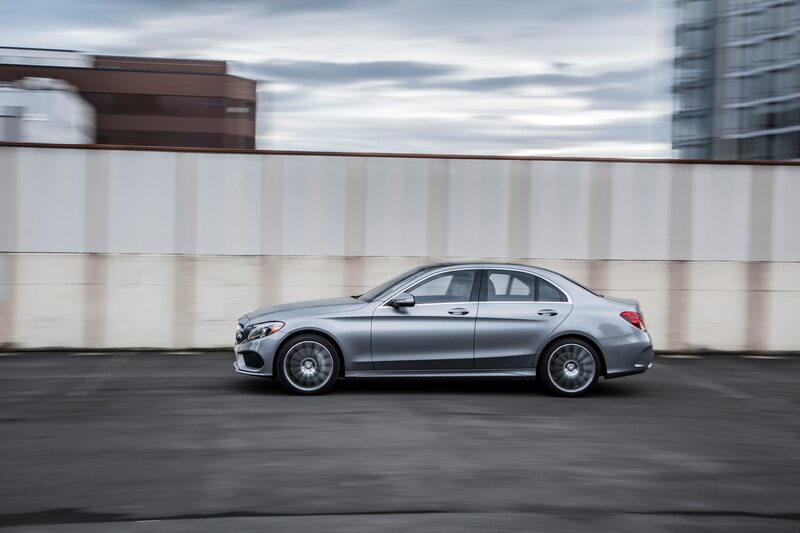 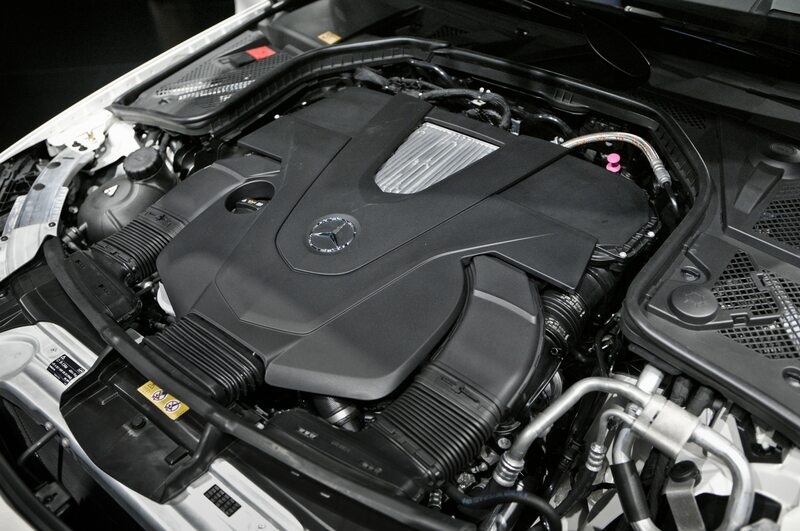 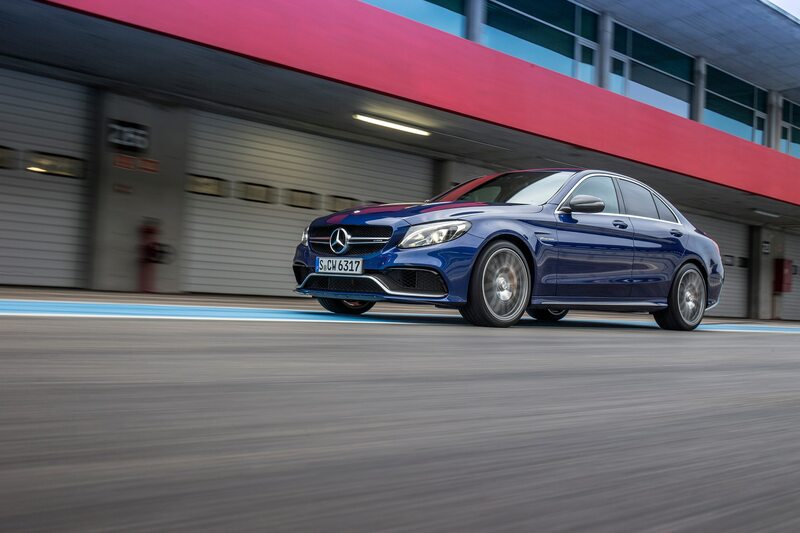 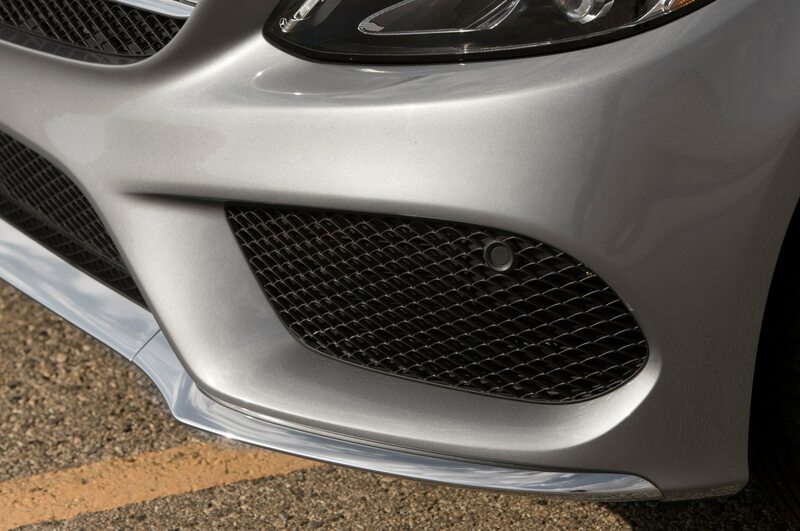 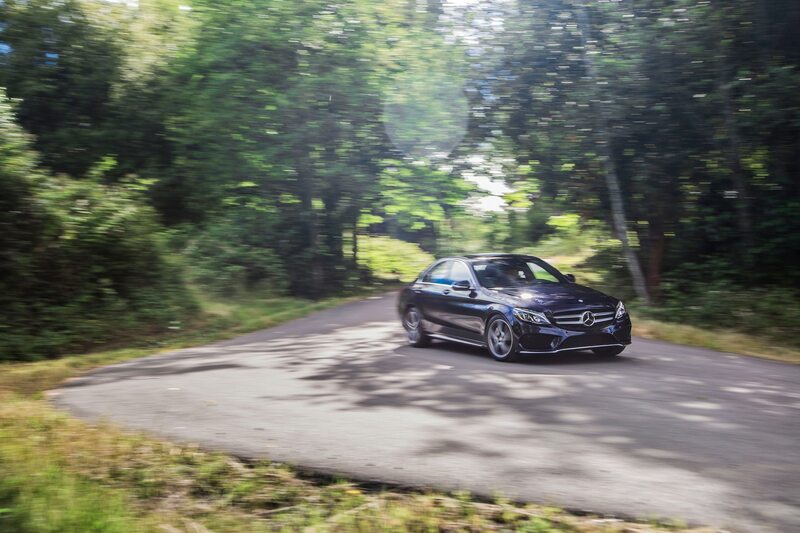 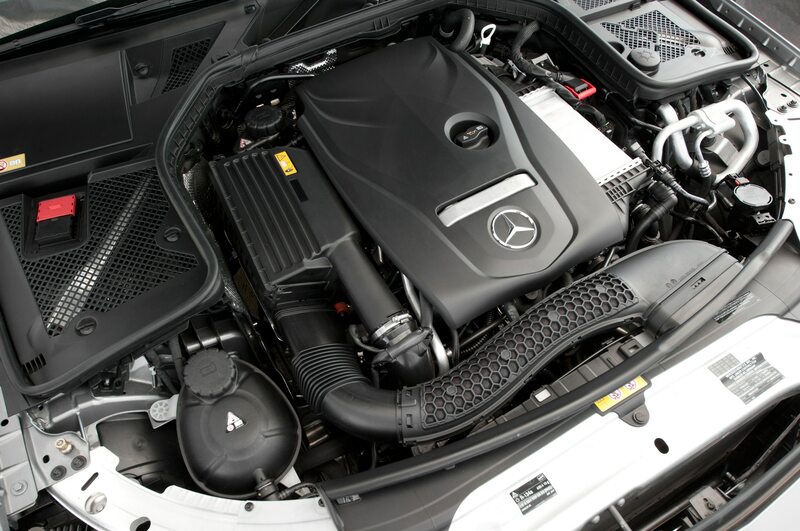 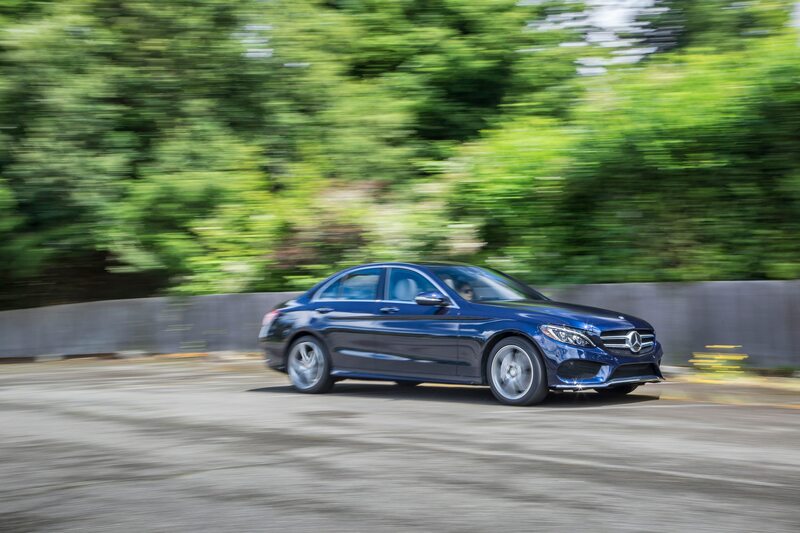 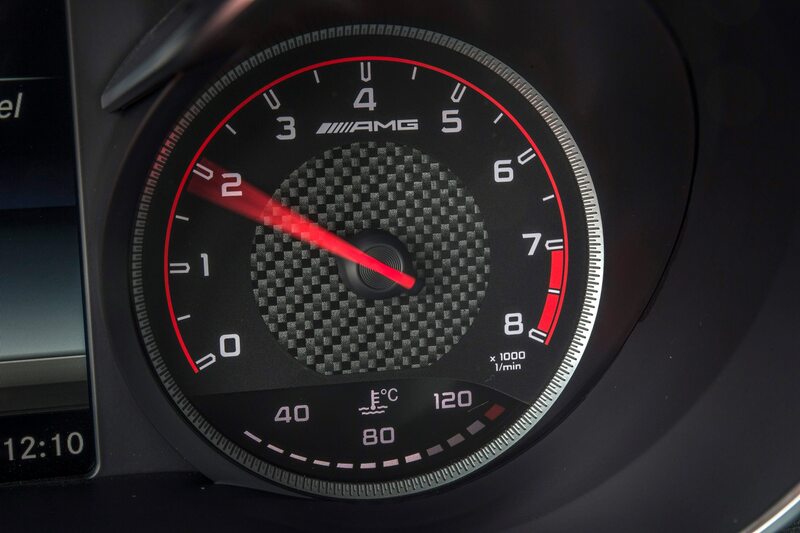 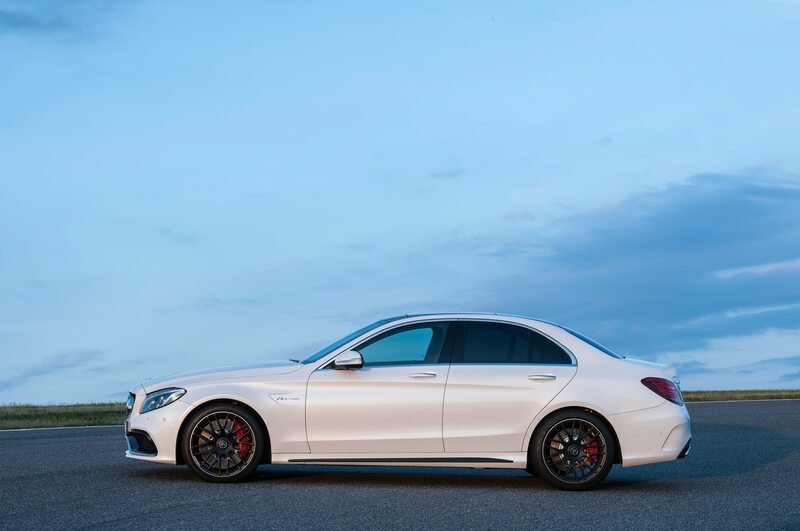 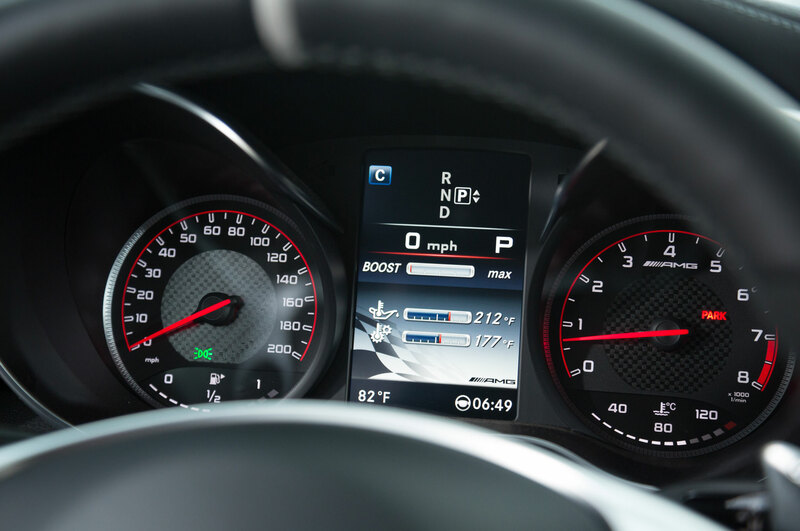 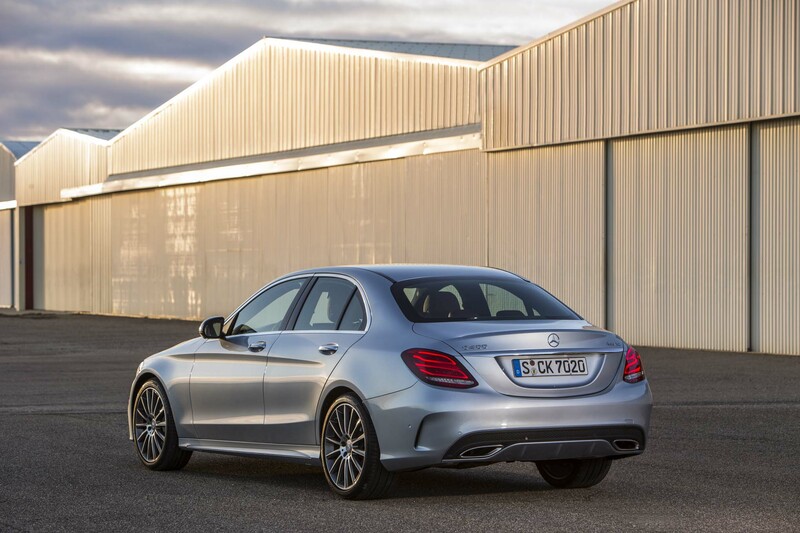 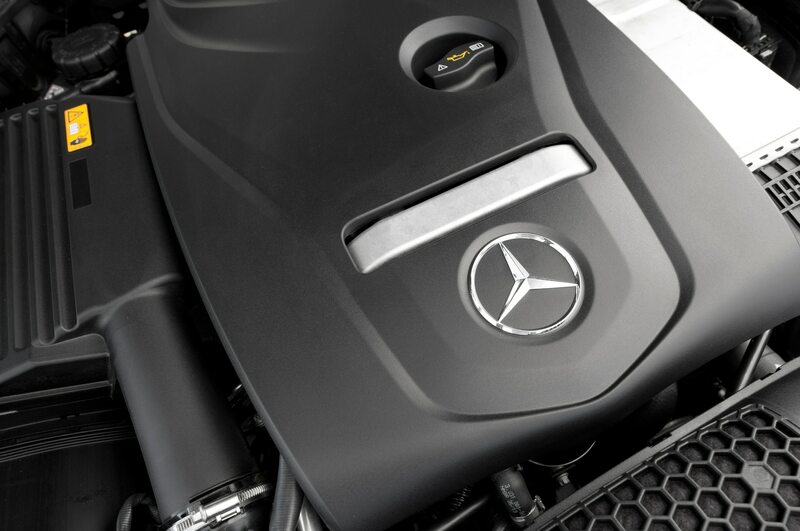 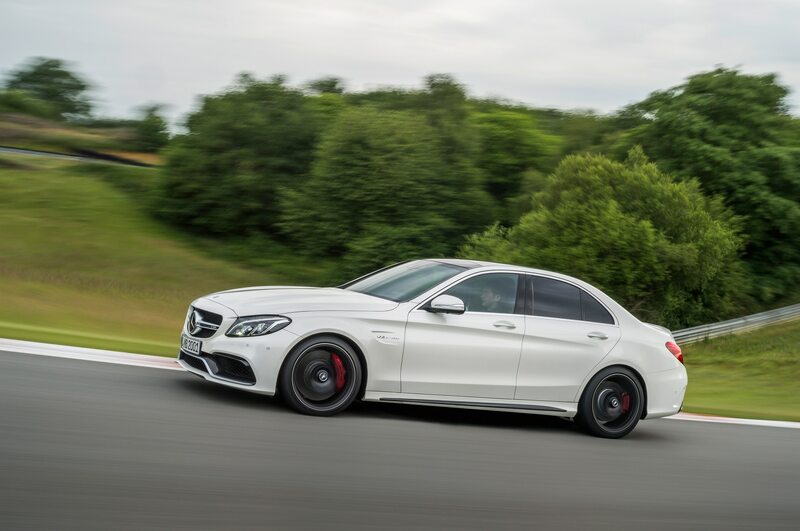 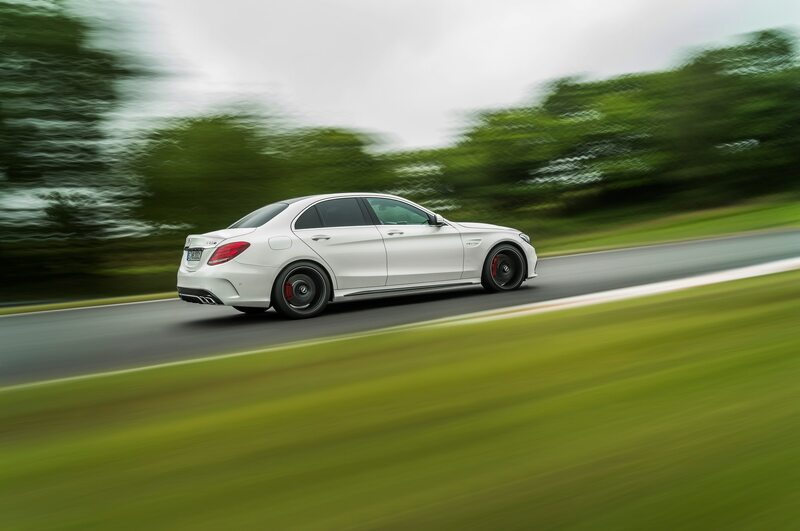 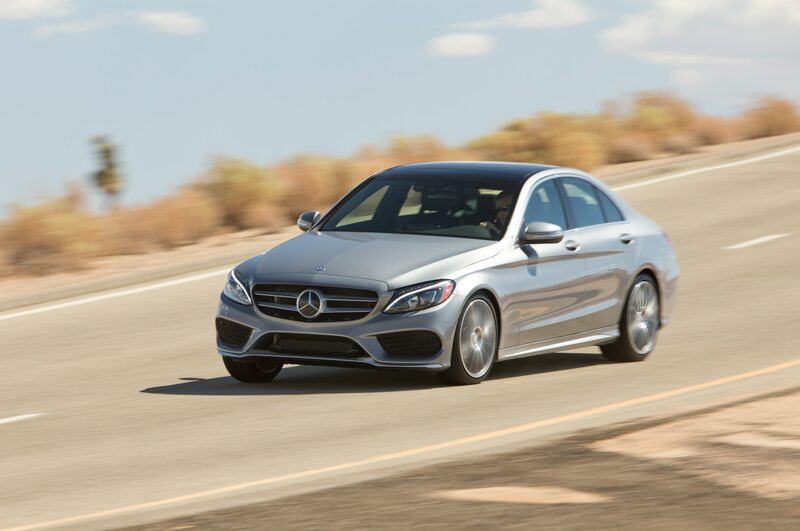 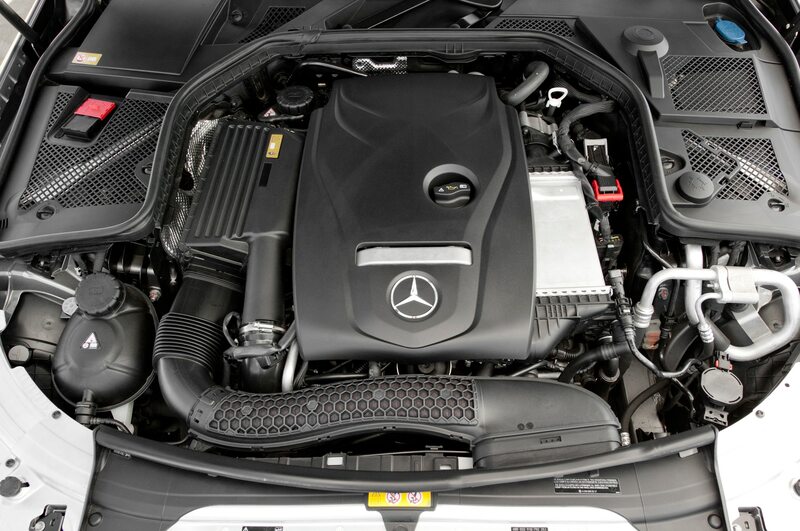 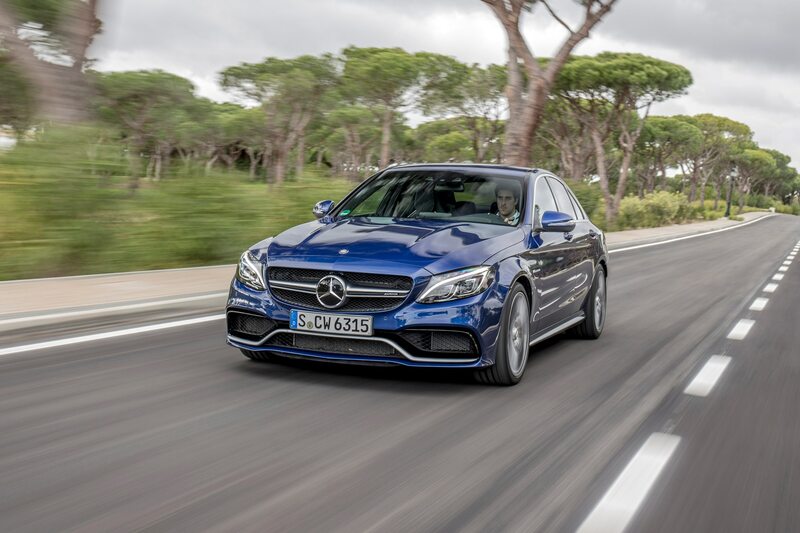 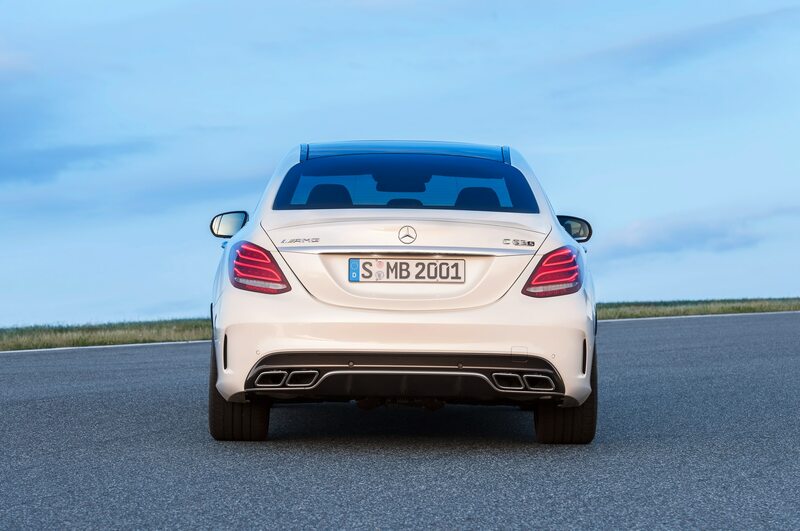 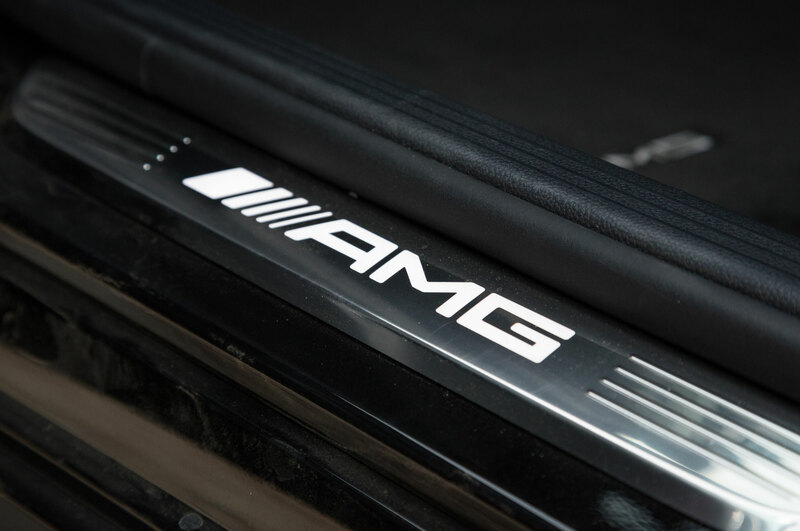 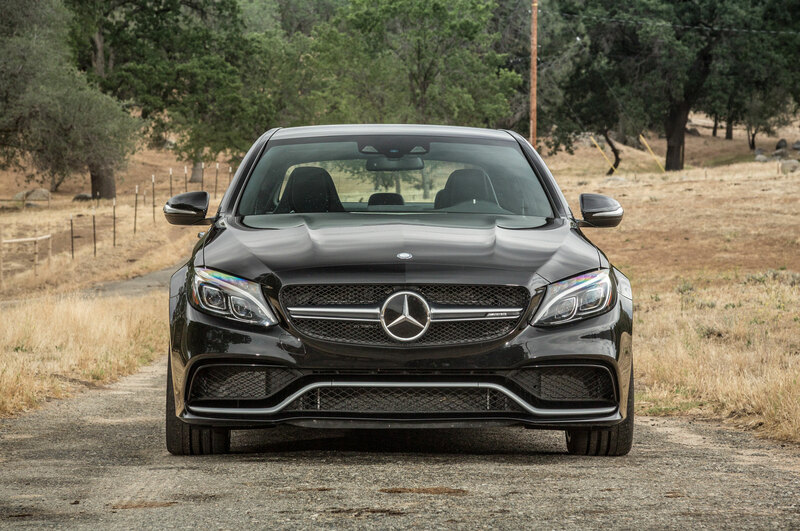 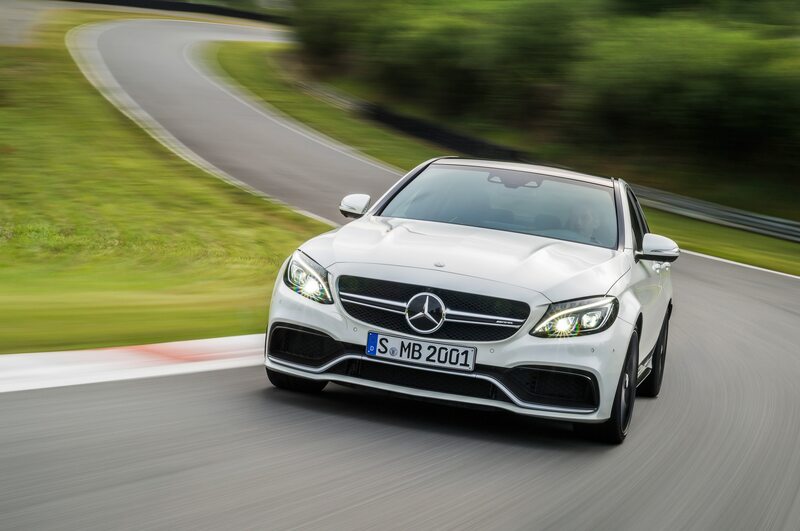 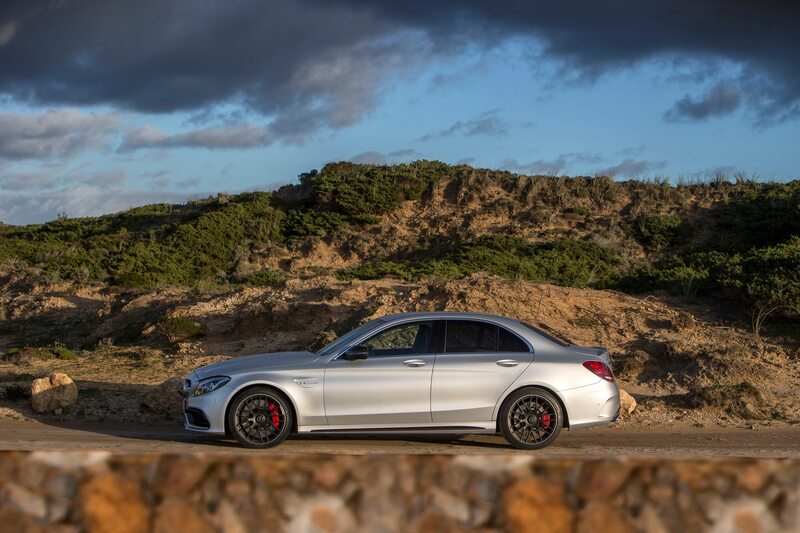 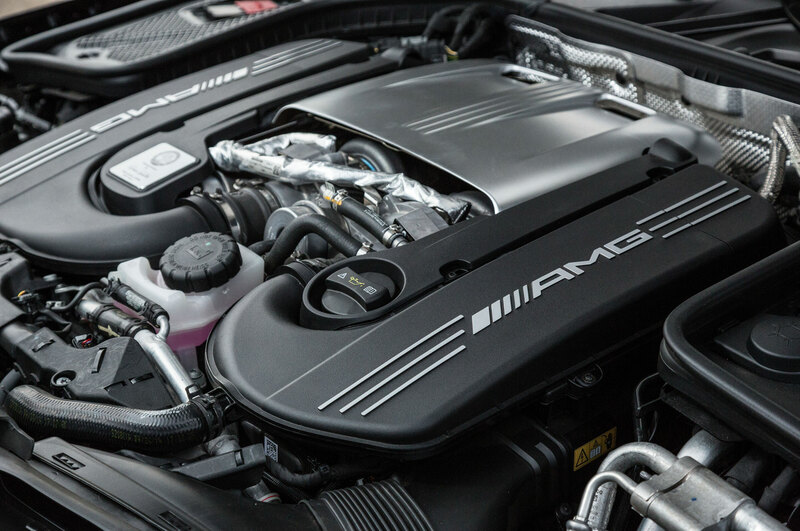 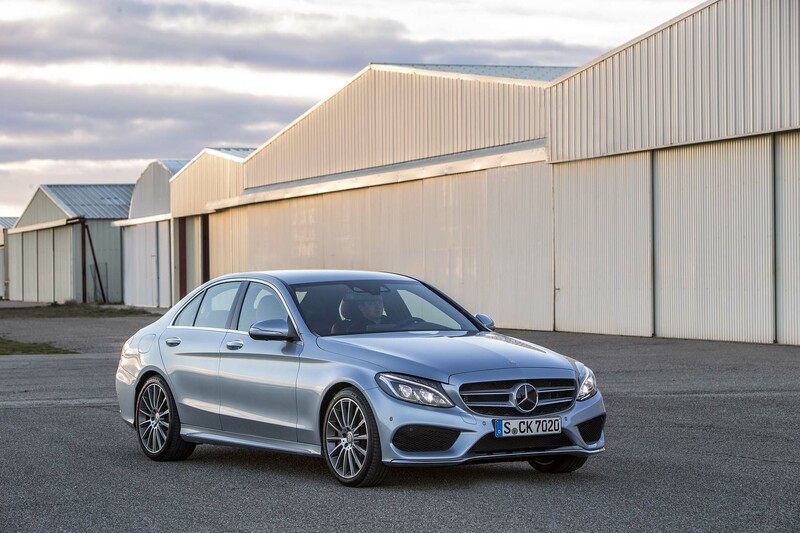 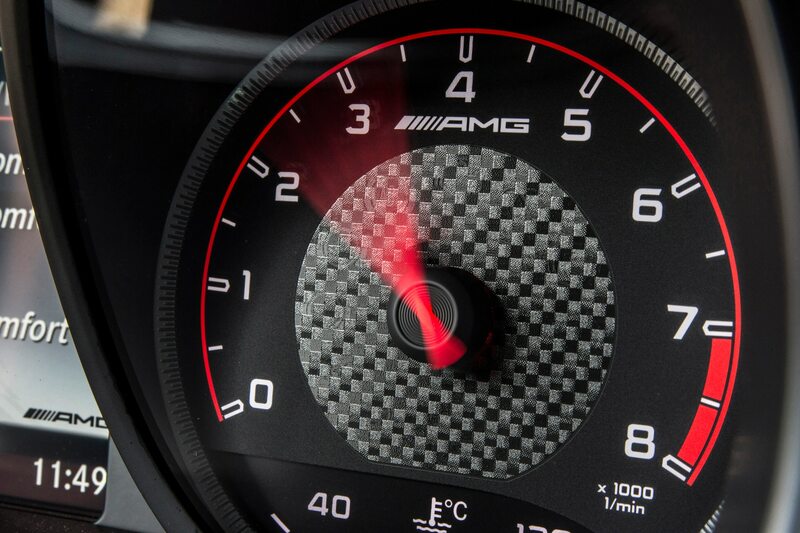 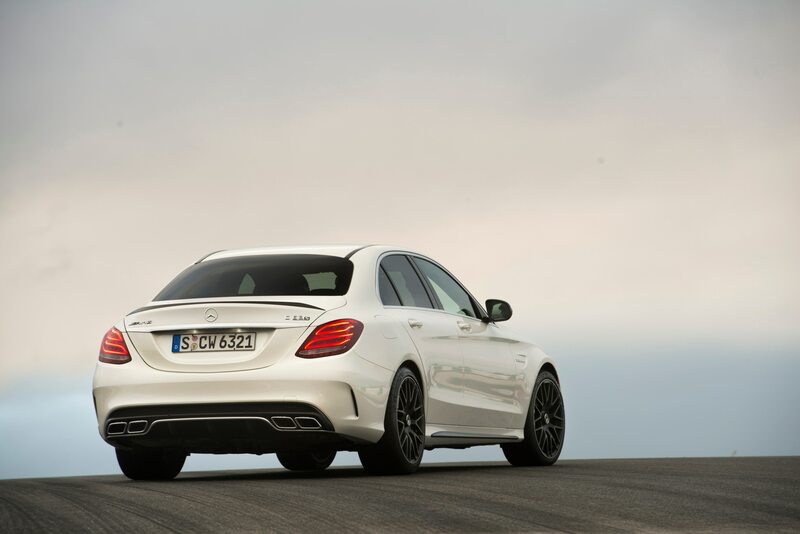 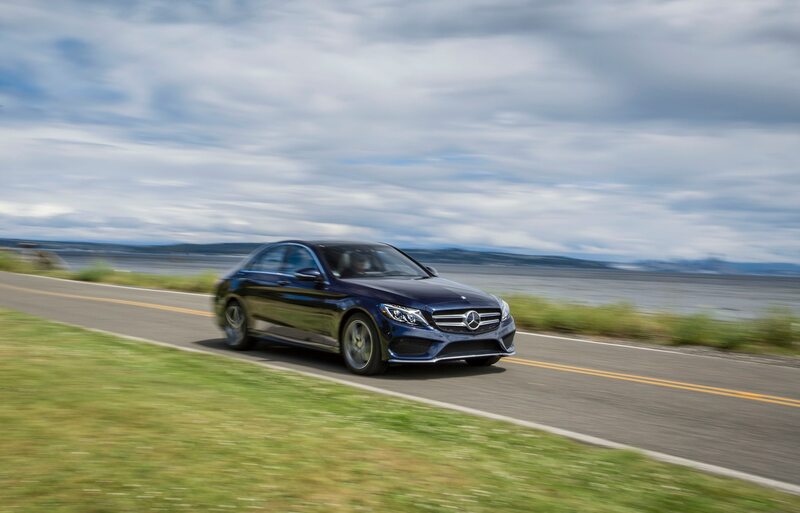 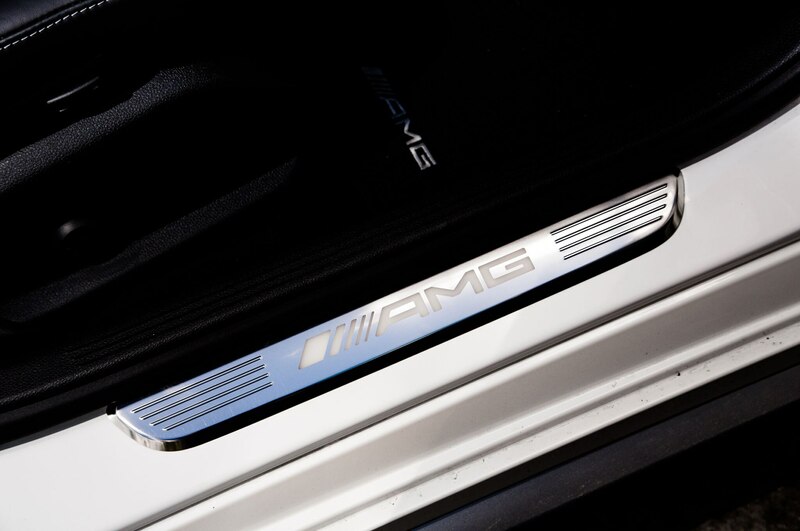 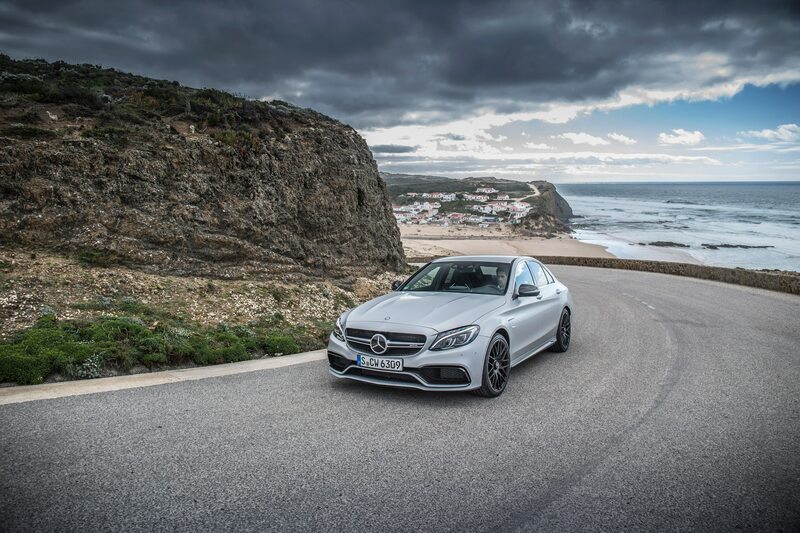 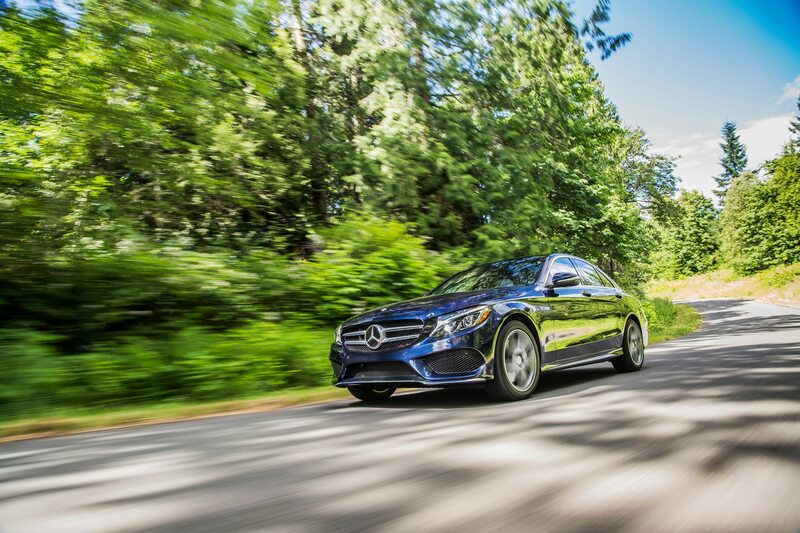 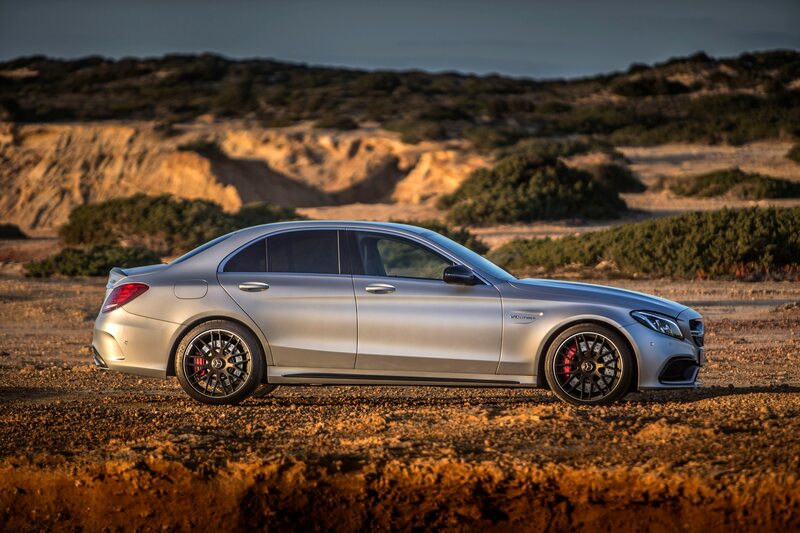 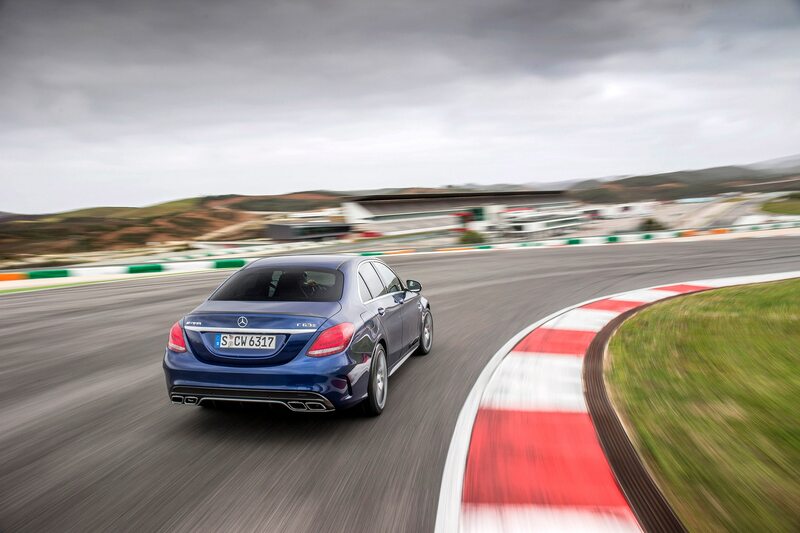 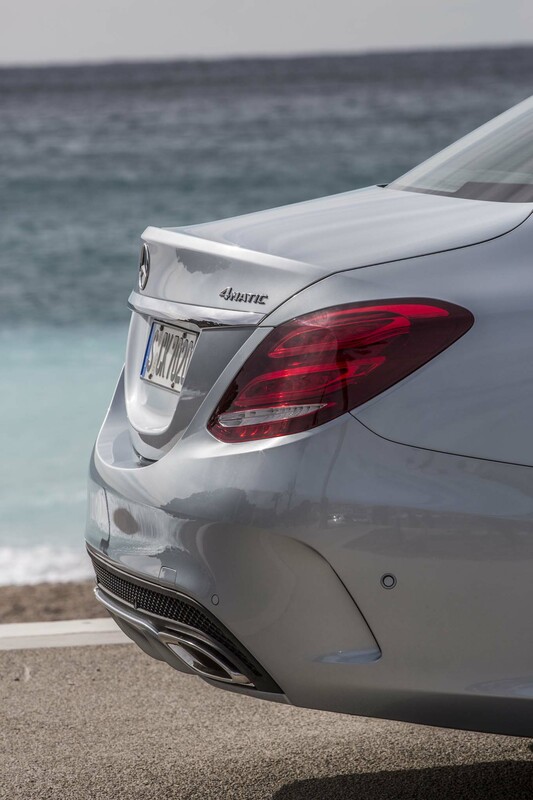 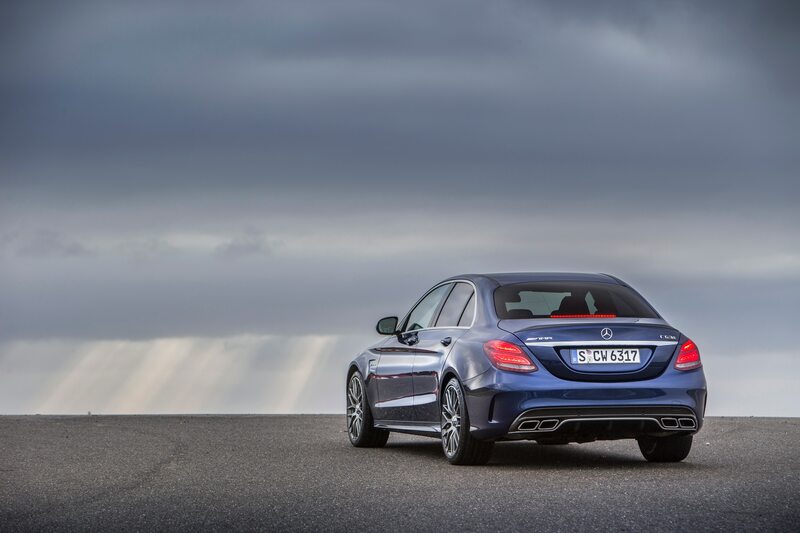 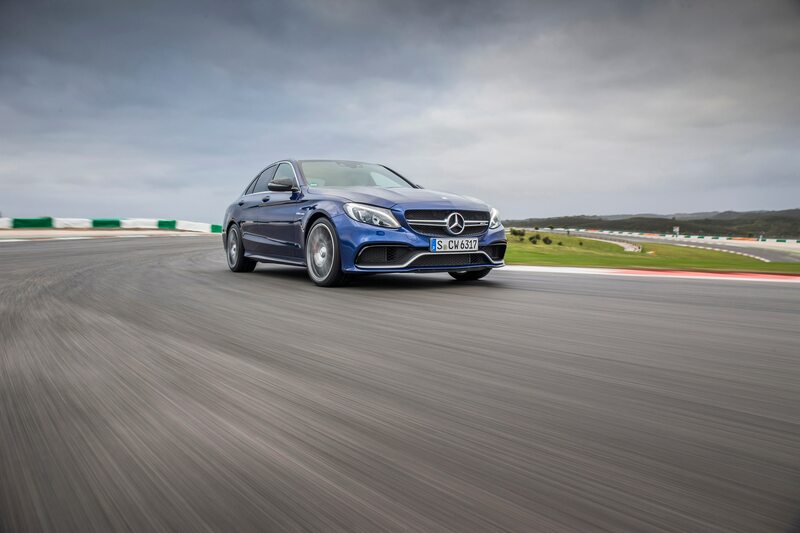 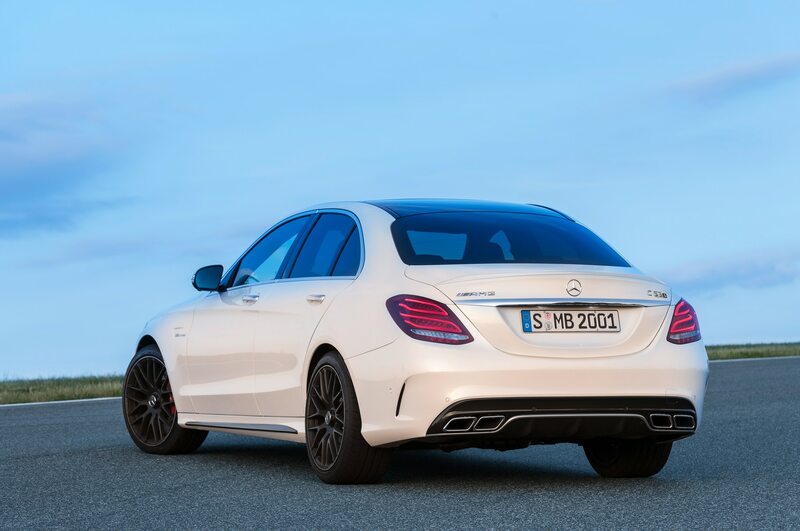 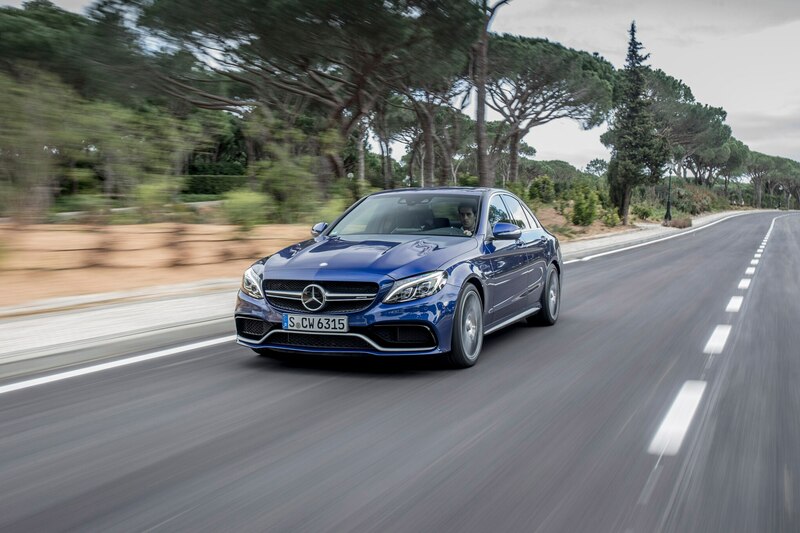 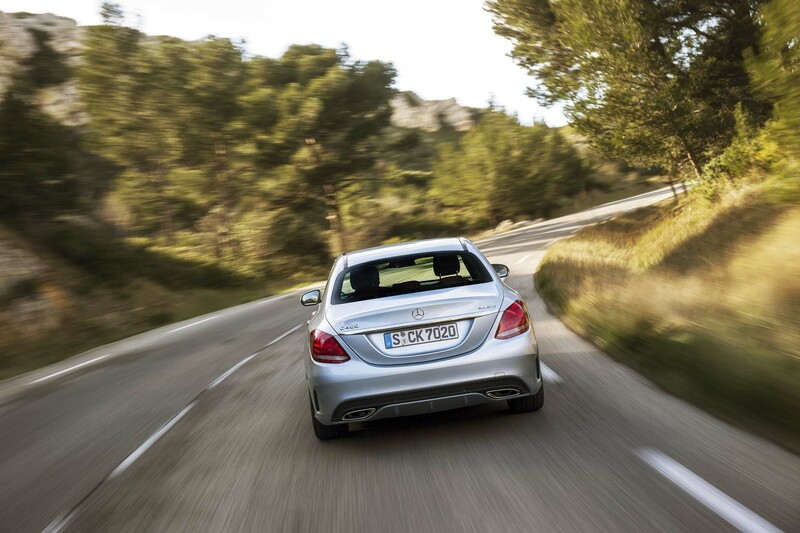 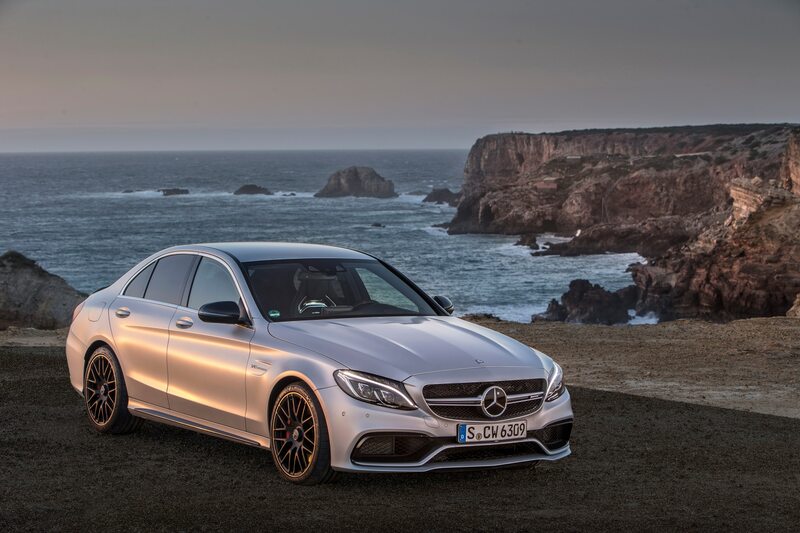 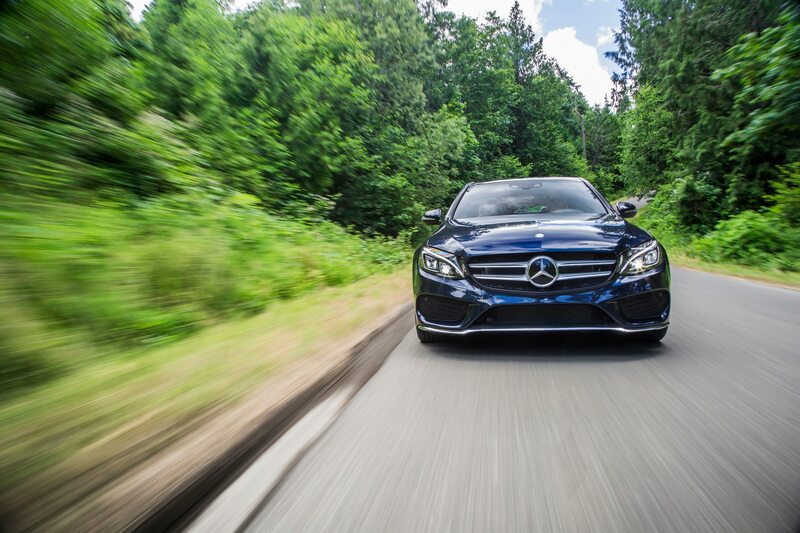 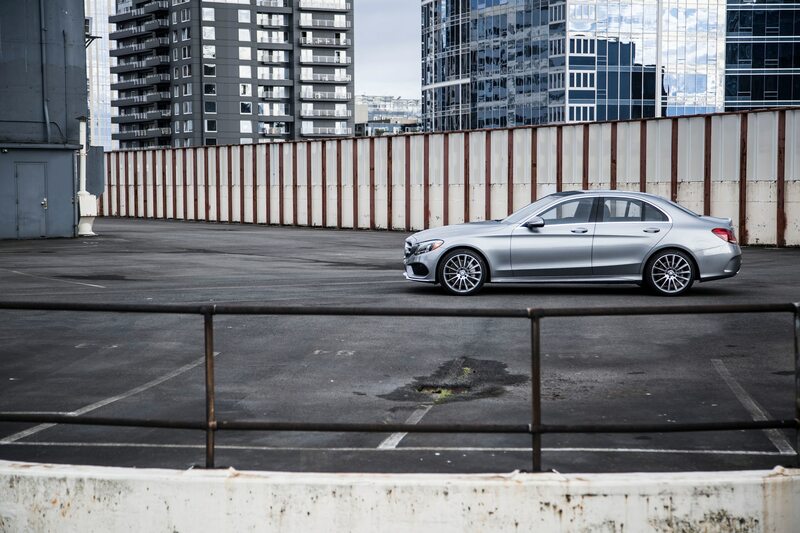 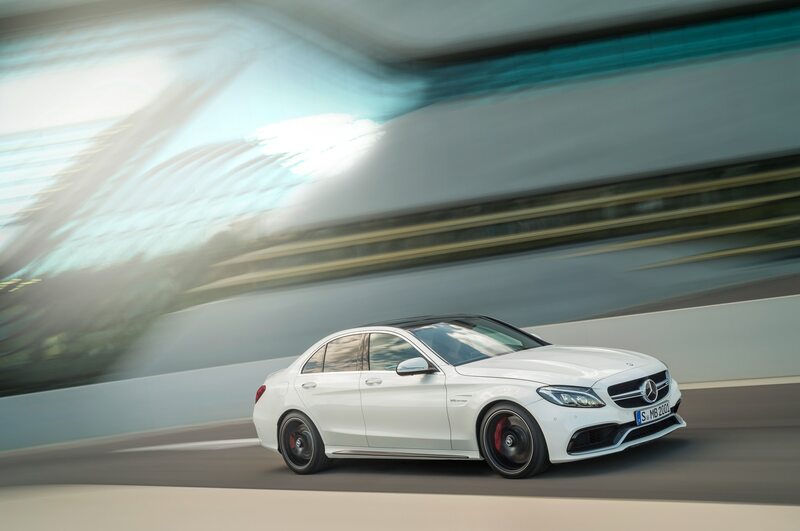 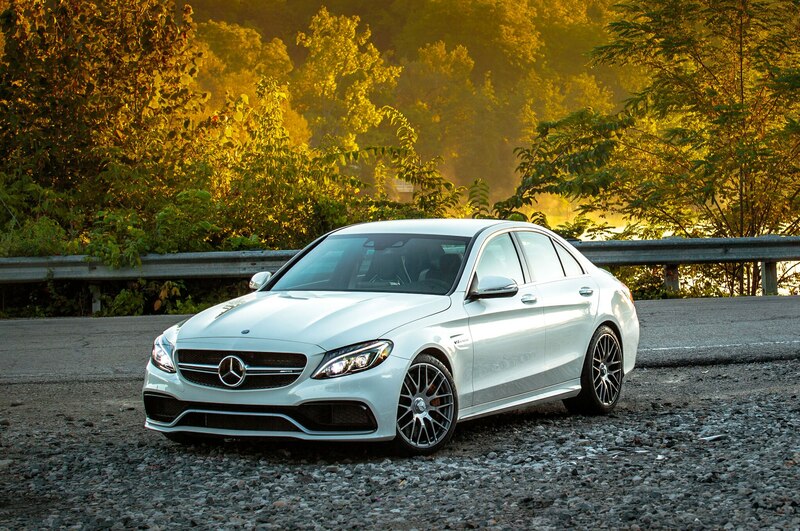 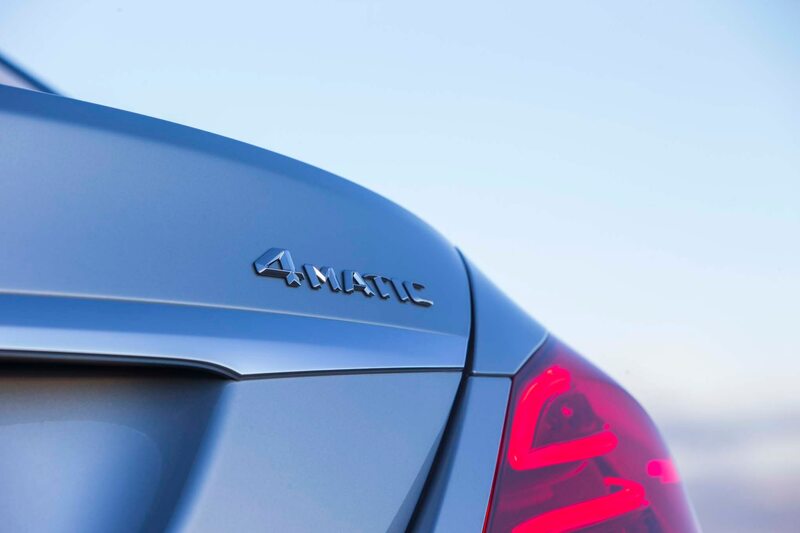 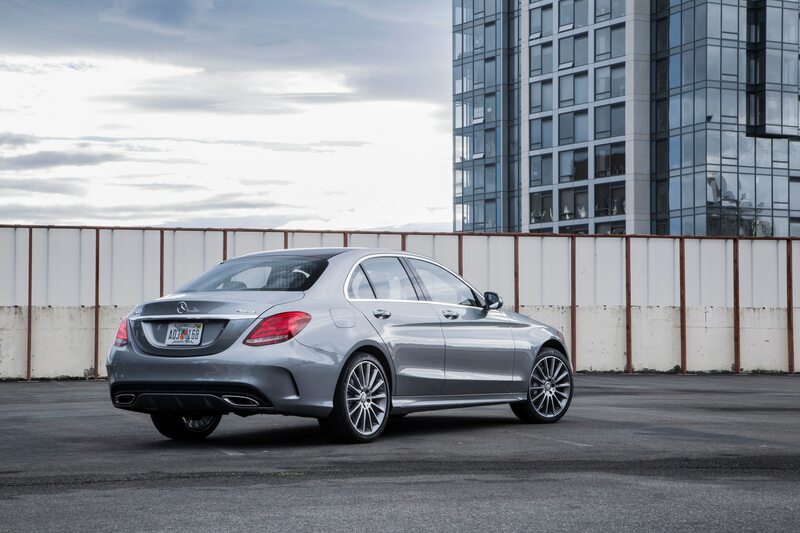 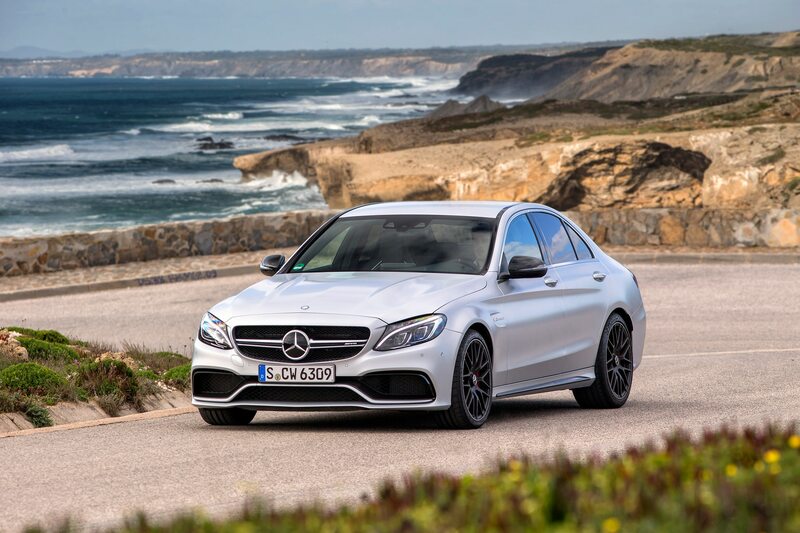 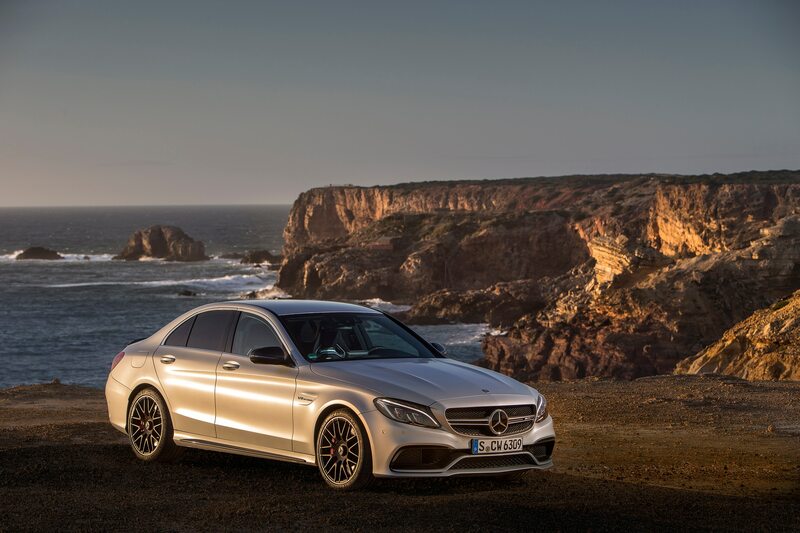 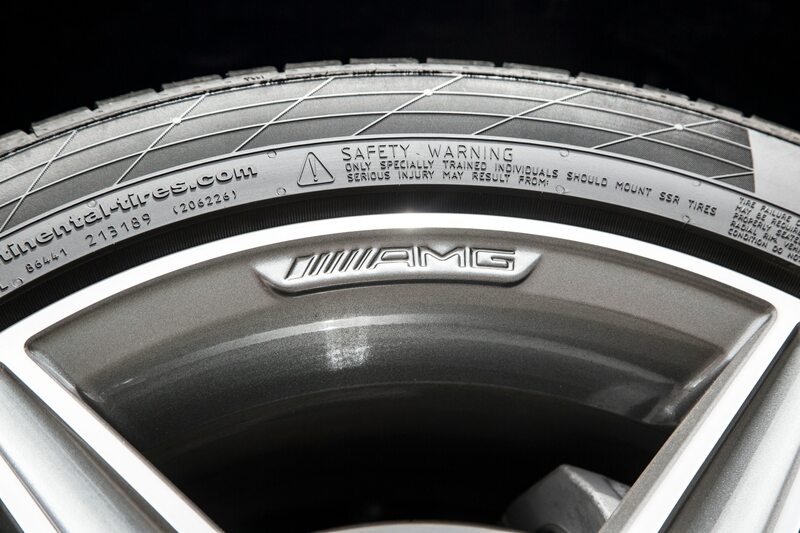 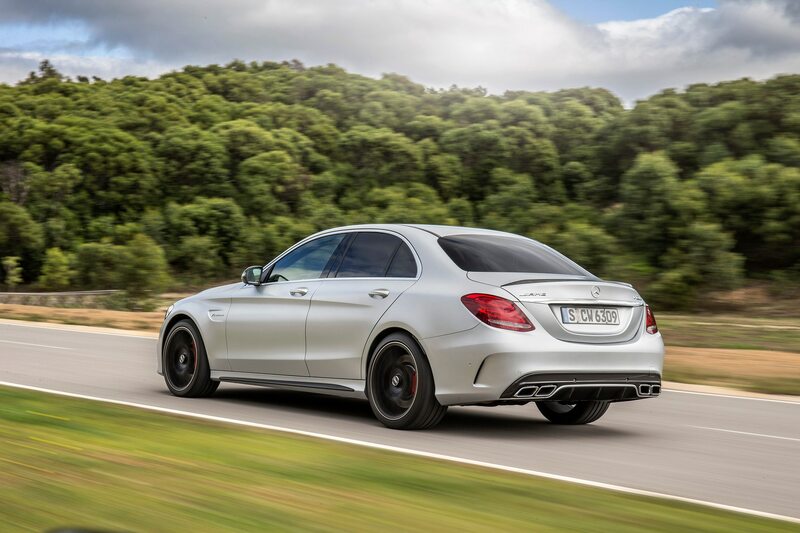 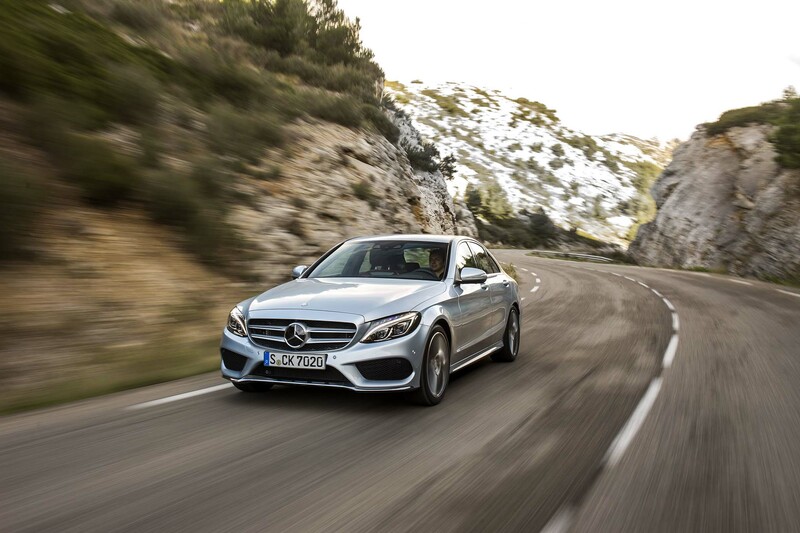 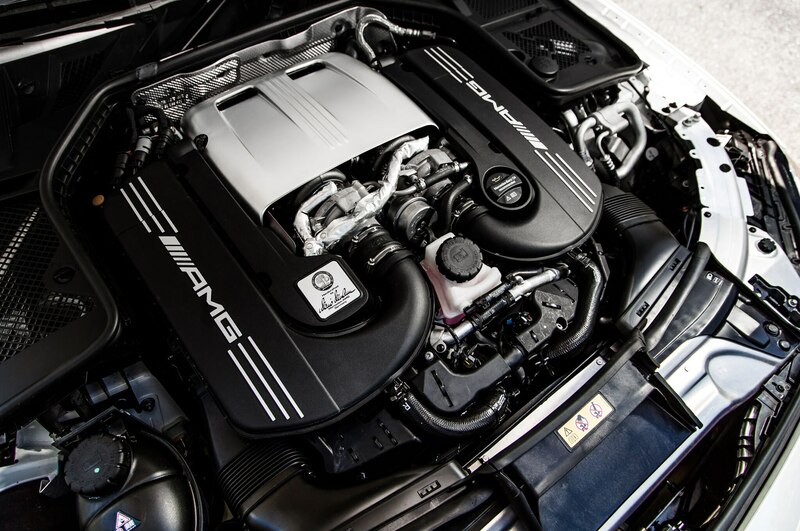 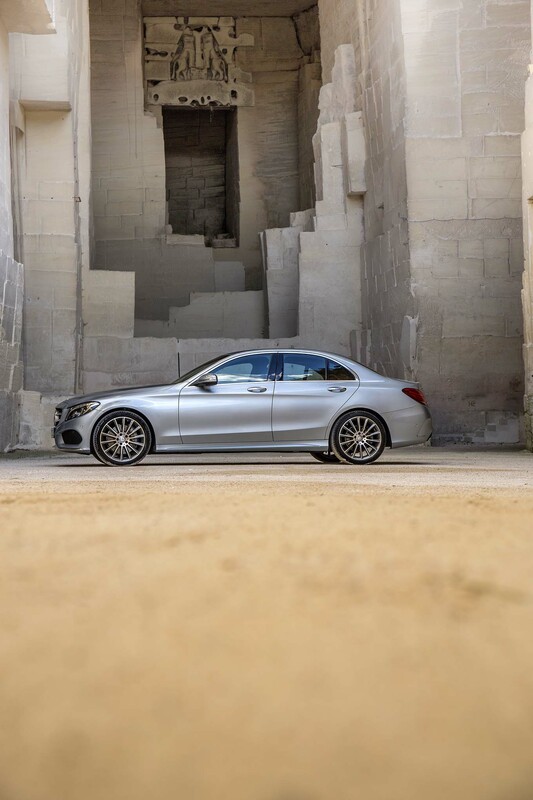 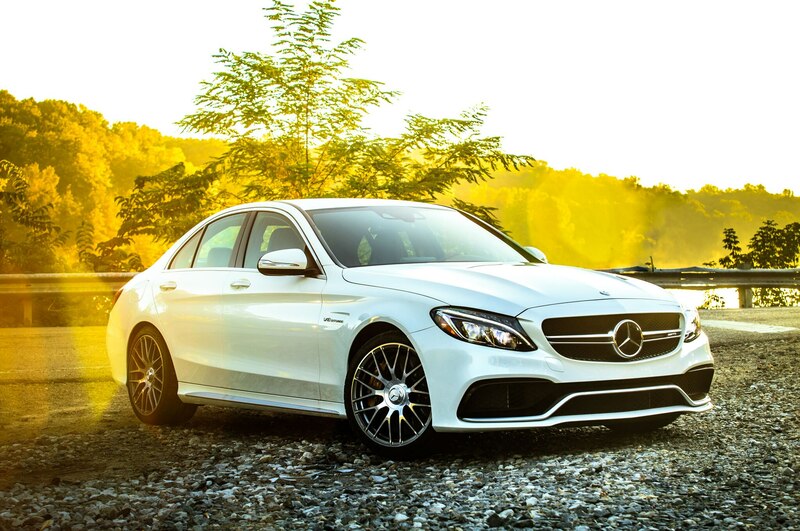 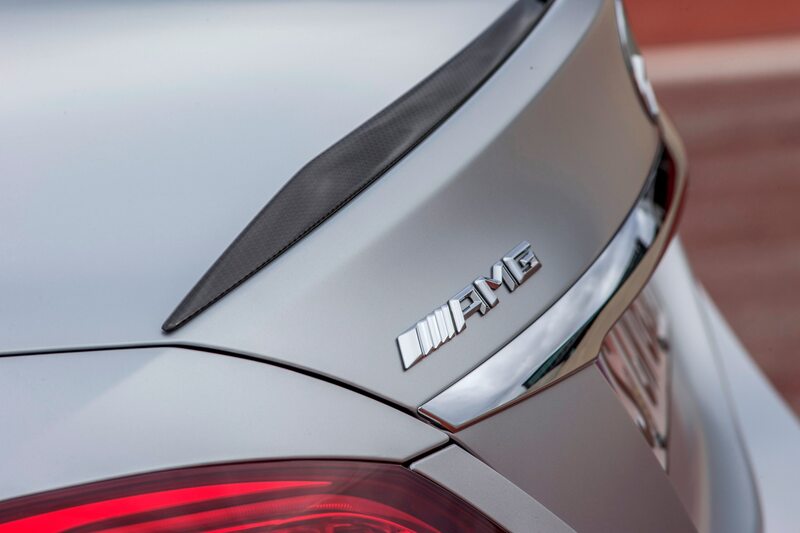 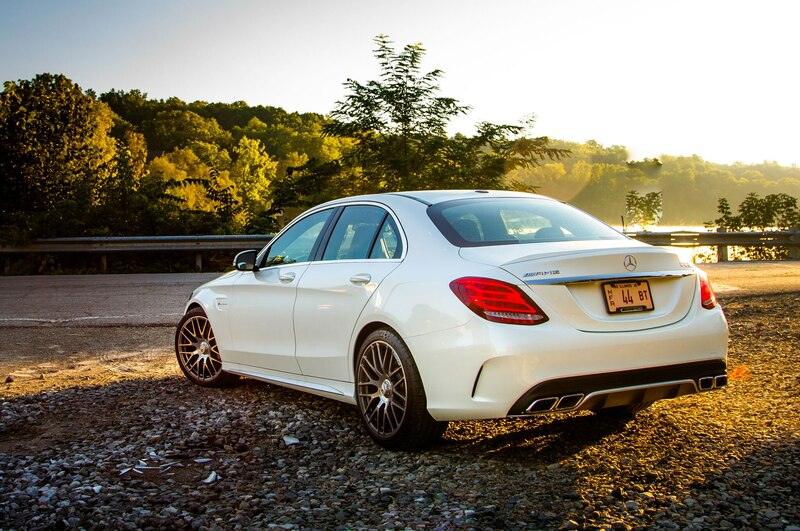 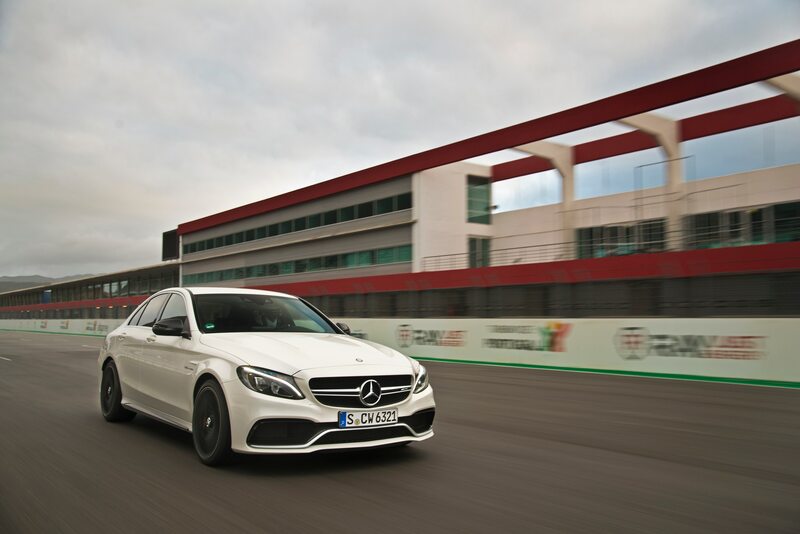 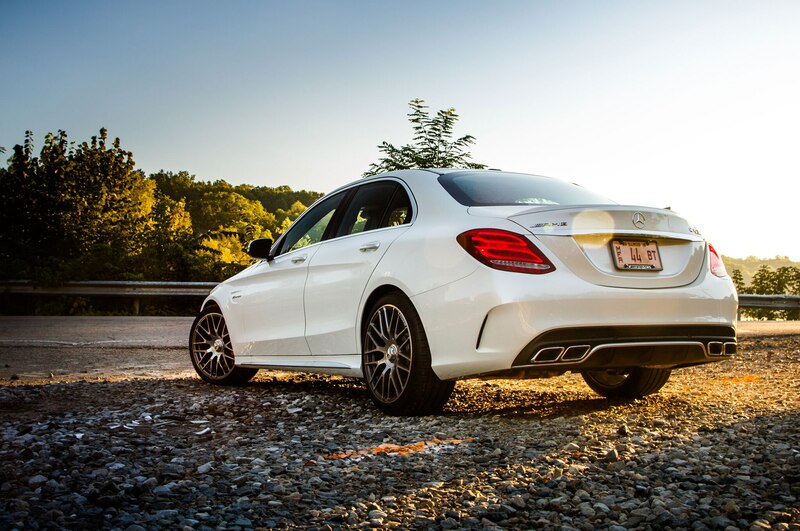 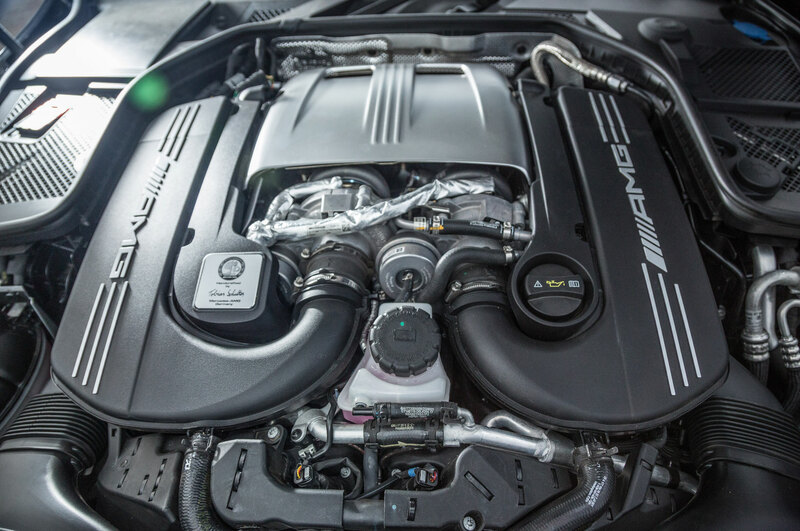 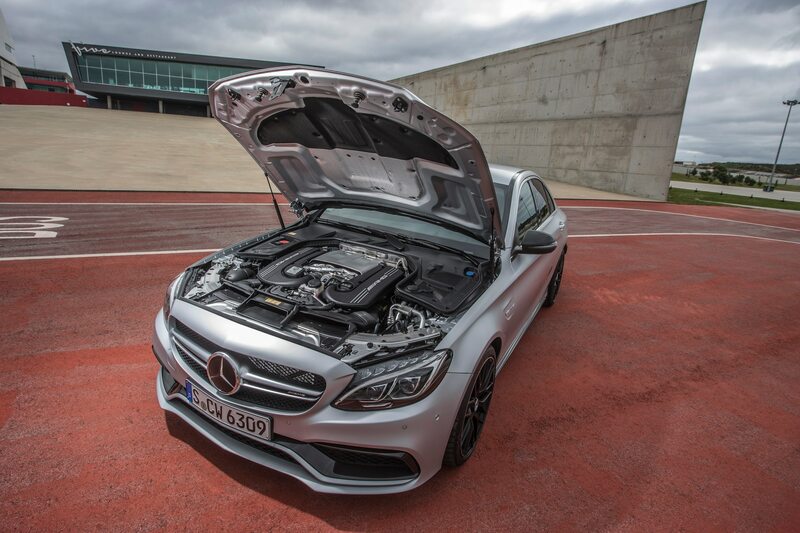 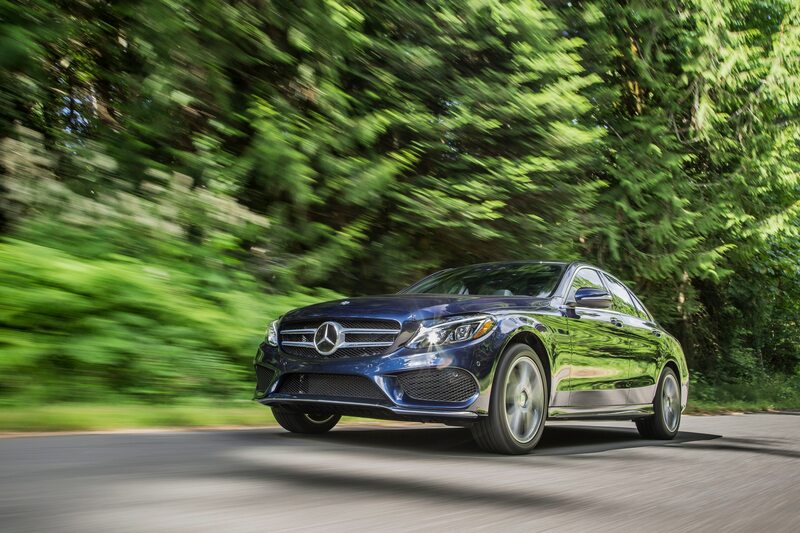 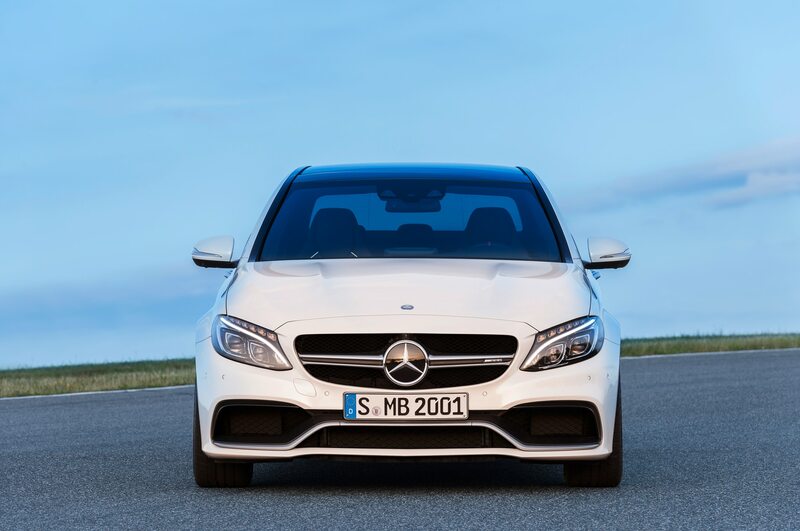 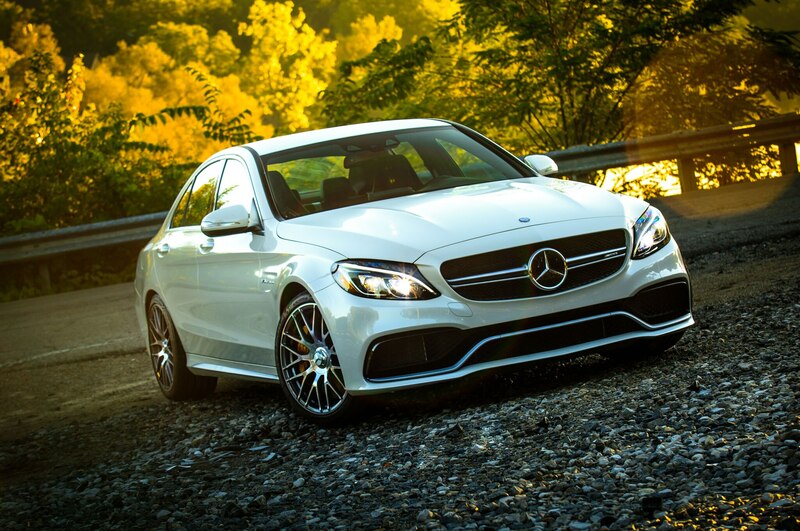 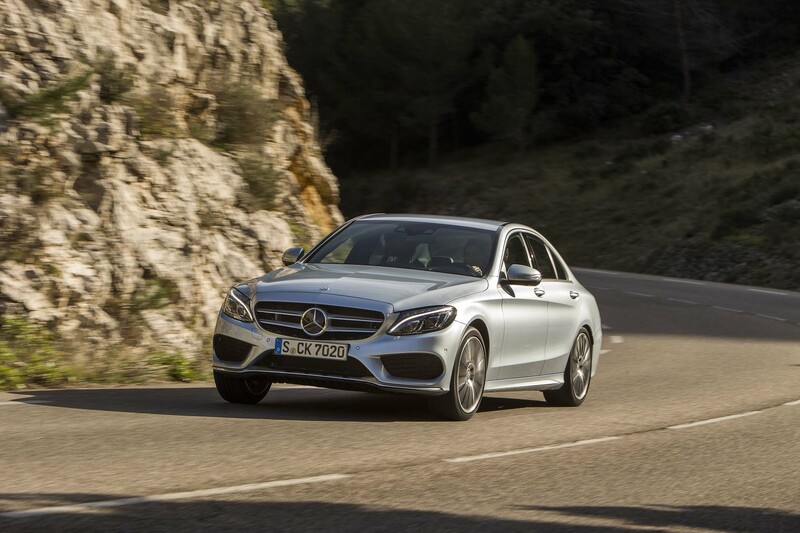 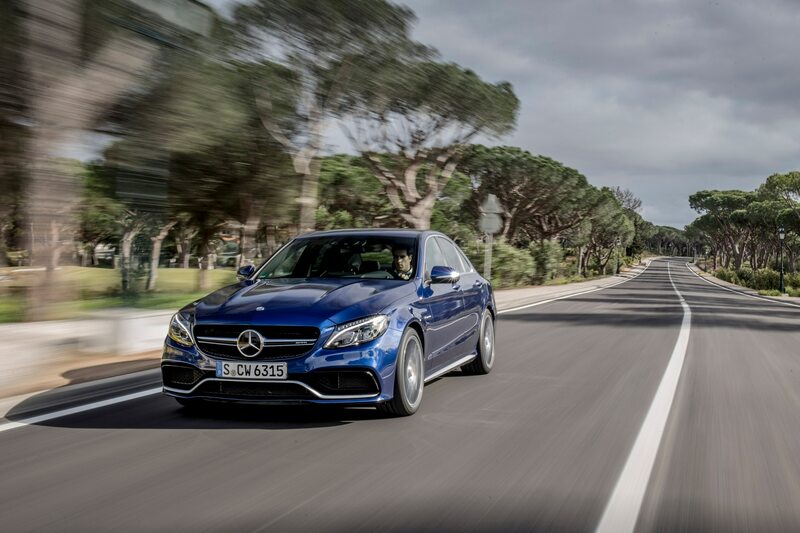 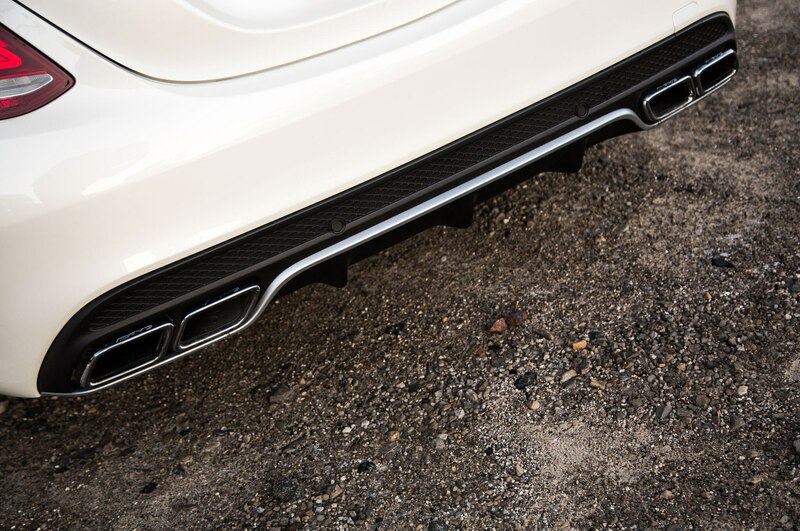 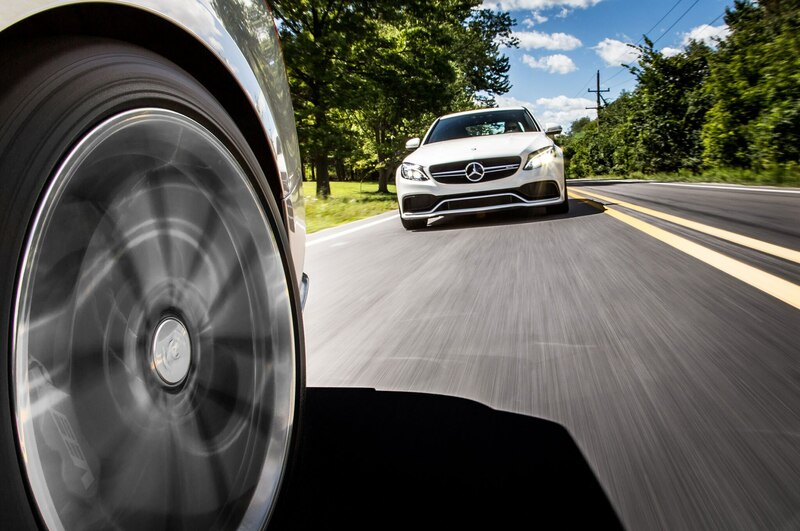 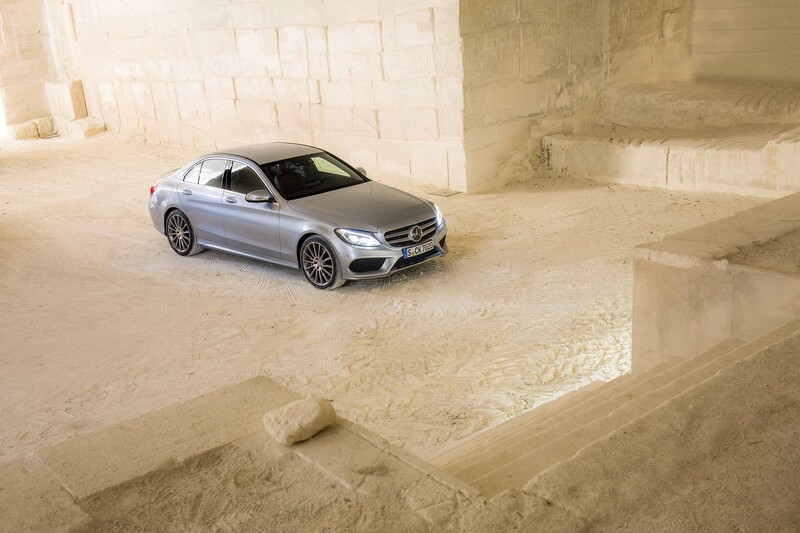 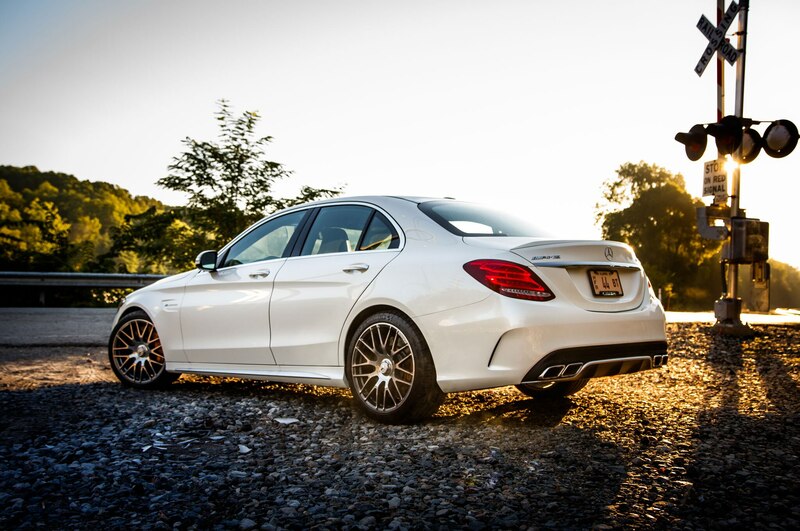 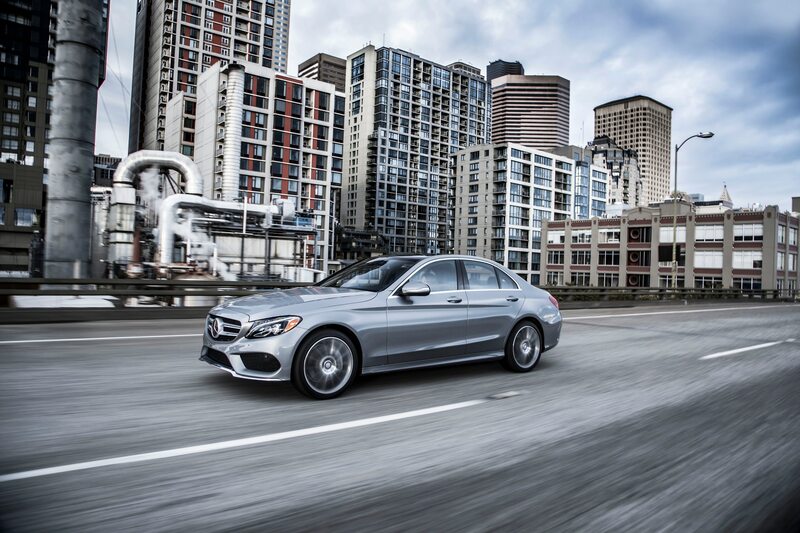 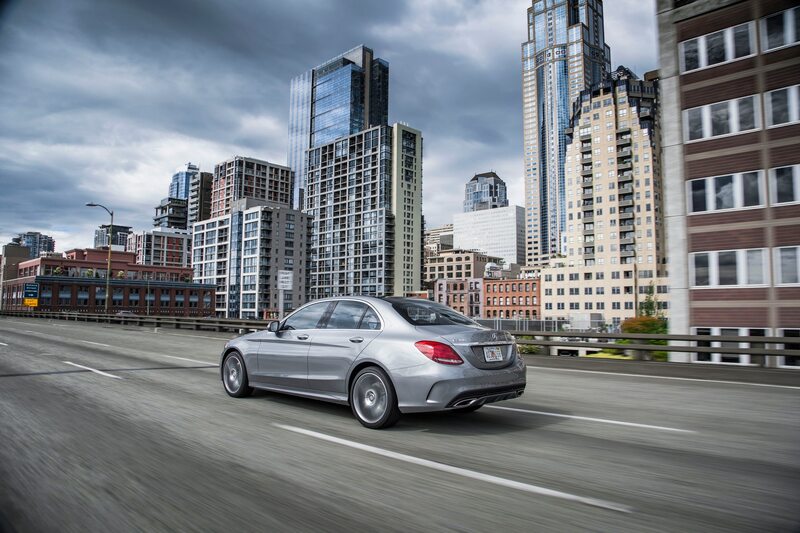 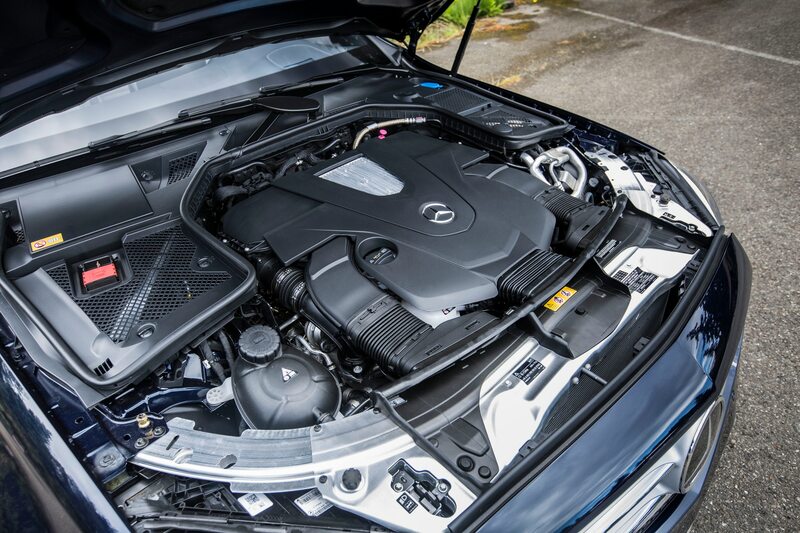 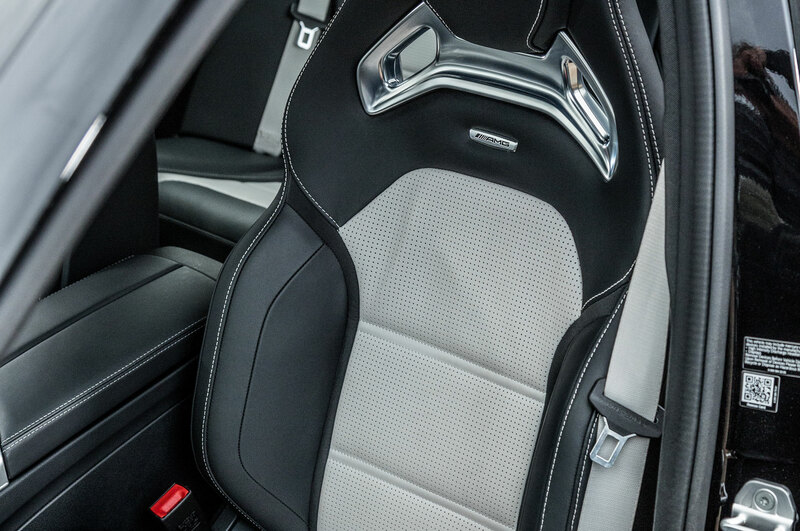 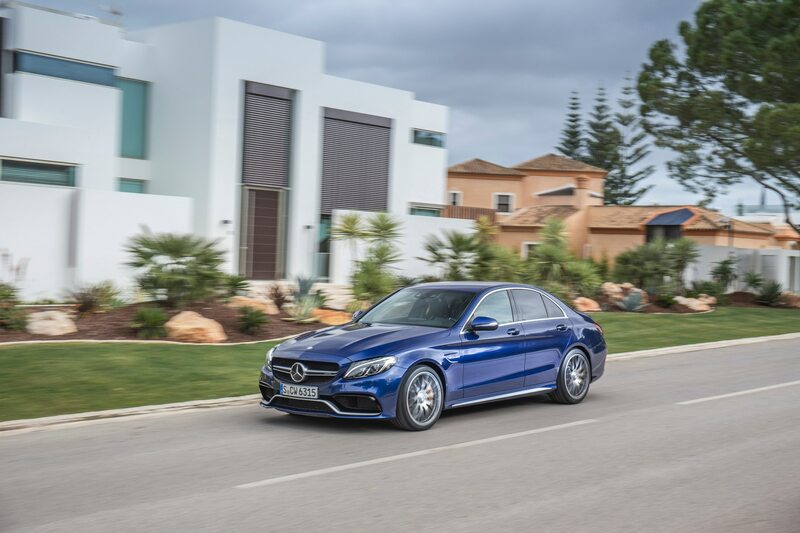 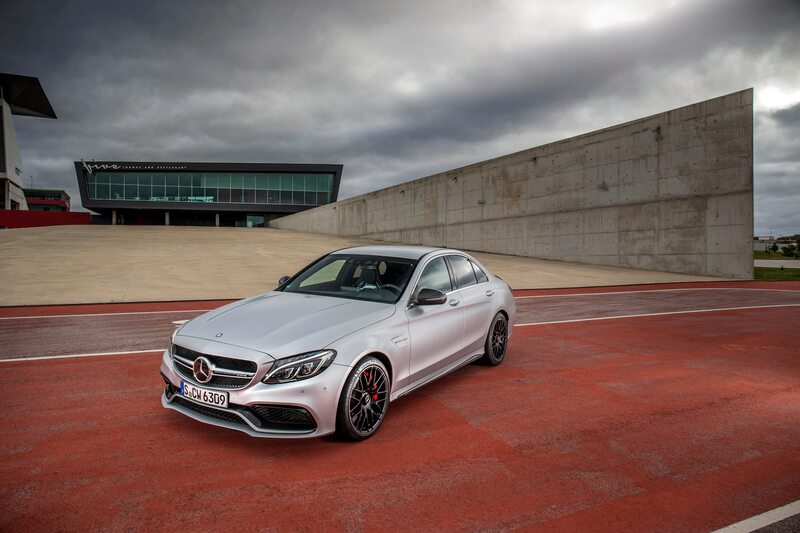 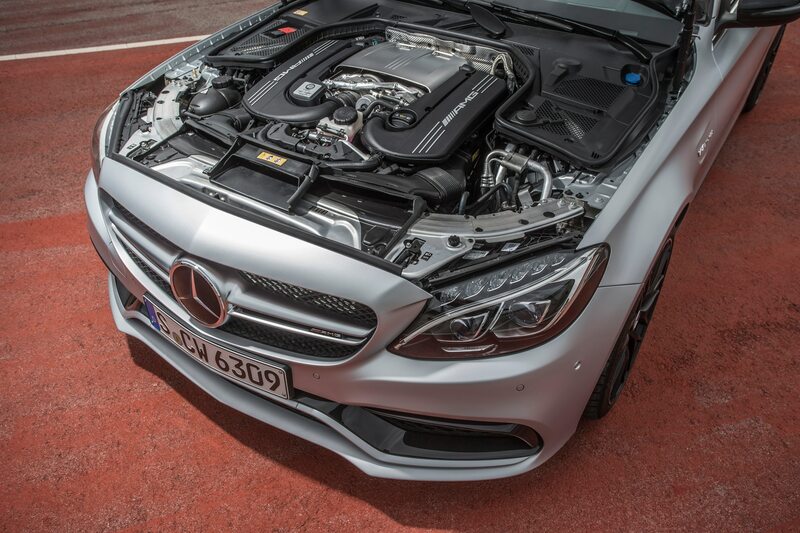 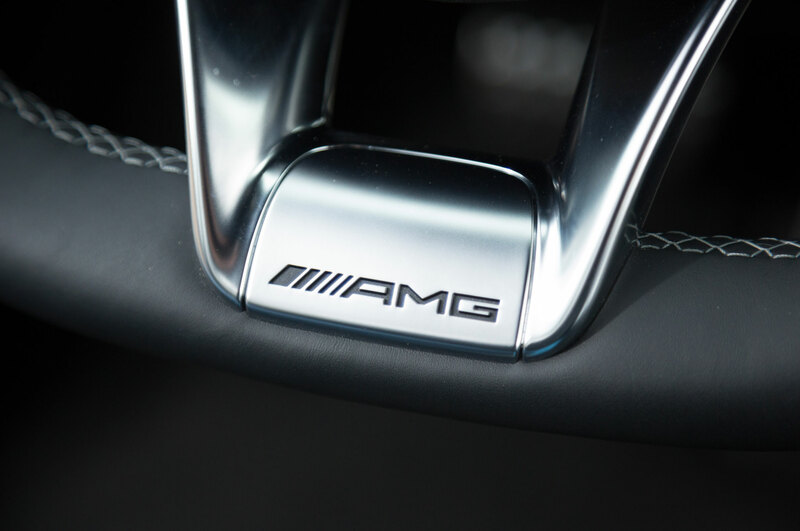 More boost means more power for the AMG sedan. 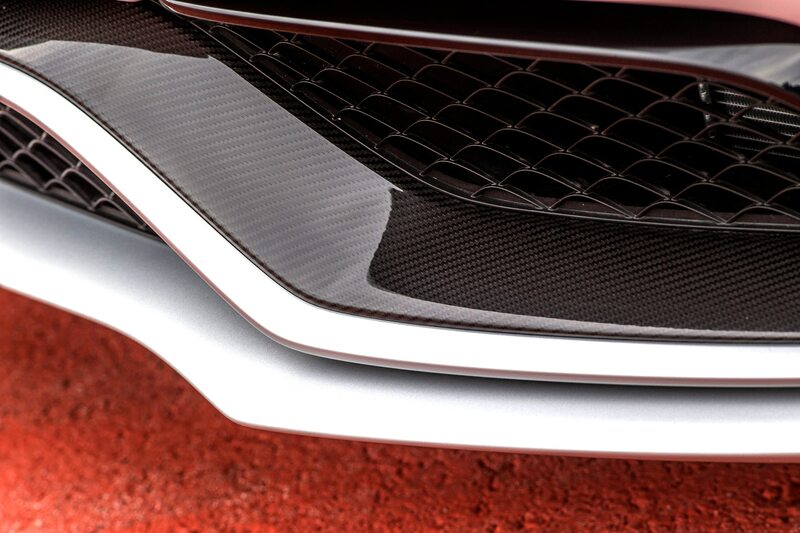 Getting closer to the car's full reveal.